The De Tomaso Pantera was a mid-engined sports car penned in 1970 by Tom Tjaarda, a designer at the automotive design firm of Ghia in Turin, Italy. 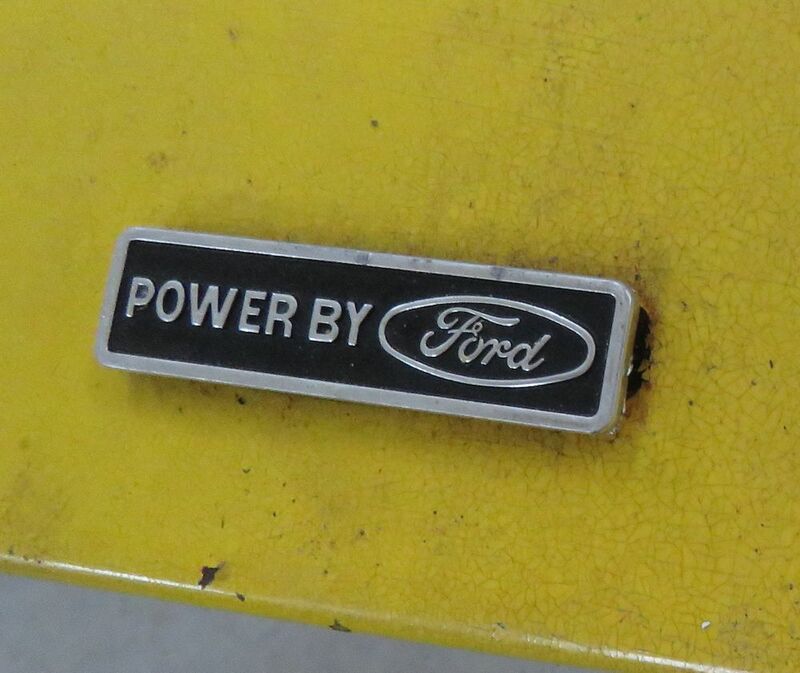 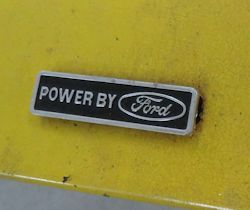 They were powered by high performance Ford V8 engines and sold in the US between 1971 and 1975 through the Ford Motor Company’s dealership network. 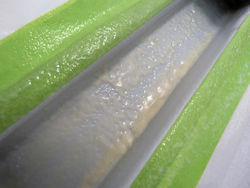 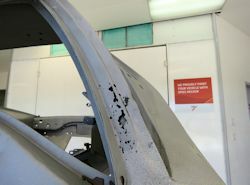 Unfortunately, the cars suffered from extremely poor build quality, quickly earning a reputation for horrendous reliability issues. 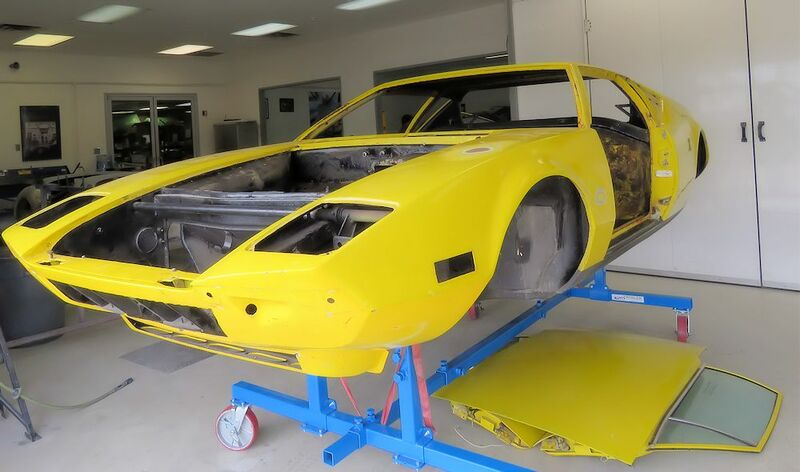 Elvis Presley famously shot his De Tomaso Pantera when it wouldn’t start! 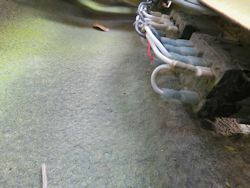 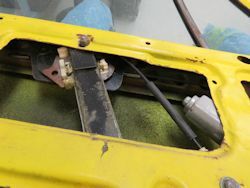 Probably the biggest problem with the Pantera was its fragile electrical architecture. 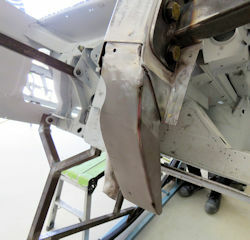 Having said that, when running well, they were very high performance machines for the period. 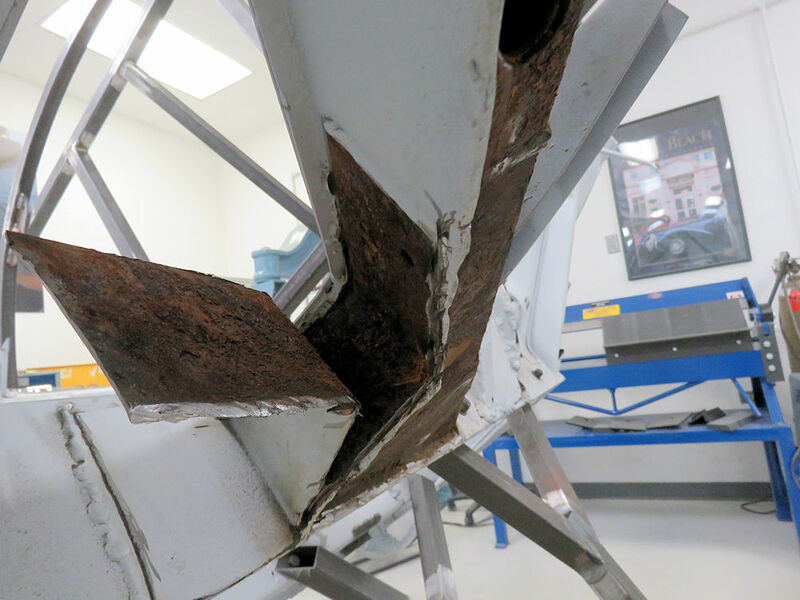 Despite the poor build quality and legendary unreliability, more than 7,000 Panteras were sold. 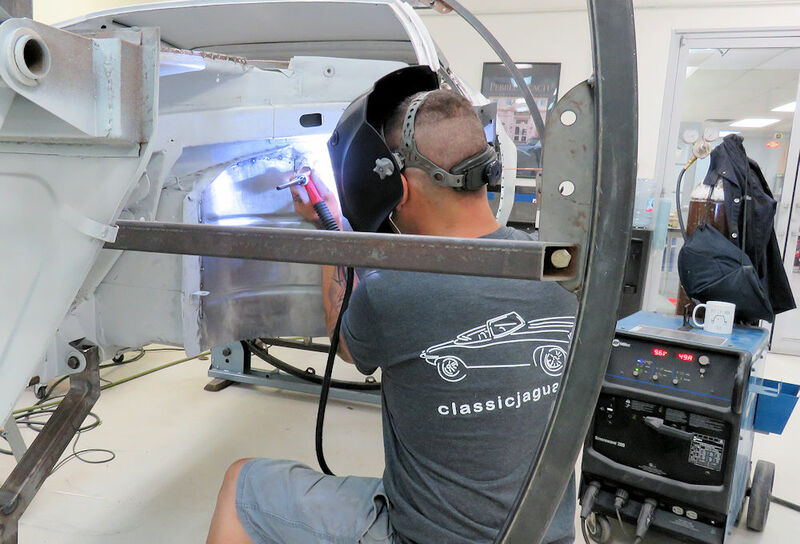 With the earliest models now very nearly fifty years old, they enjoy a loyal following in the classic car arena. 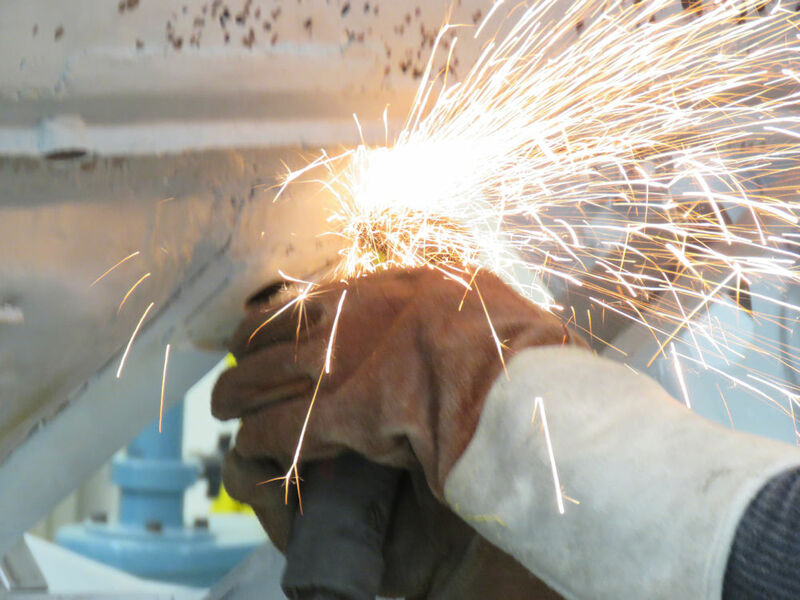 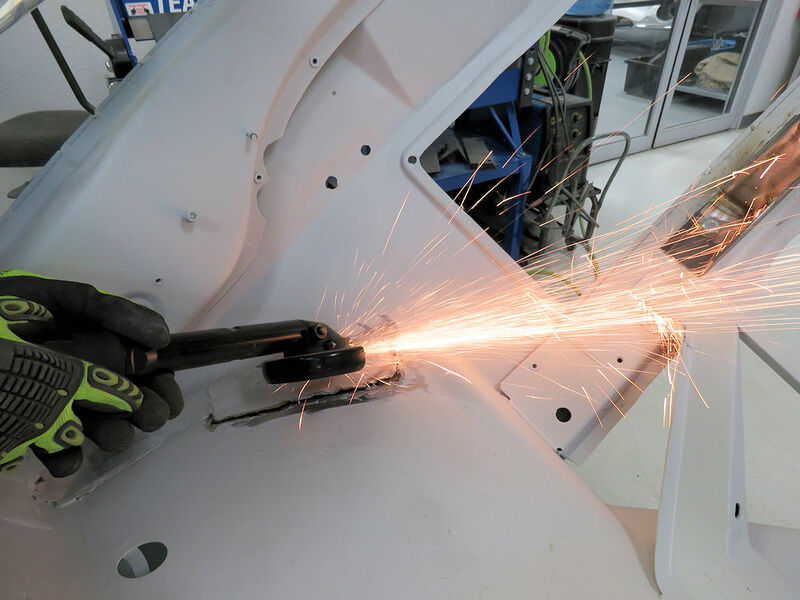 Over the years, owners and specialist aftermarket firms have developed a host of much needed reliability upgrades, particularly with respect to the electrical systems. 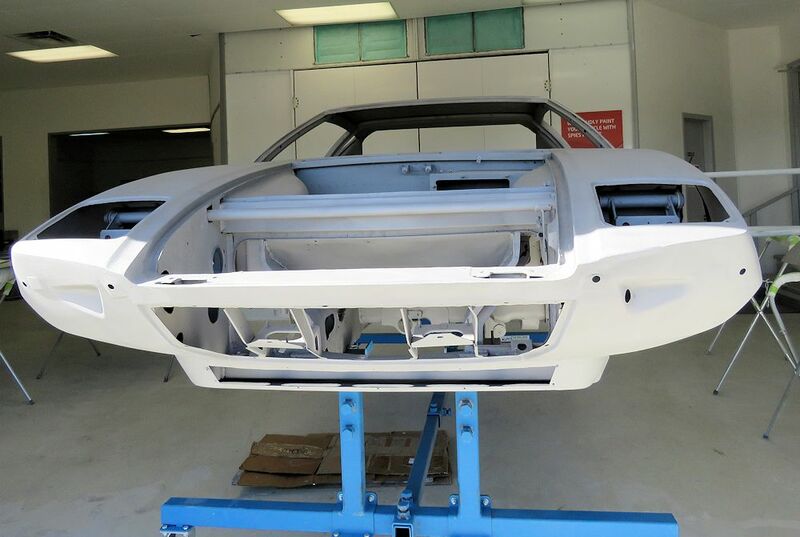 Panteras are commonly modified and customized by their owners, perhaps more than any other classic car. 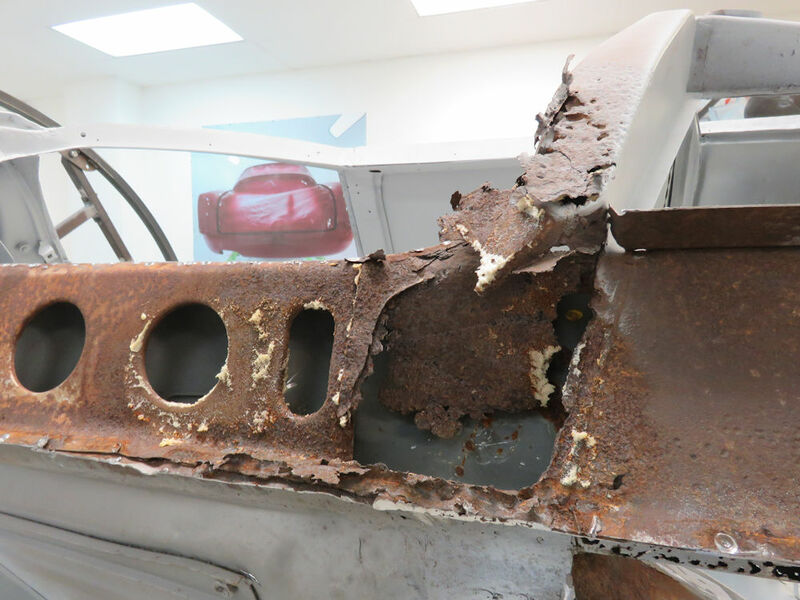 In some collector car circles, any departure from ‘originality’ is frowned upon. 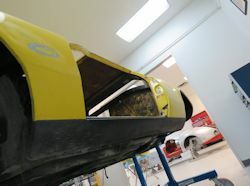 This is not the case in the Pantera community, where customization is the norm. 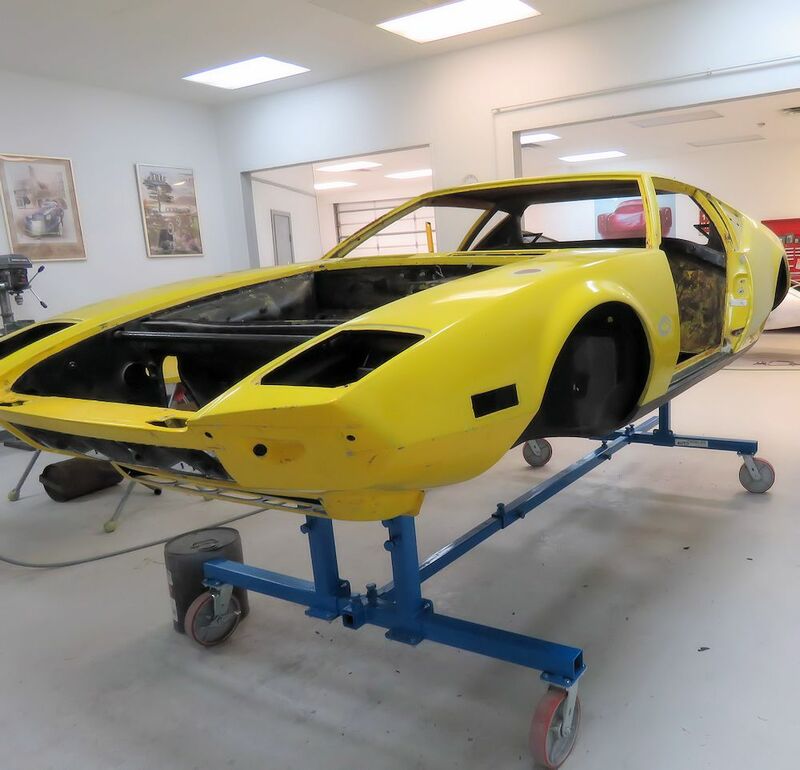 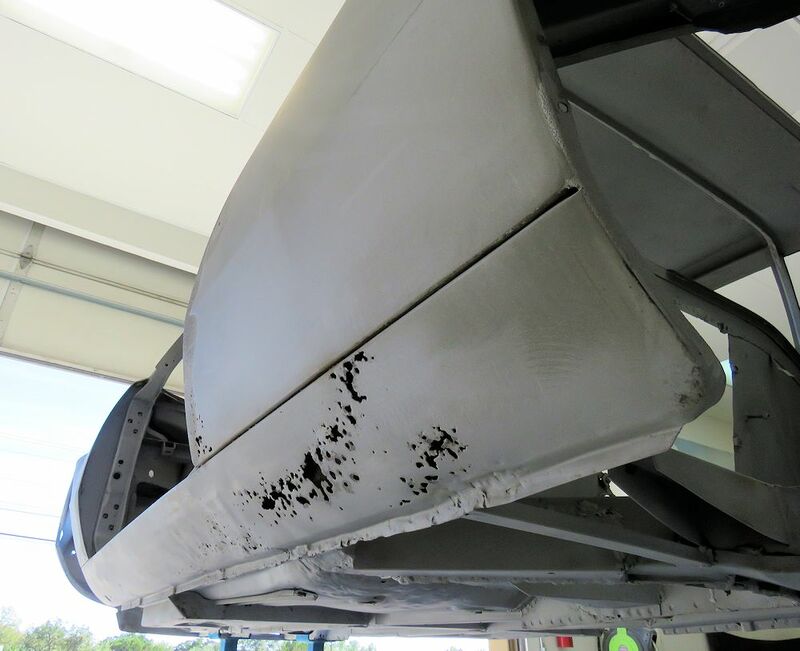 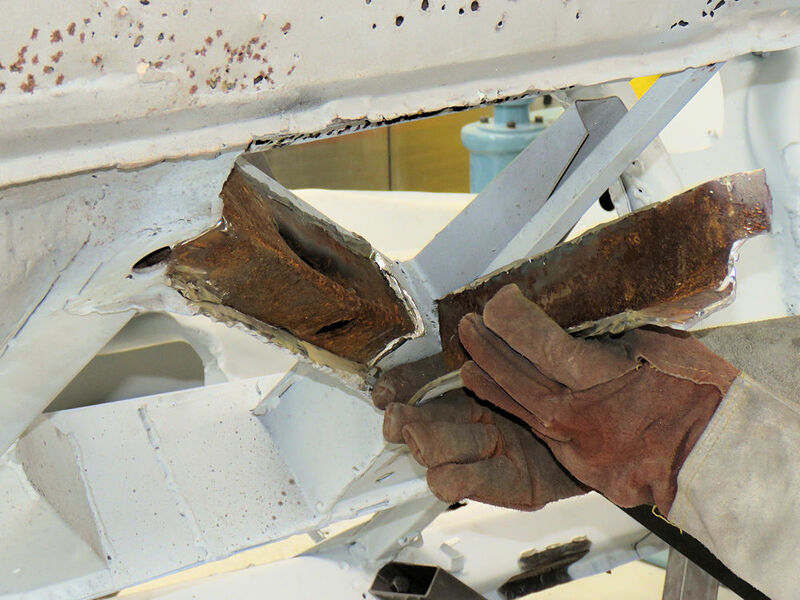 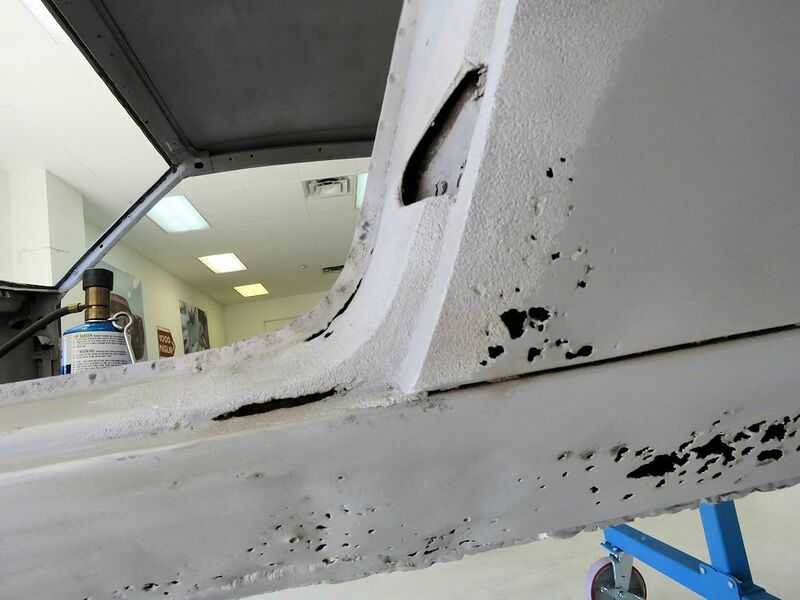 The subject of this restoration log is a 1971 De Tomaso Pantera owned by one of the most successful Ford dealerships in the South Western United States. 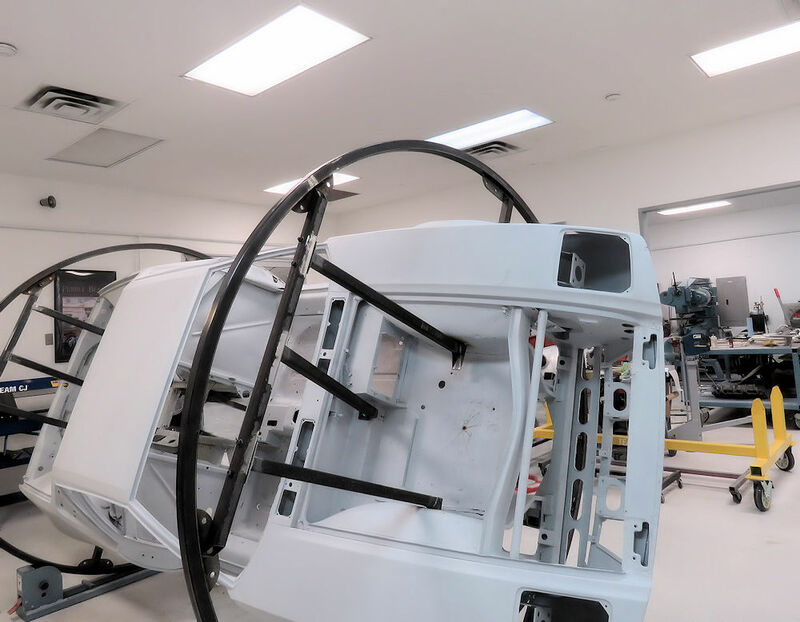 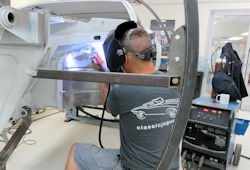 I am proud that Team CJ has been selected to build this very special Pantera, a car that will eventually be displayed in FMC showrooms alongside Ford’s latest models, effectively turning the clock back 45 years. The finished car will remain true to Tom Tjaarda’s original design. Aesthetically, other than a color change from yellow to black, it will look very much as it did when first built in 1971. Mechanically, however, everything will be significantly upgraded. It will feature a 640 HP 7L alloy engine courtesy of Ford Racing, as well as numerous performance and reliability upgrades. The result will be a stunning De Tomaso Pantera of virtually stock appearance, but one that is 100% reliable and among the fastest road legal Panteras in the world. 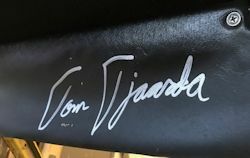 I was privileged to listen to the late Tom Tjaarda talking about his Pantera design a couple of years ago at the Concours Italiano event in Monterey, California. 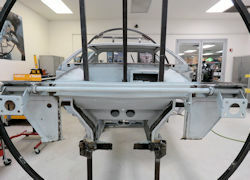 It is my sincere hope that our finished car is something of which the great man would have approved. 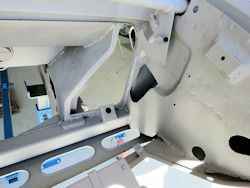 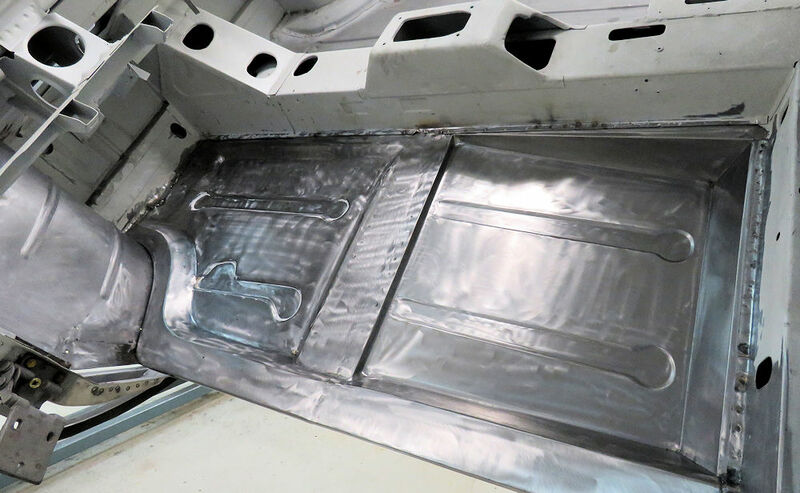 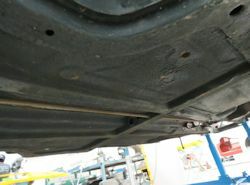 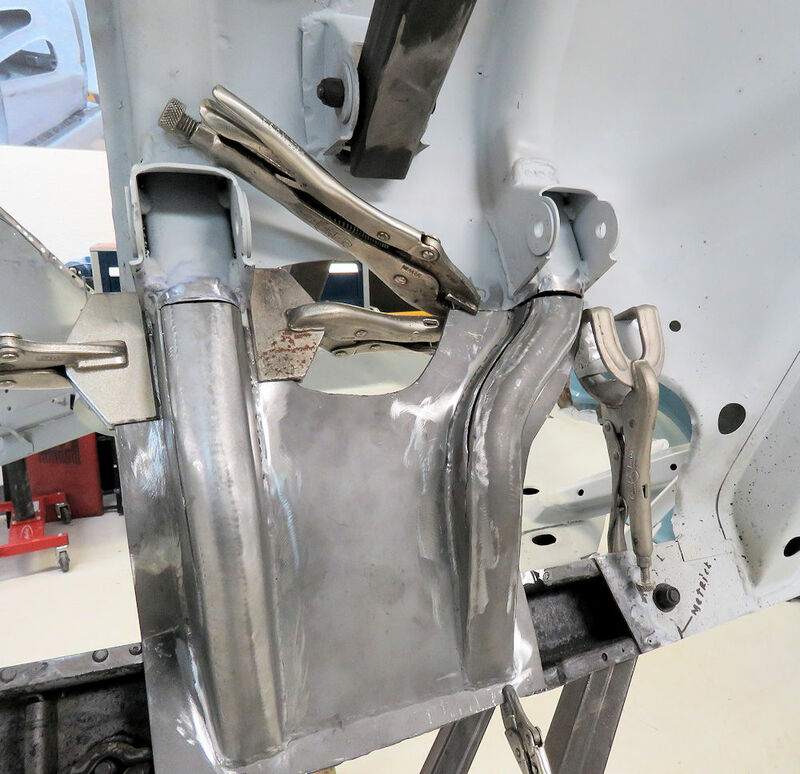 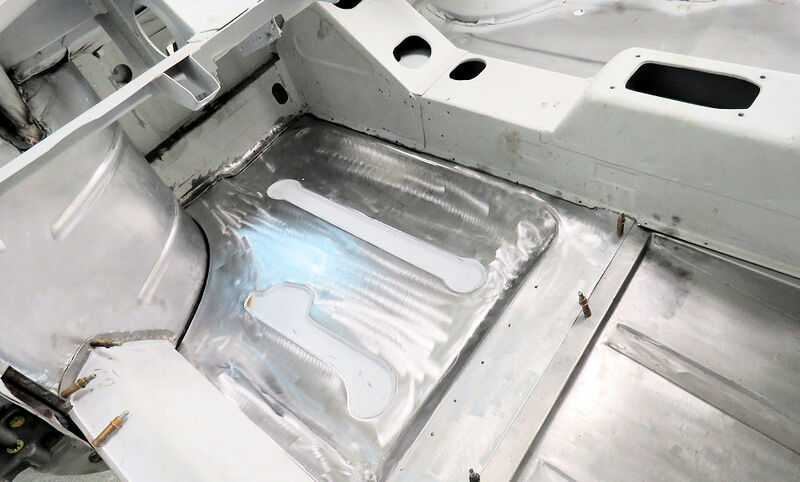 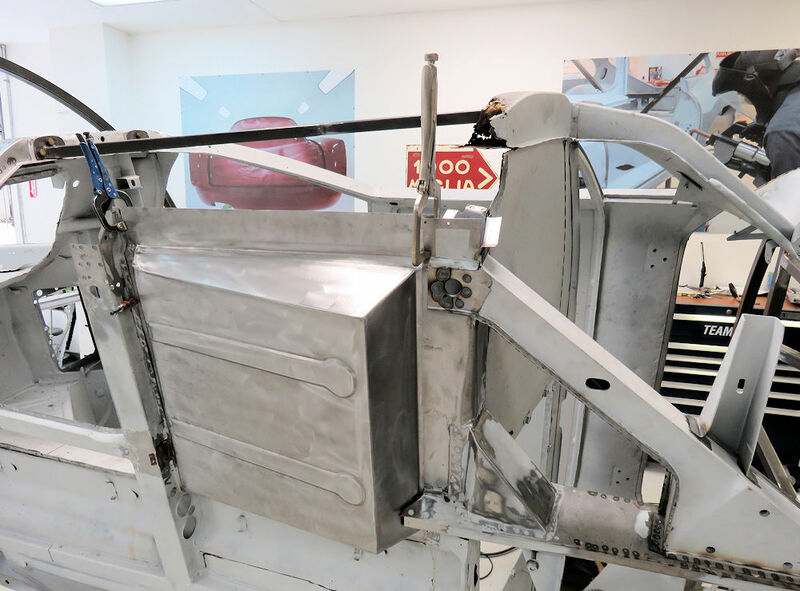 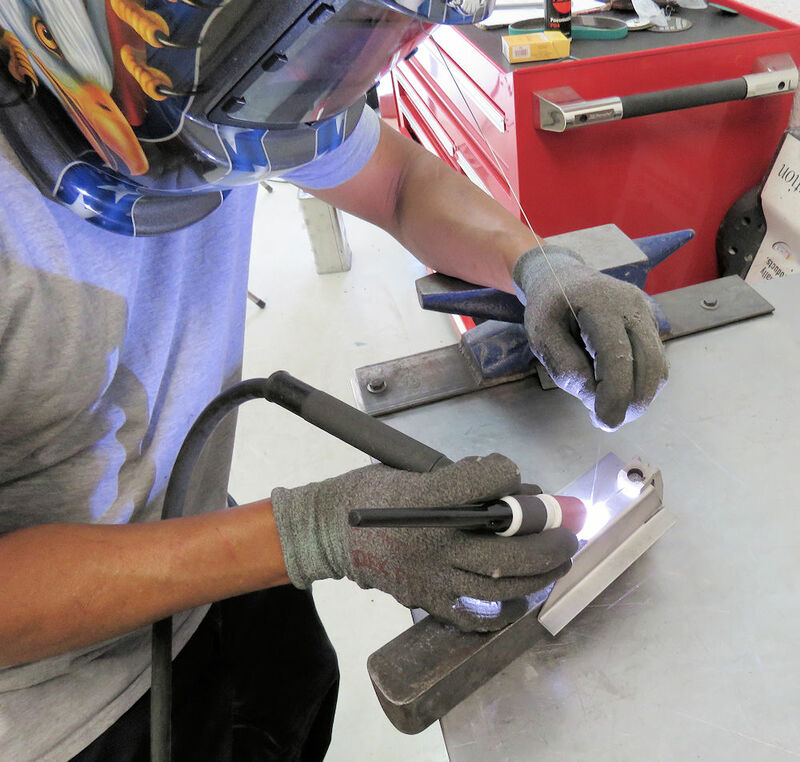 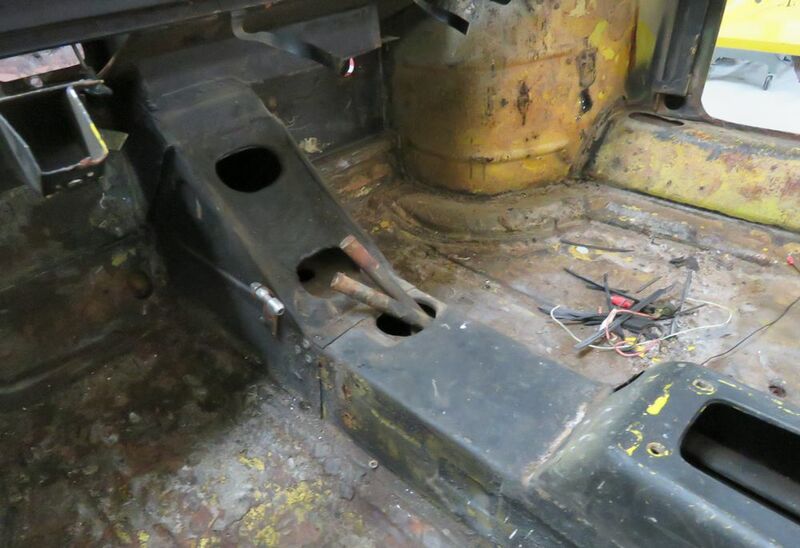 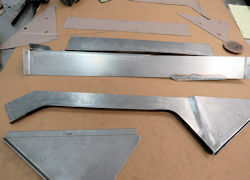 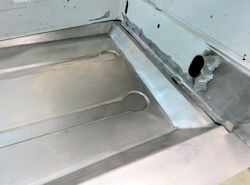 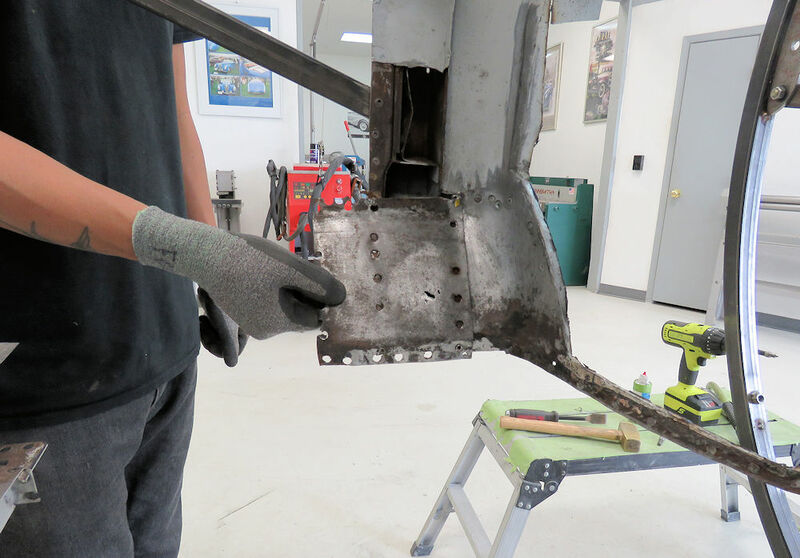 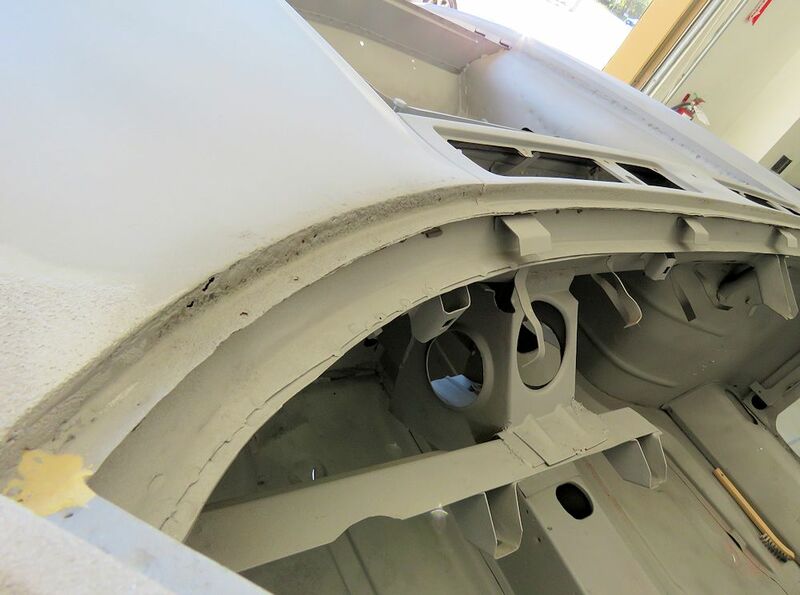 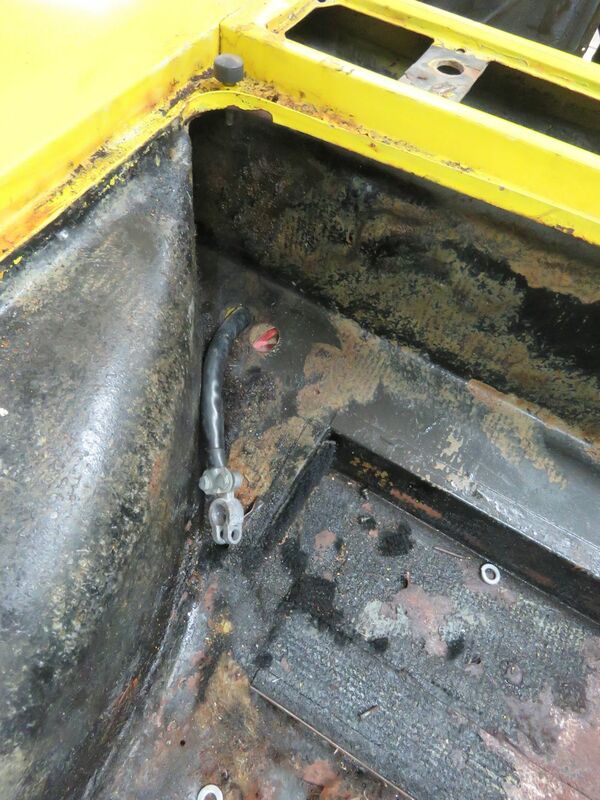 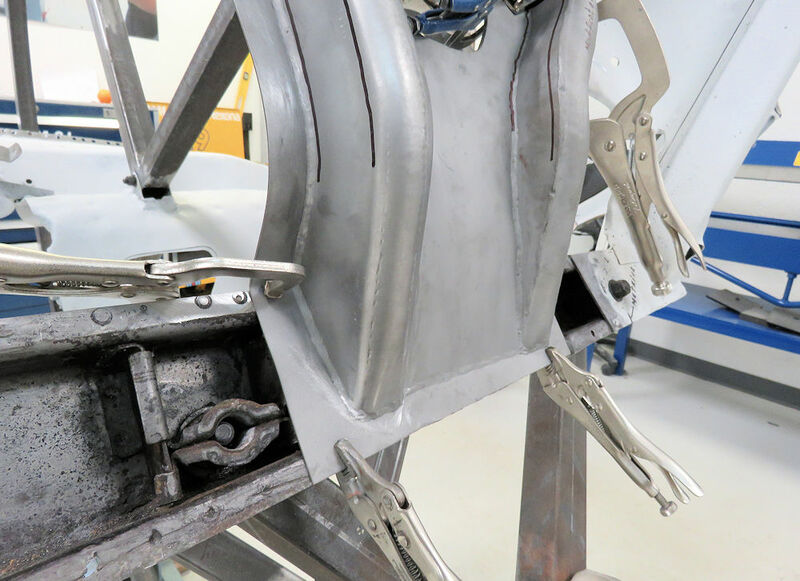 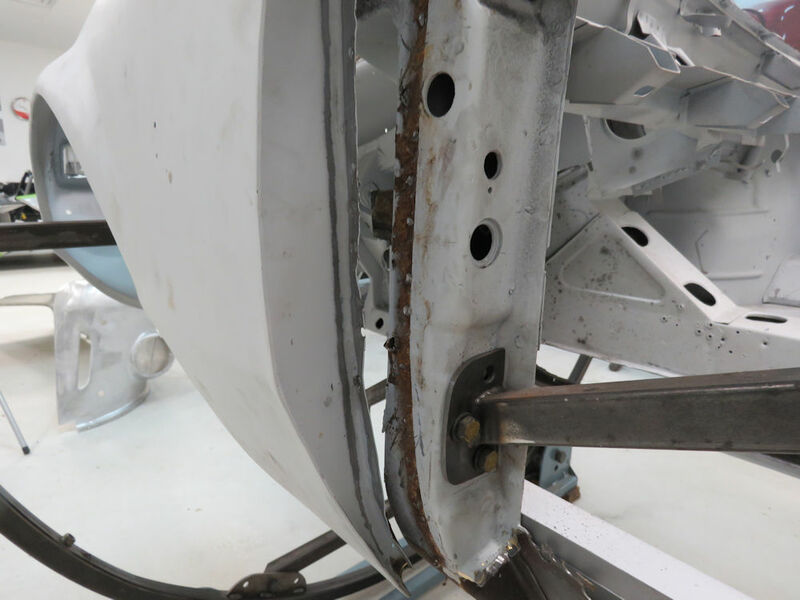 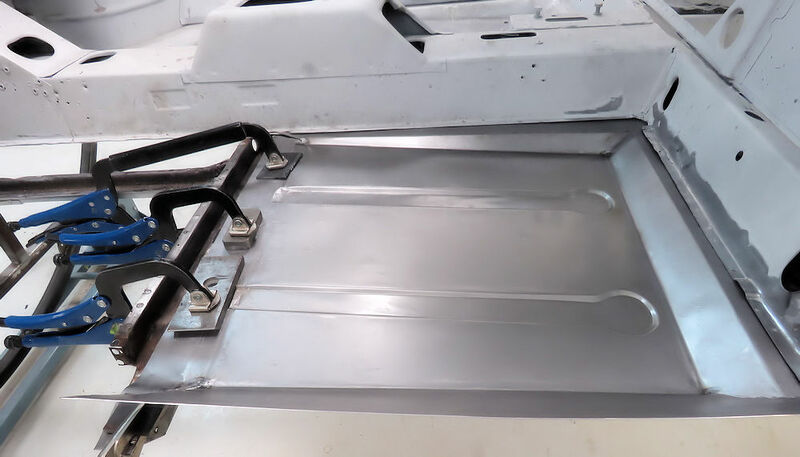 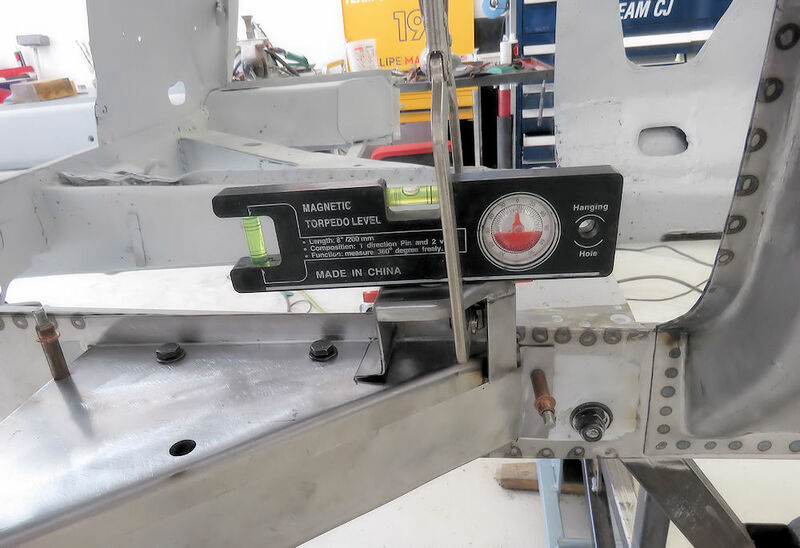 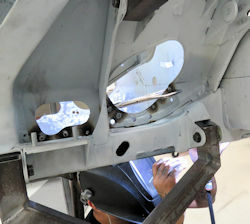 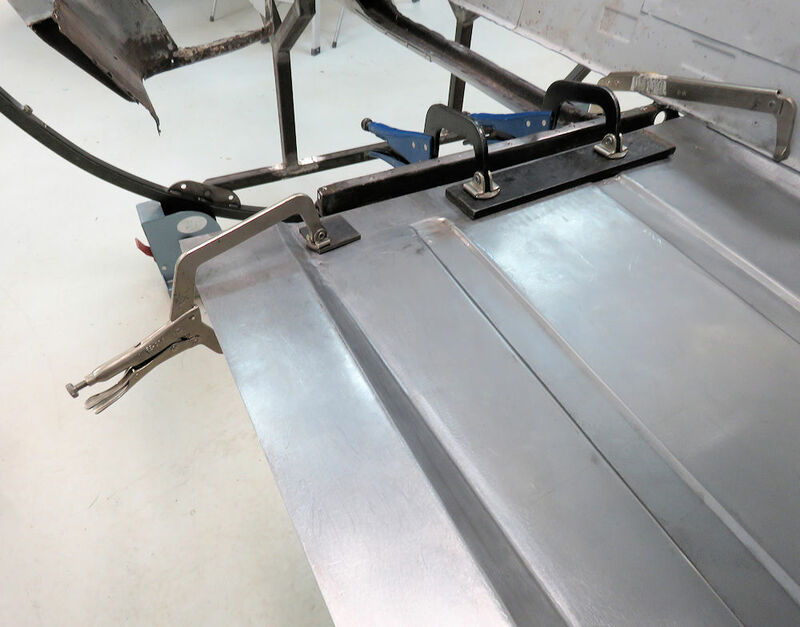 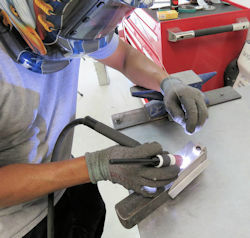 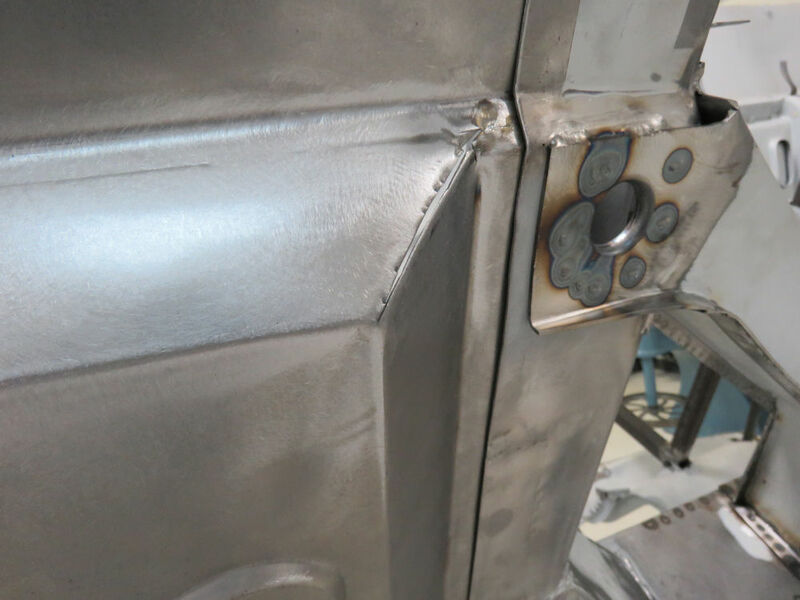 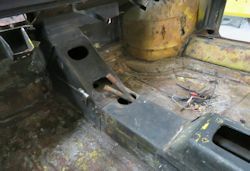 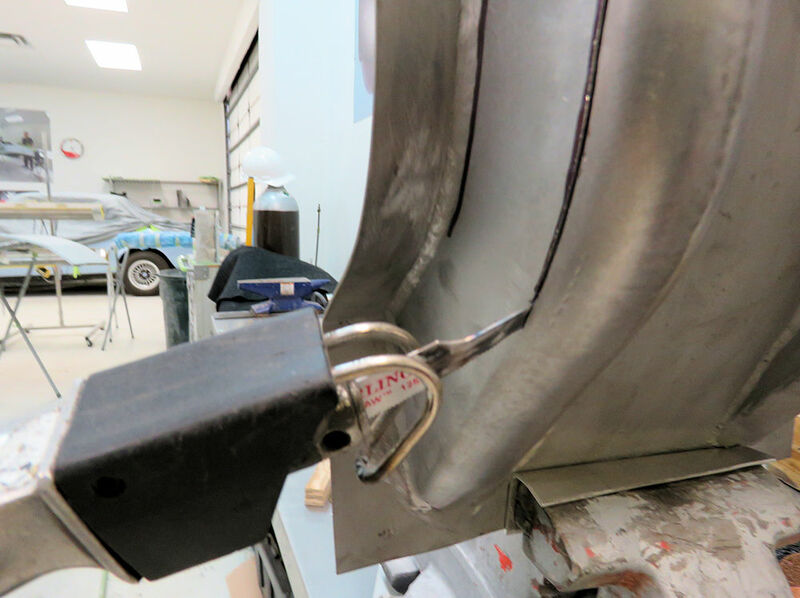 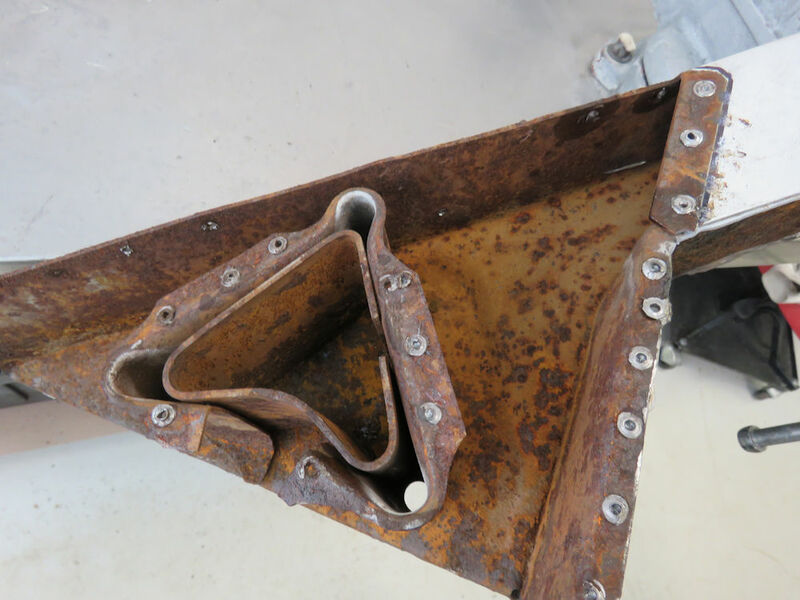 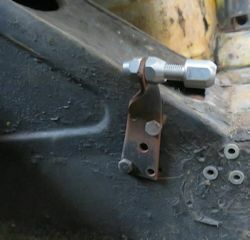 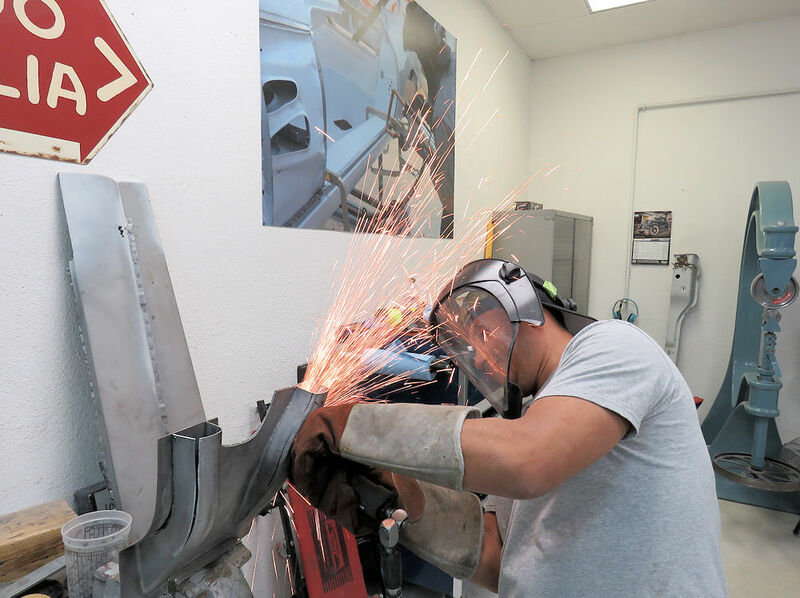 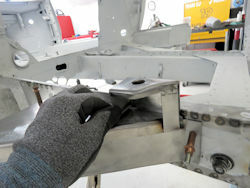 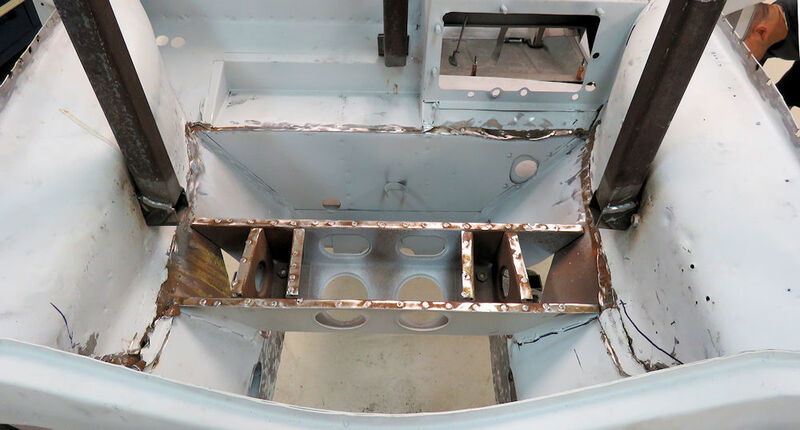 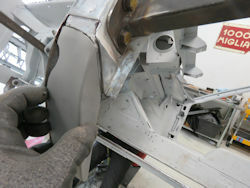 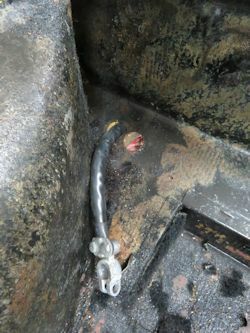 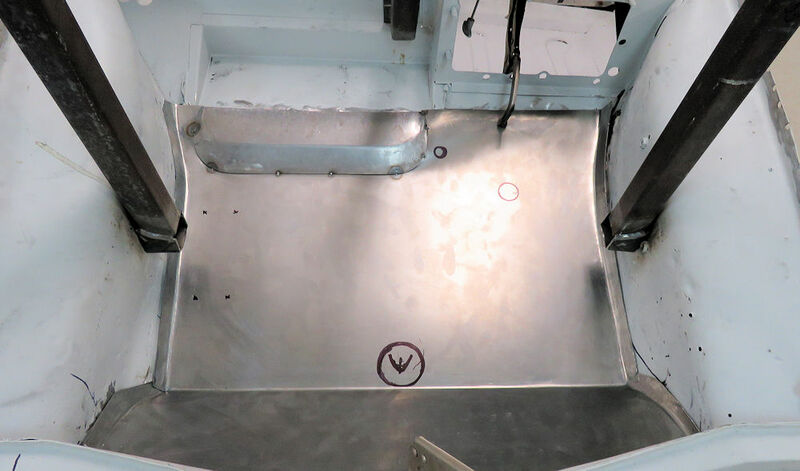 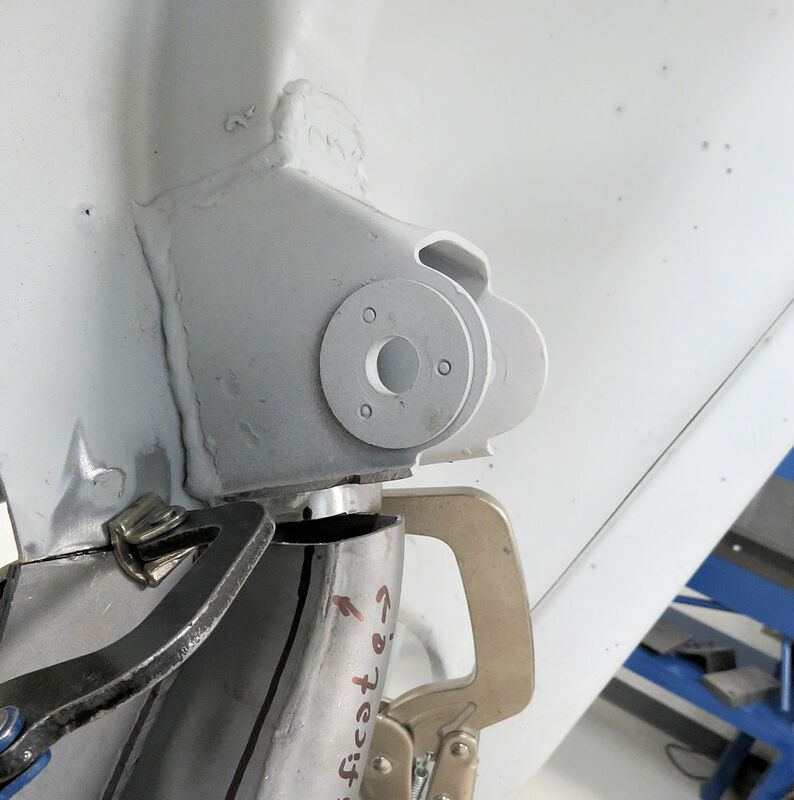 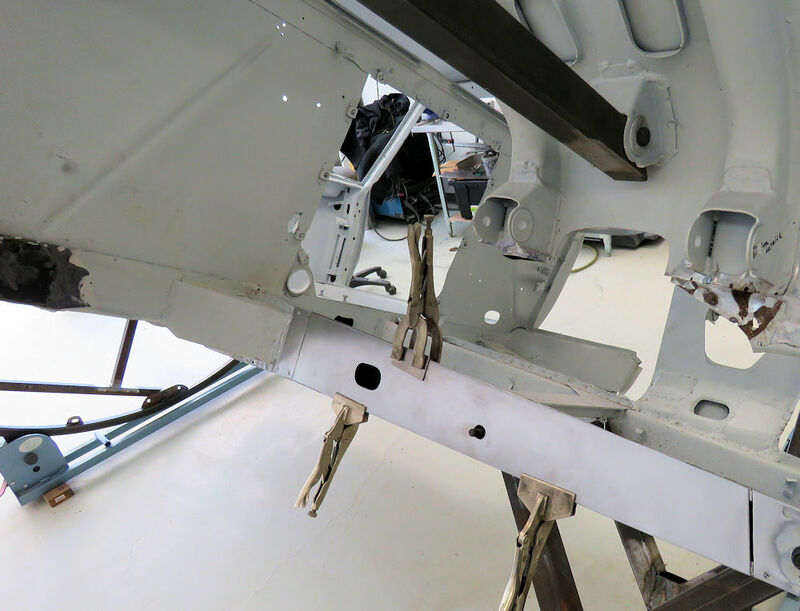 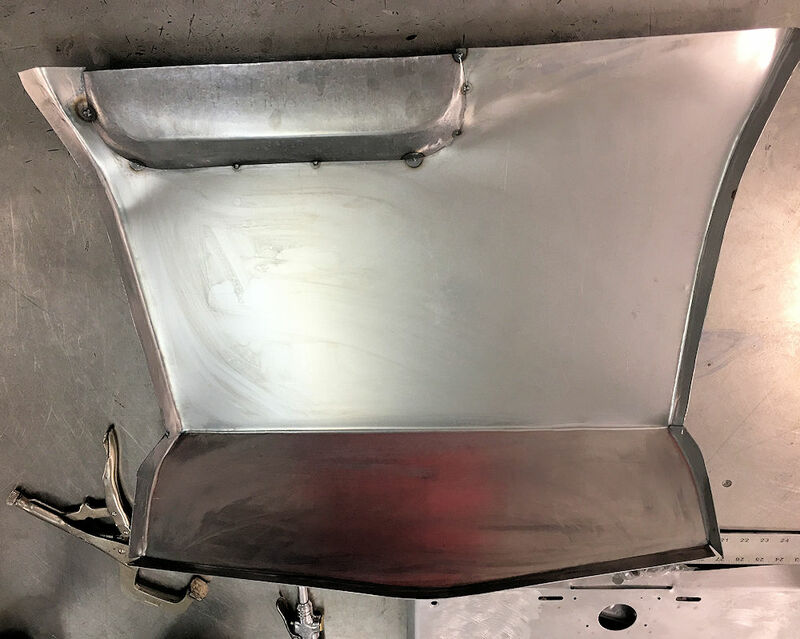 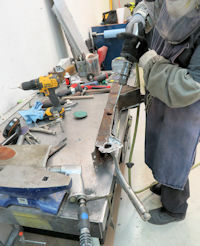 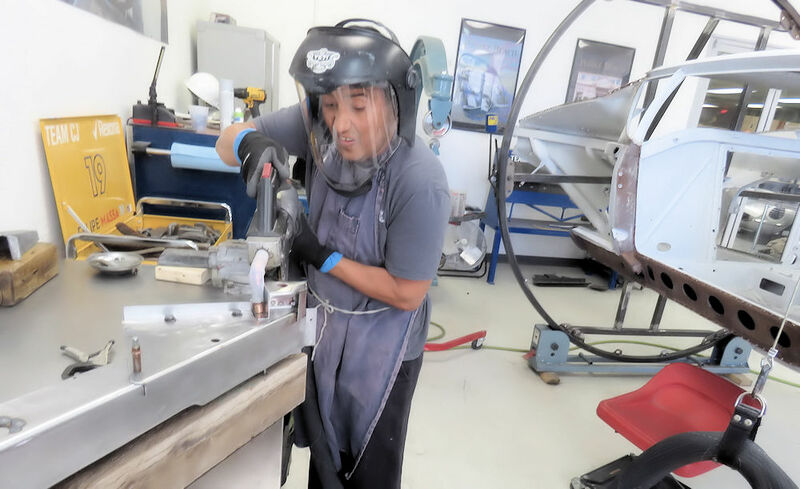 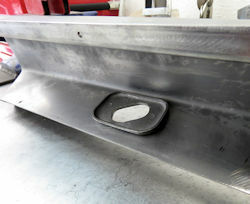 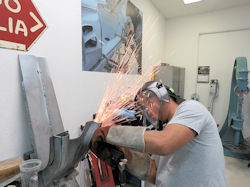 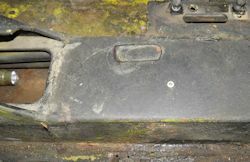 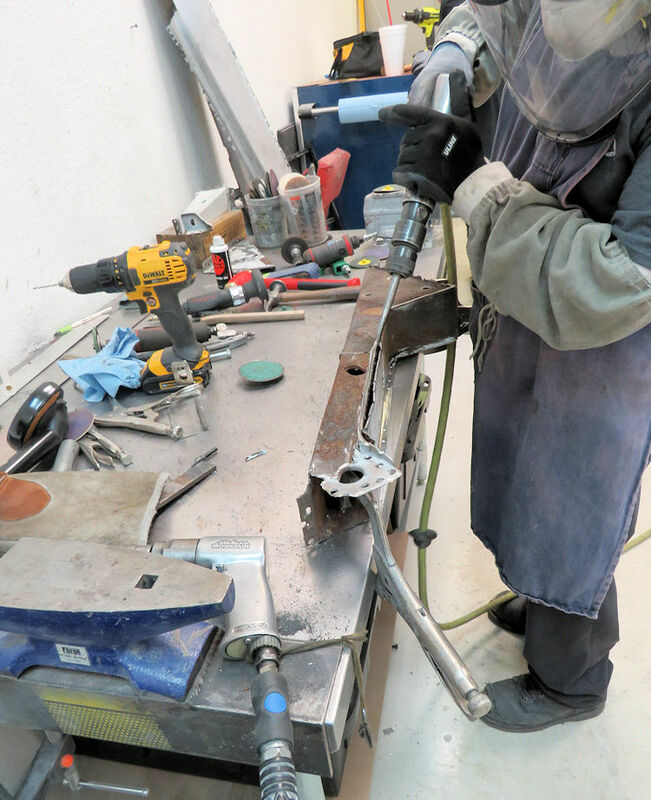 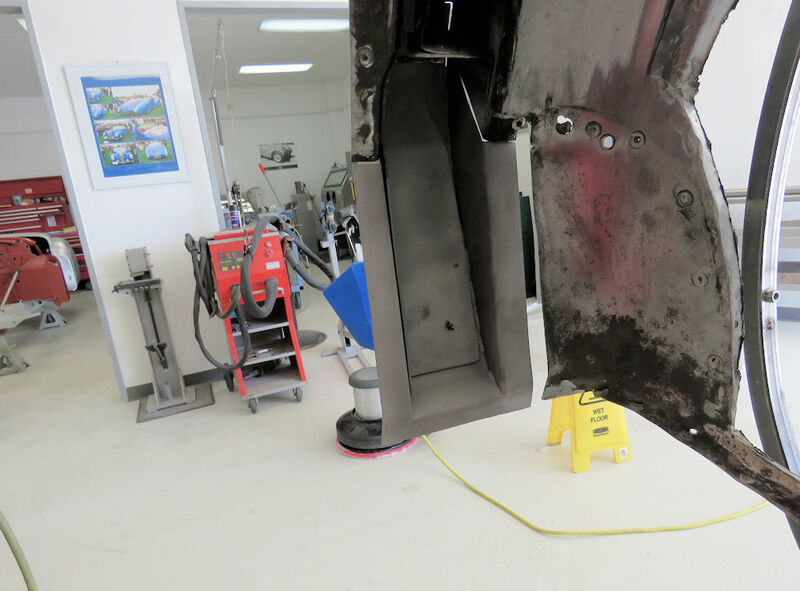 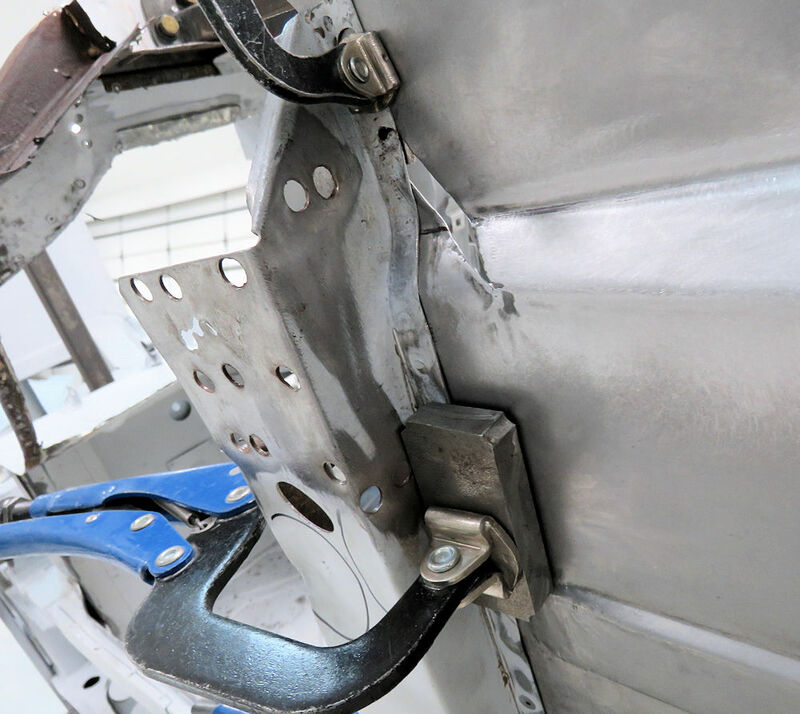 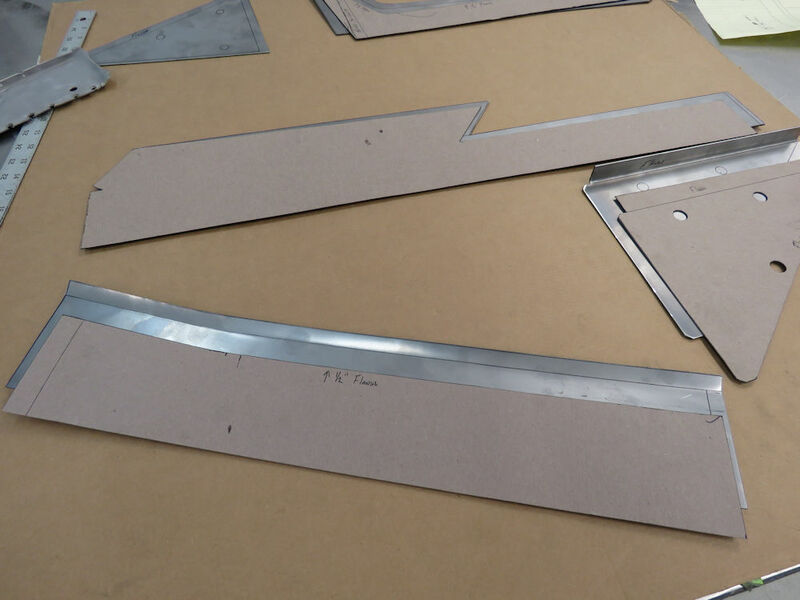 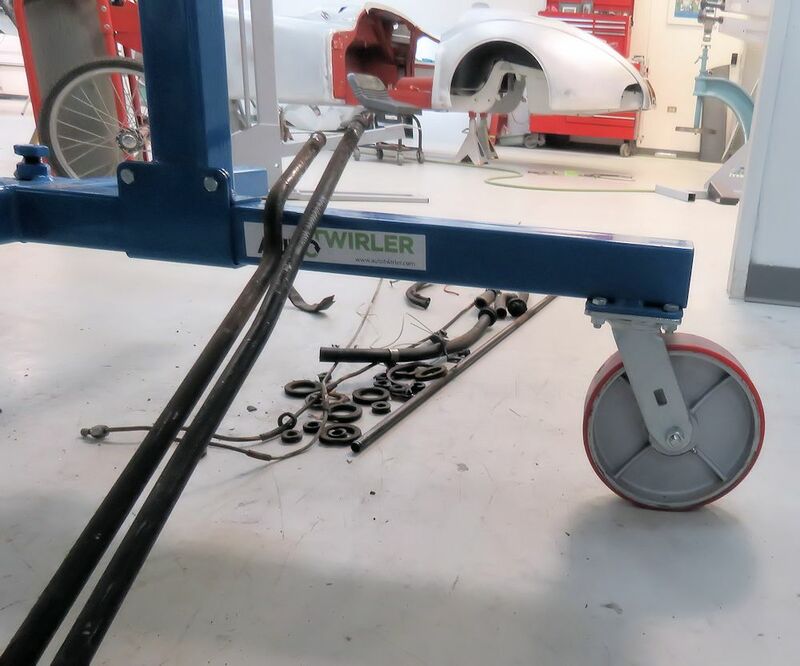 Adrian has been busy fabricating and installing a new driver's floor pan and braces. 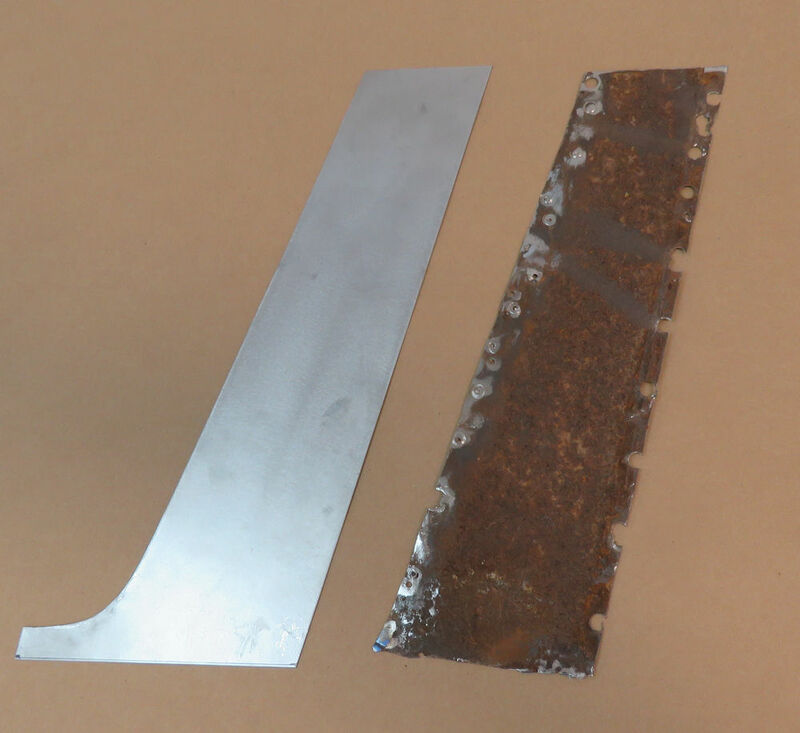 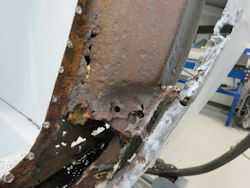 Slowly but surely we are cutting away all the corroded metal and replacing it with new! 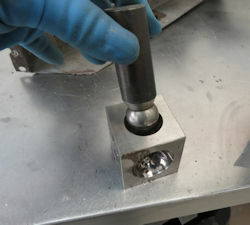 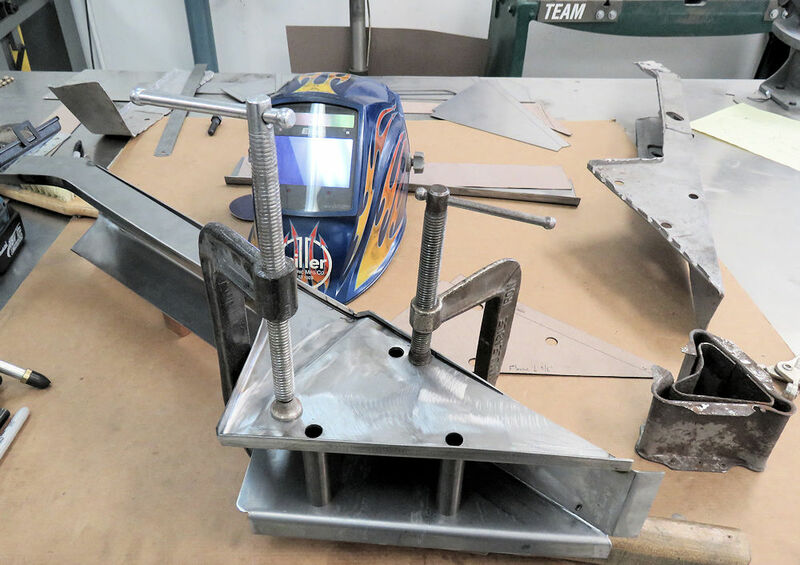 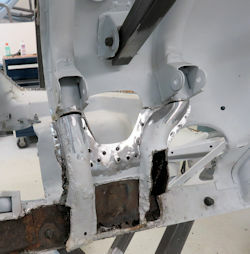 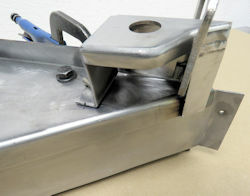 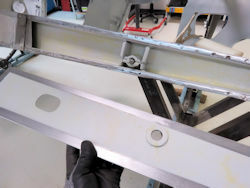 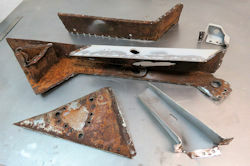 Reconstructing a lower A pillar, modifying floor pan support brackets to work with the dropped floor pans. 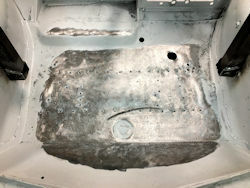 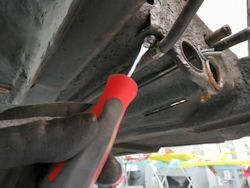 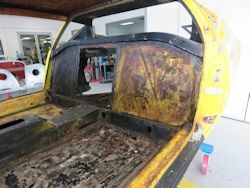 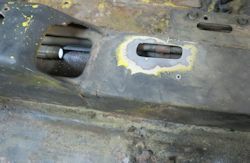 Trial fitting and modifying the floor pans, and of course cutting away more rust. 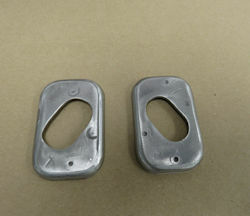 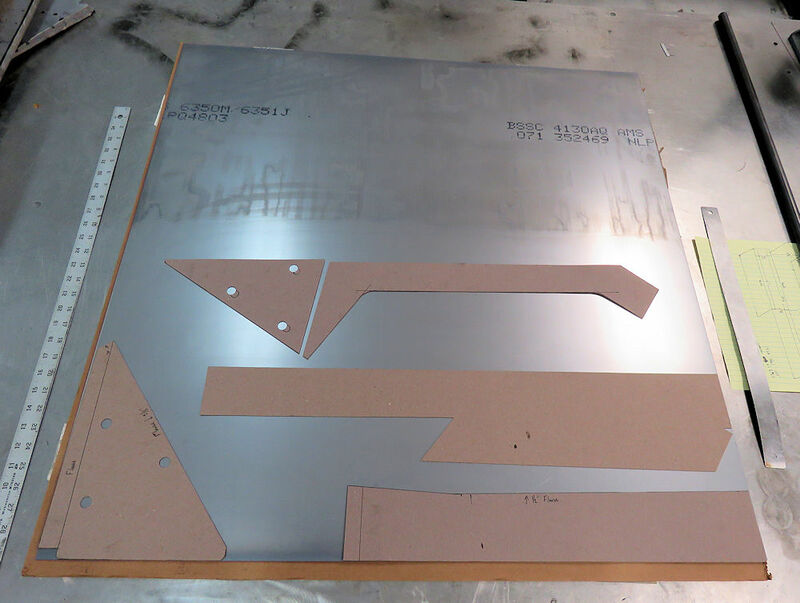 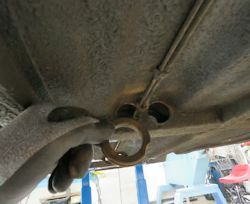 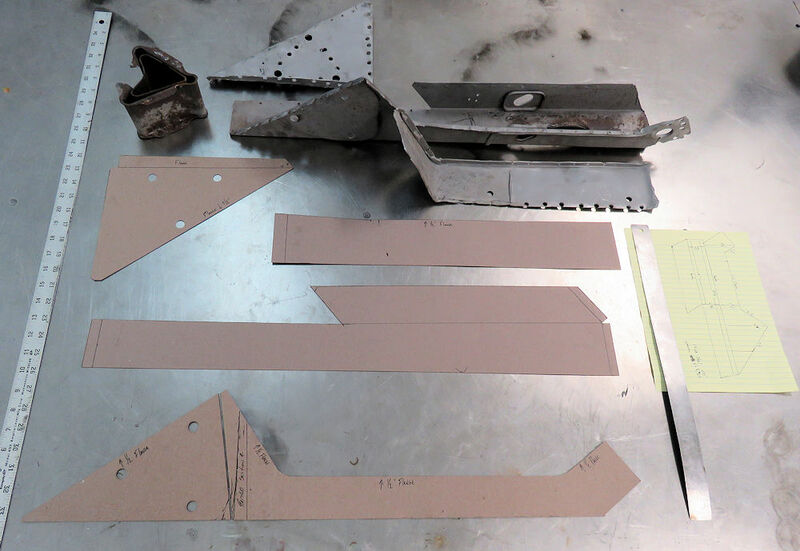 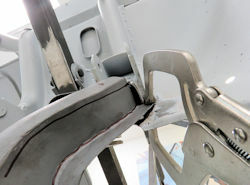 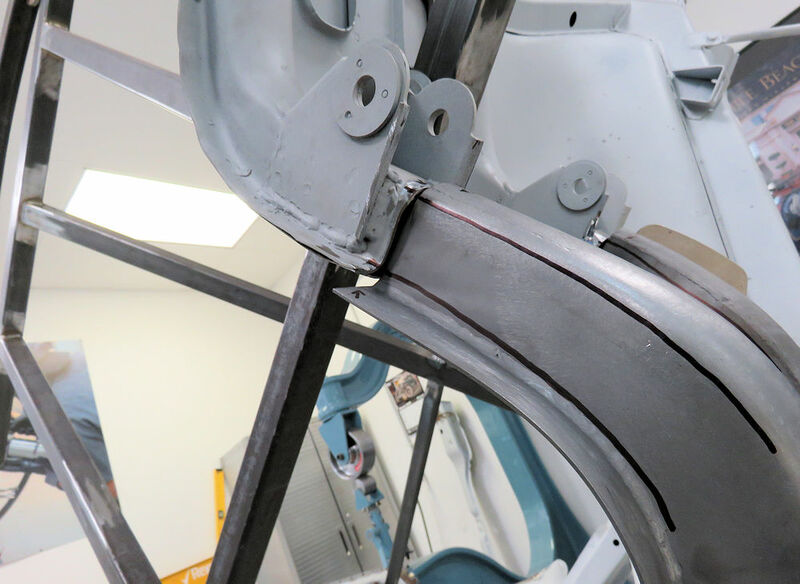 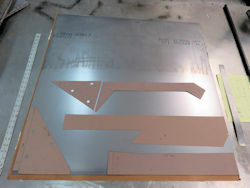 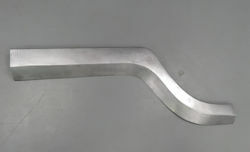 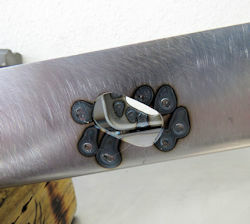 The following sequence of photographs show how Oscar fabricated a pair of new engine support brackets. 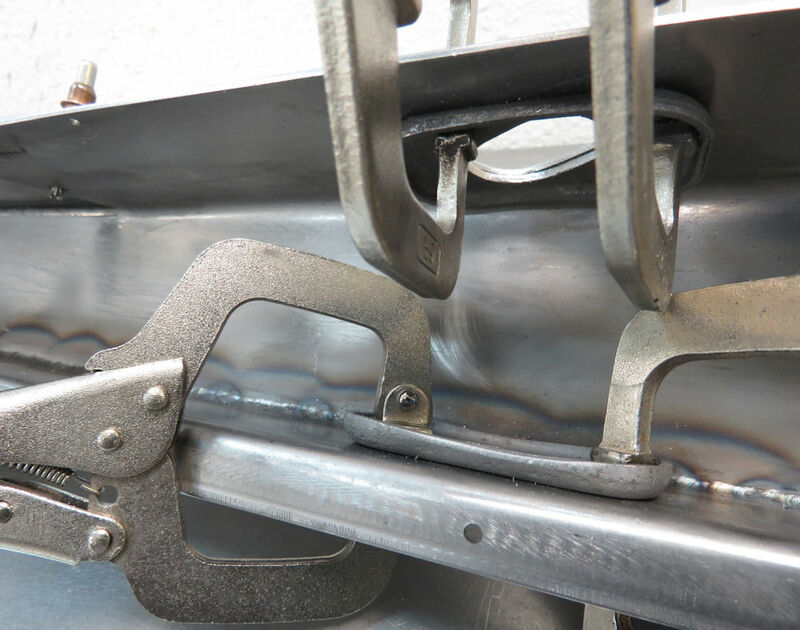 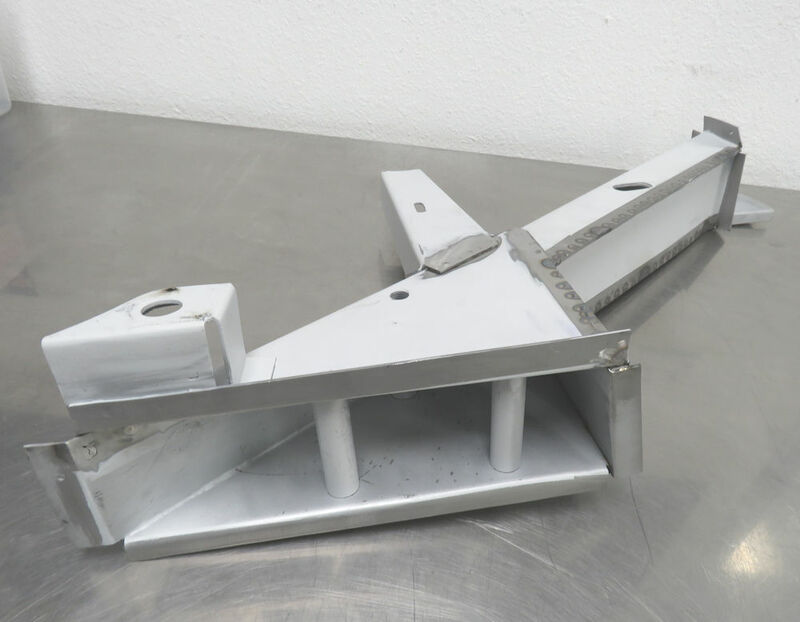 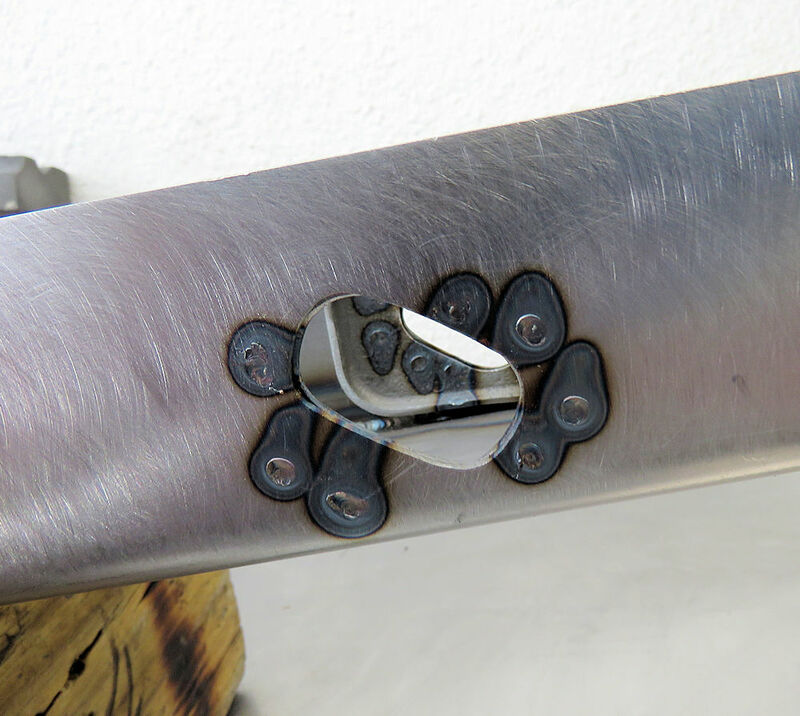 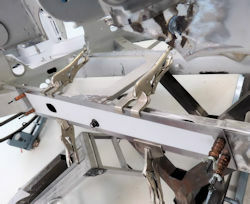 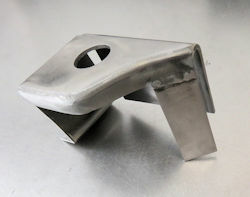 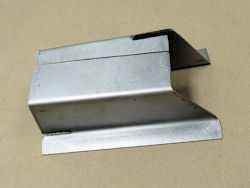 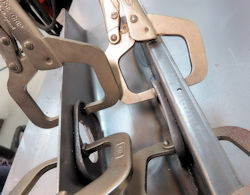 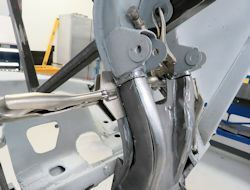 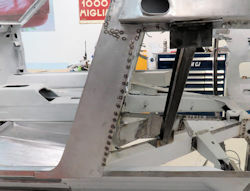 These heavy duty brackets cradle the engine and form an integral (and structural) part of the frame. 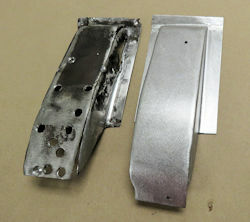 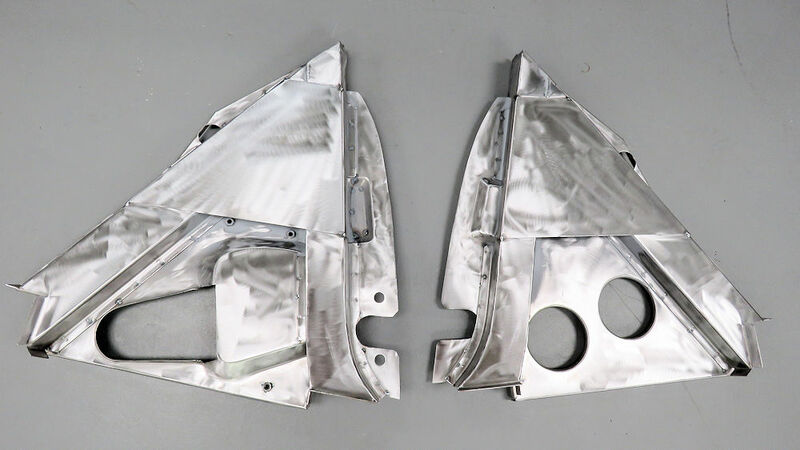 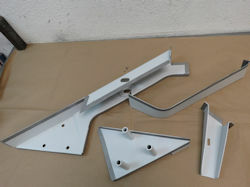 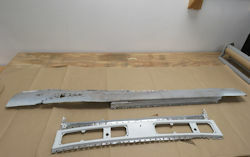 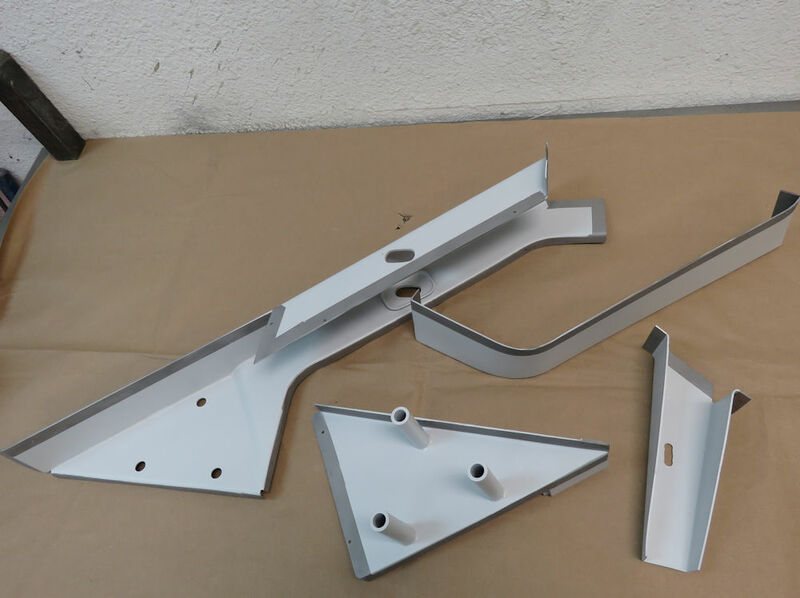 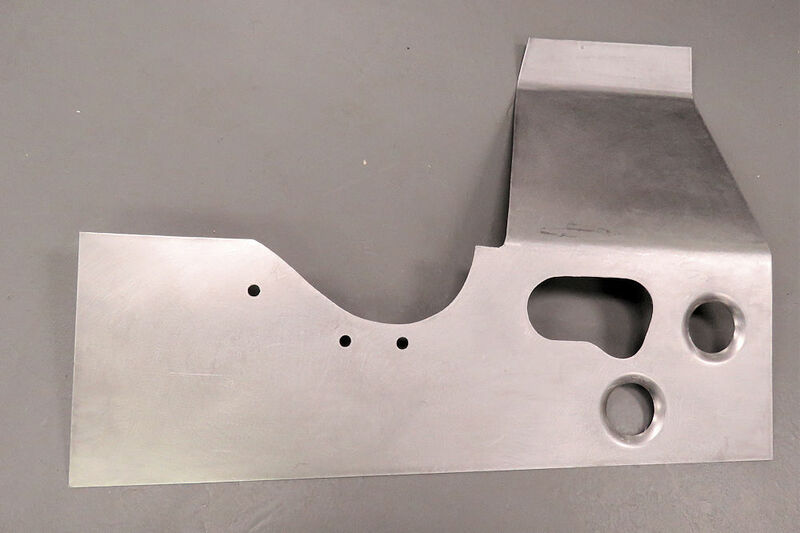 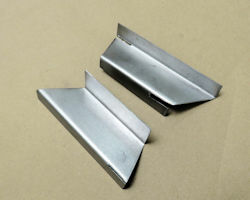 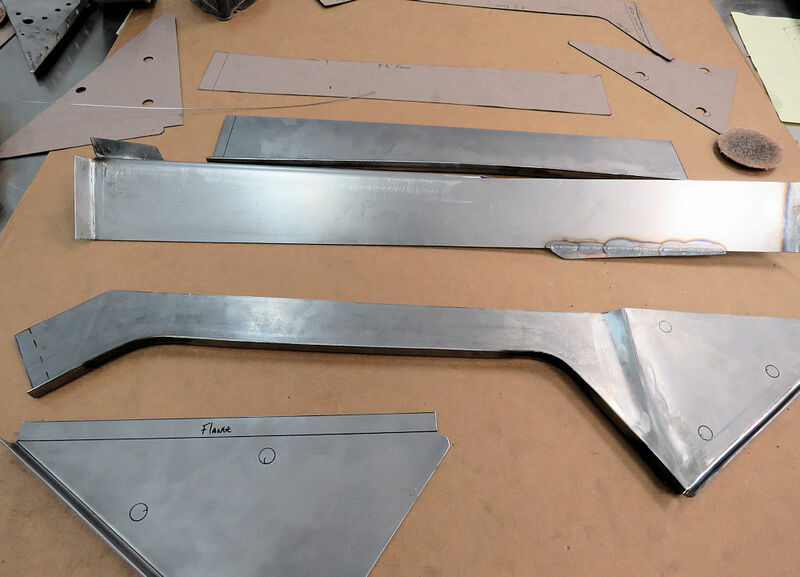 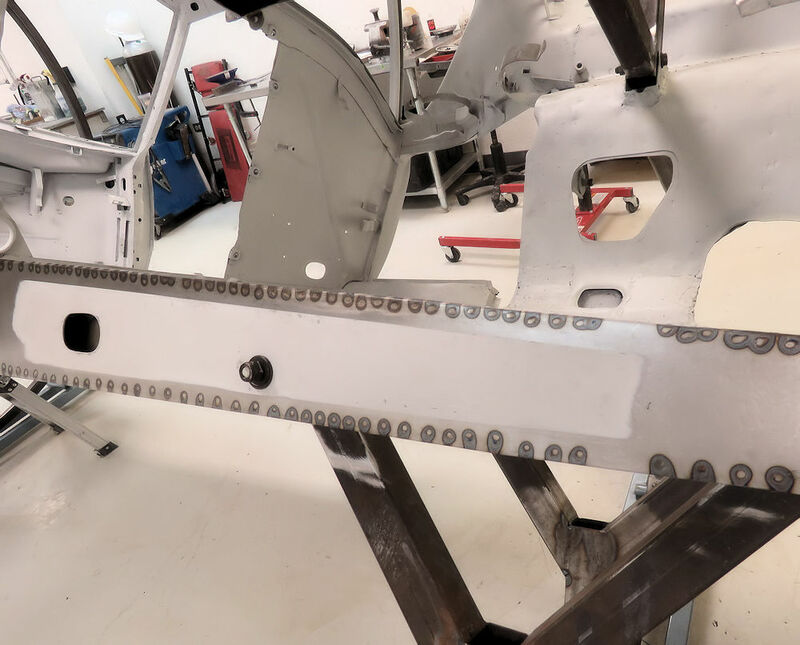 These brackets are not available new and having been quoted almost $7,000 for a used set from one of the Pantera parts specialists, we decided to make our own. Fabricating and installing the first of many replacement panels. 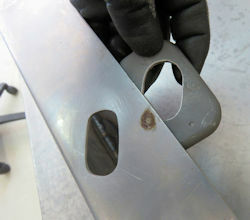 Trial fitting and modifying the first of the wheel house repair panels. This is a case where things are going to get much worse before they can start getting better. 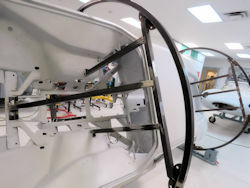 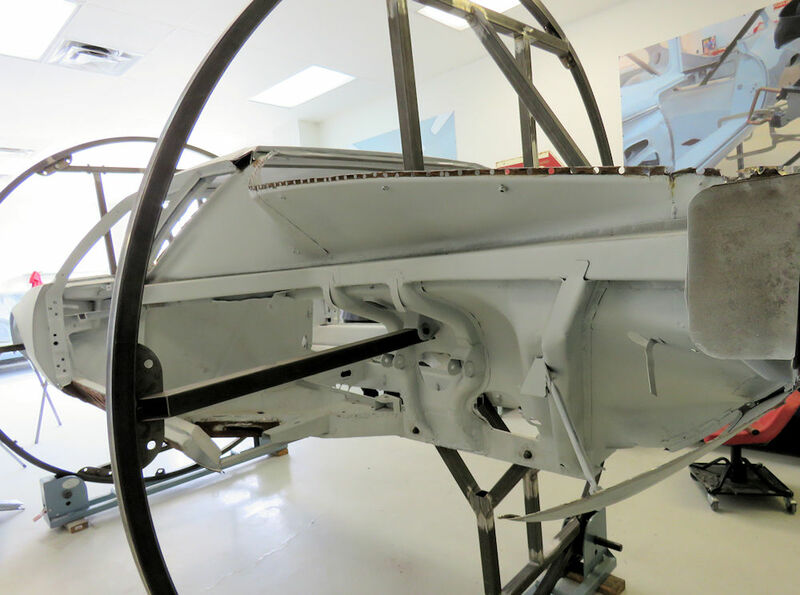 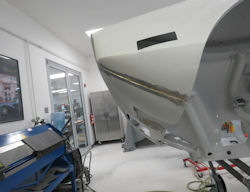 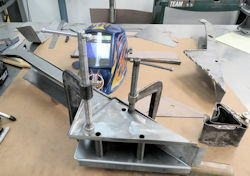 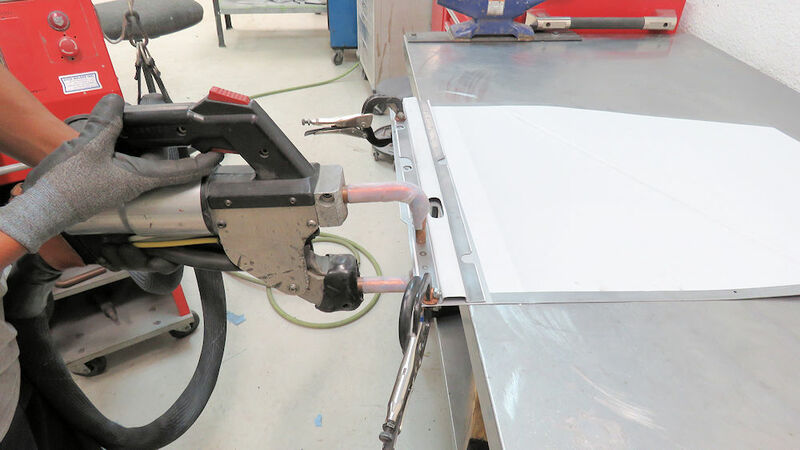 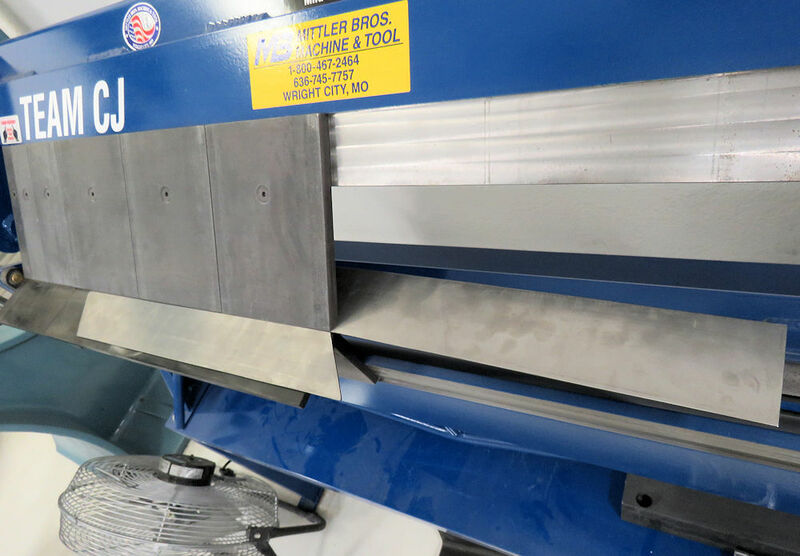 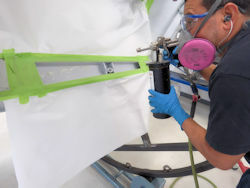 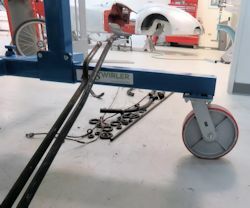 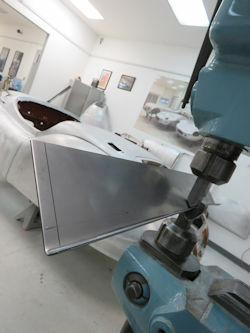 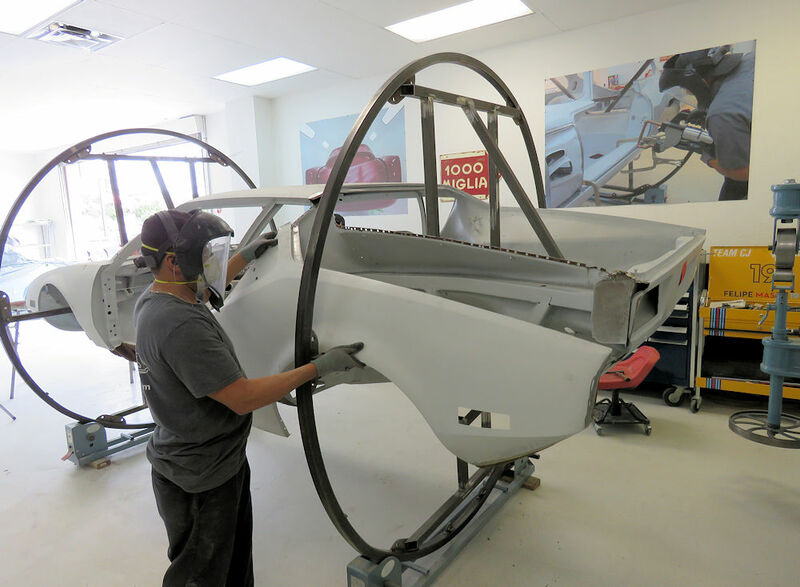 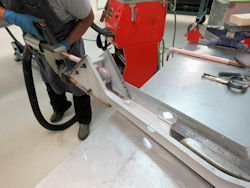 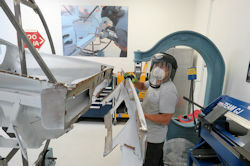 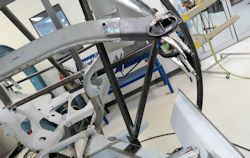 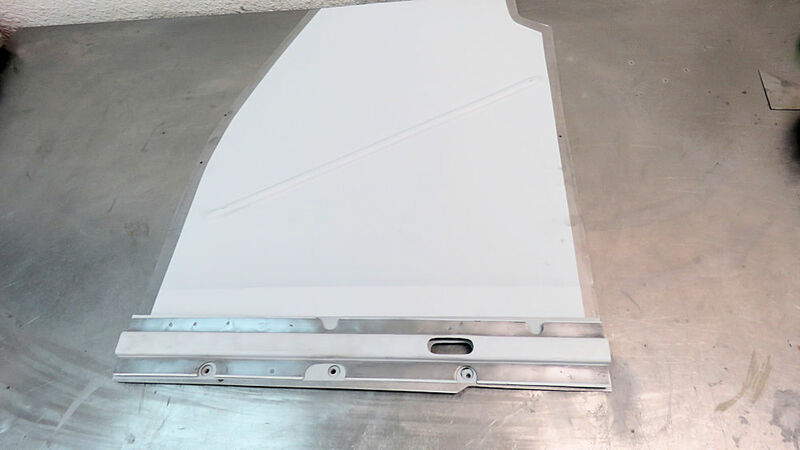 We have now placed the monocoque on one of the rotisseries and begun the panel replacement process. 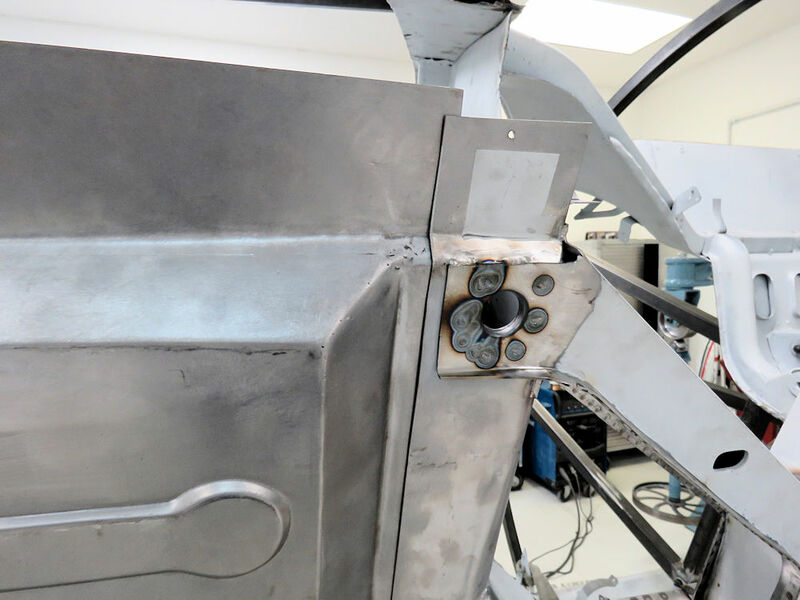 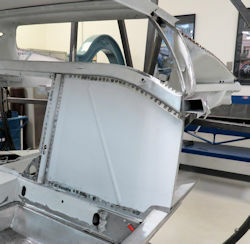 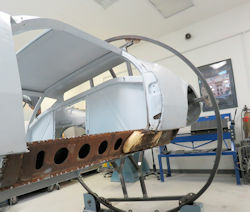 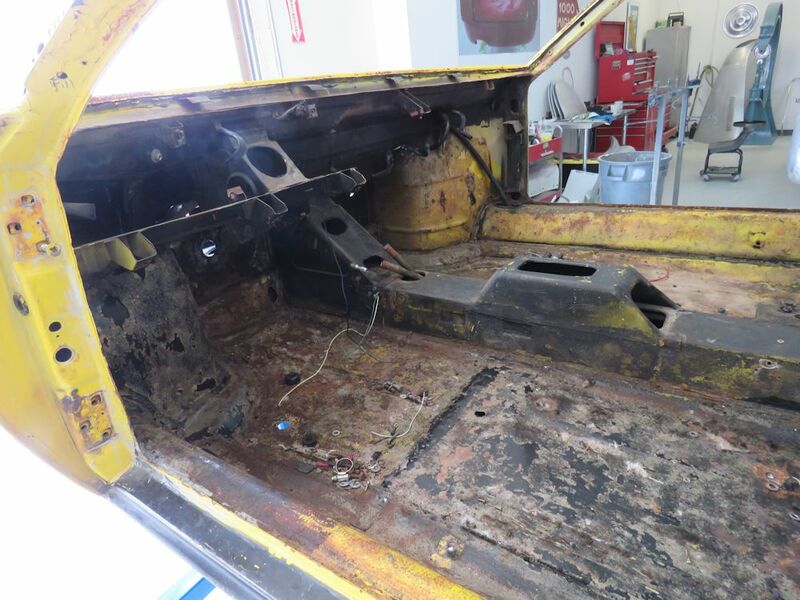 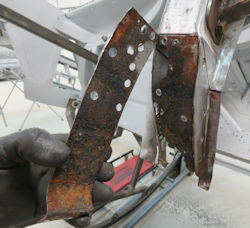 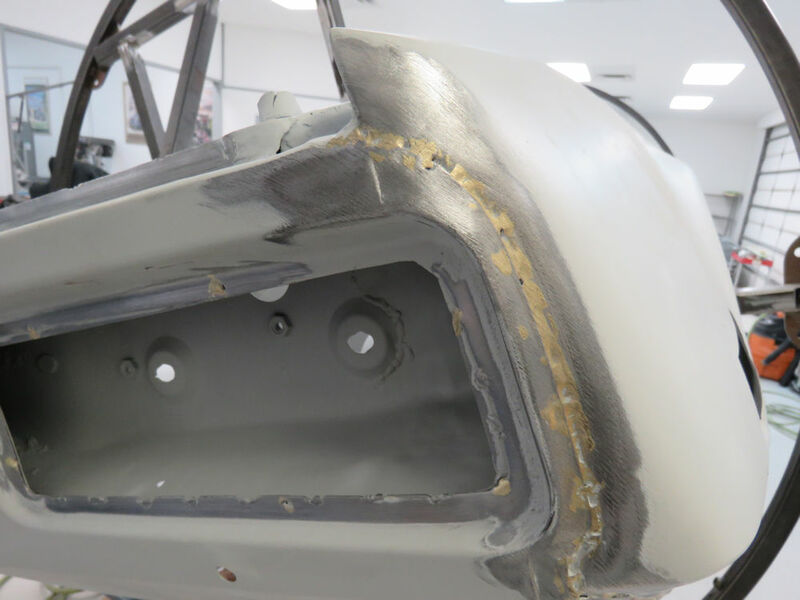 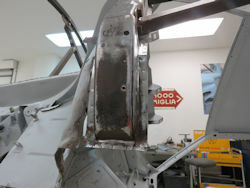 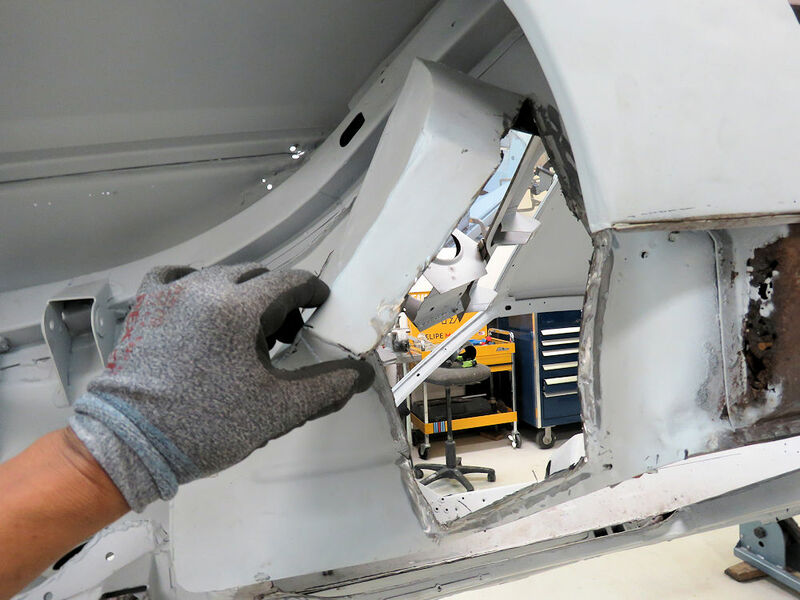 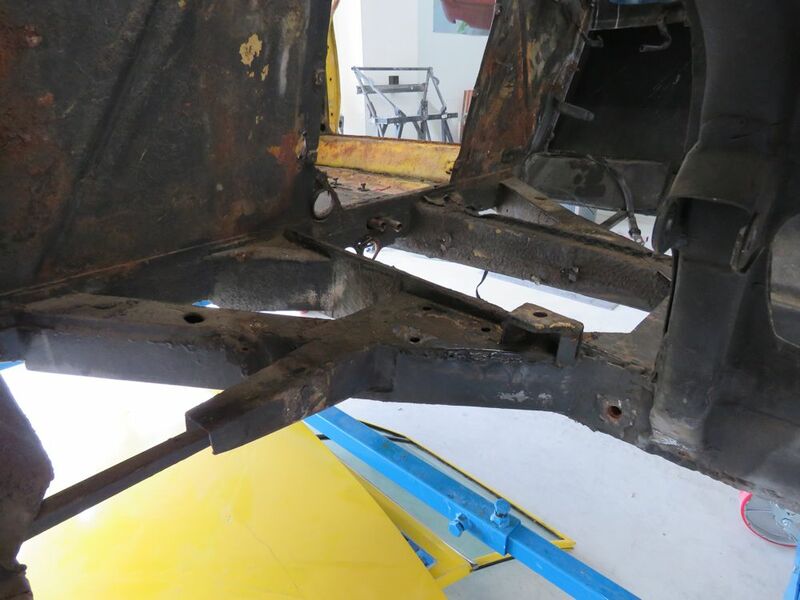 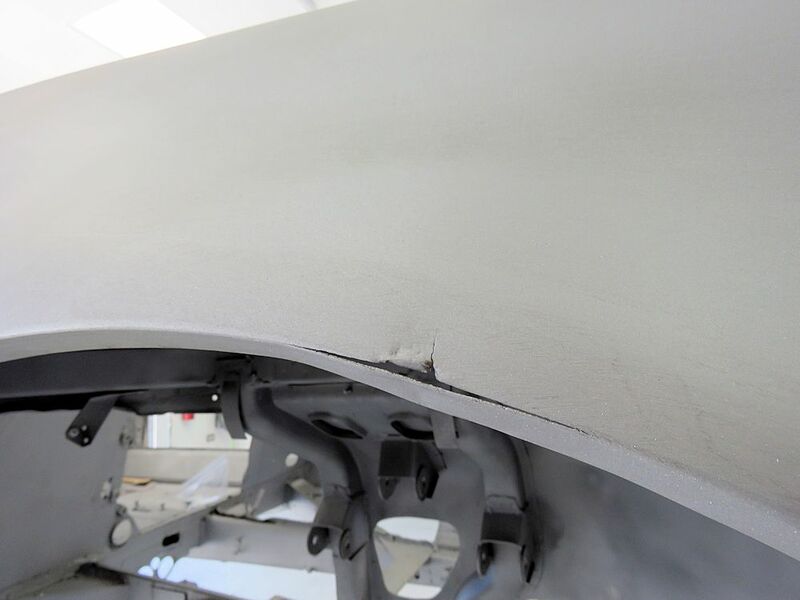 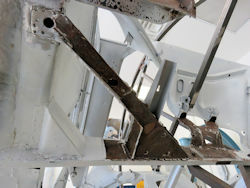 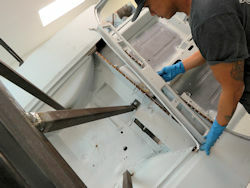 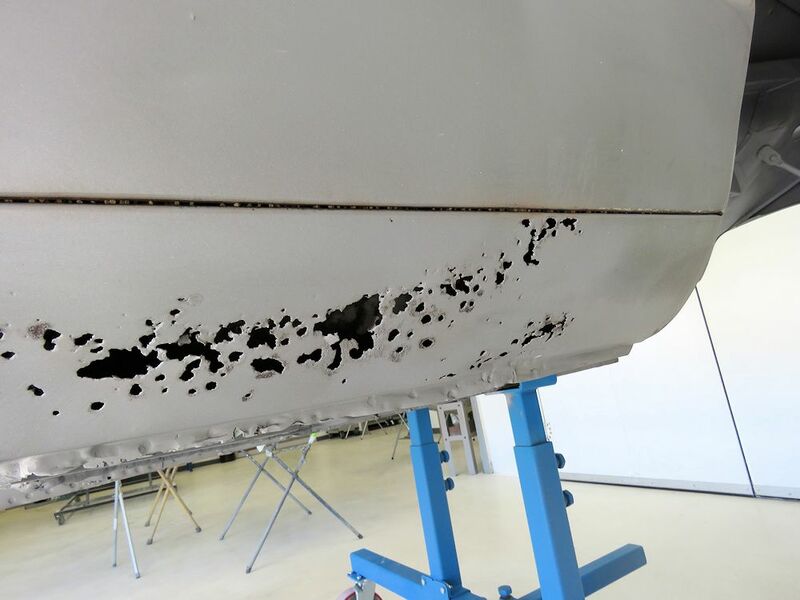 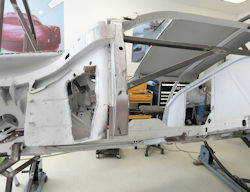 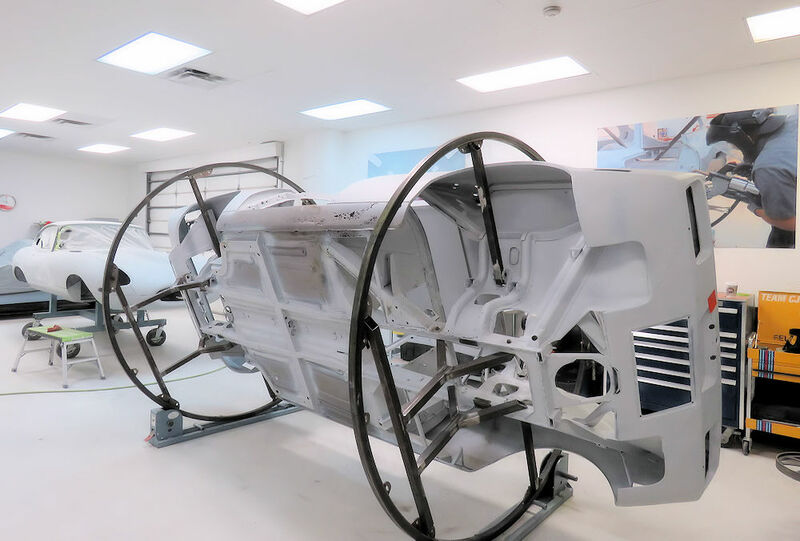 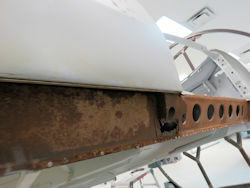 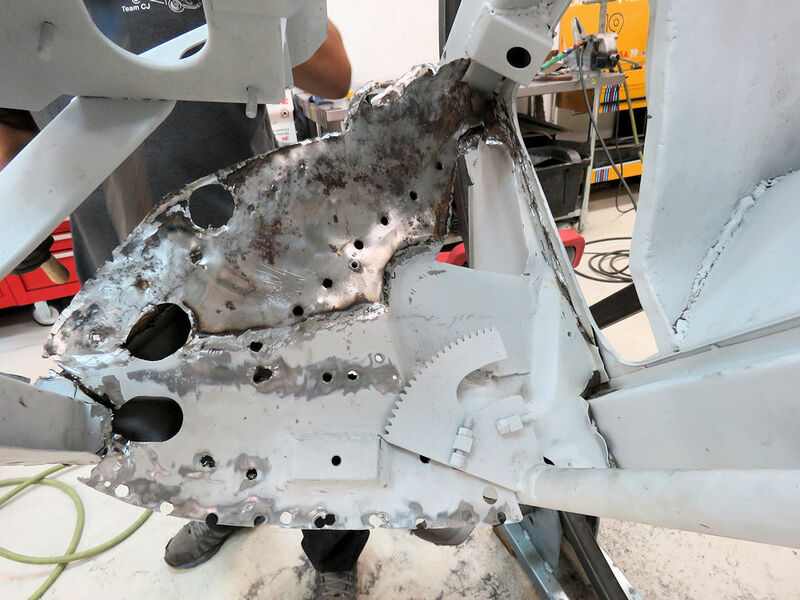 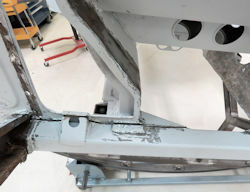 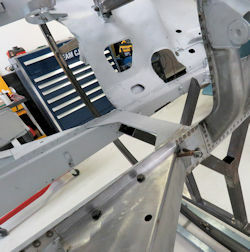 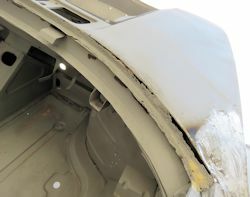 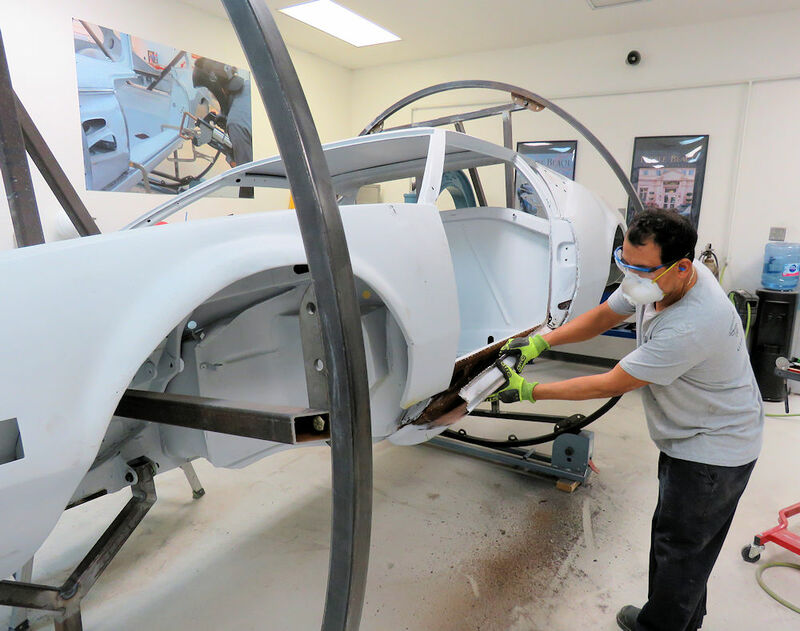 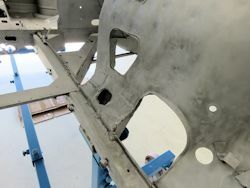 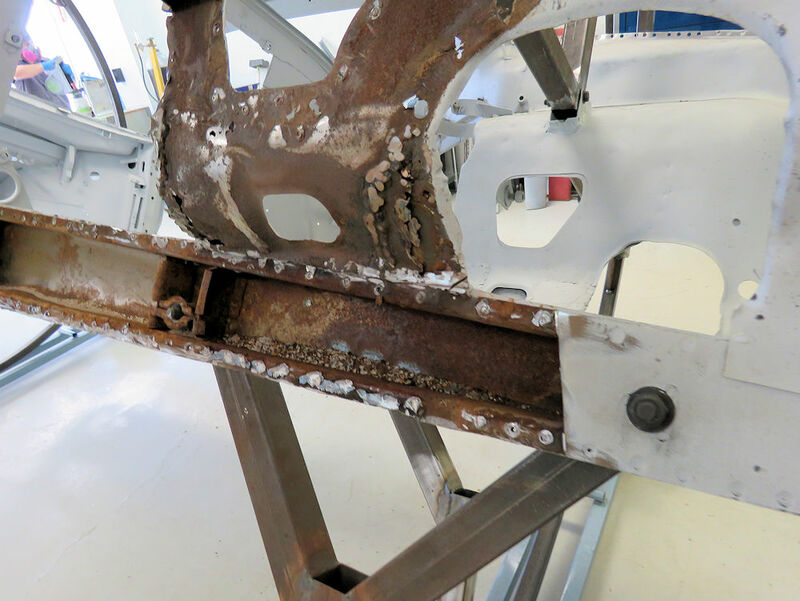 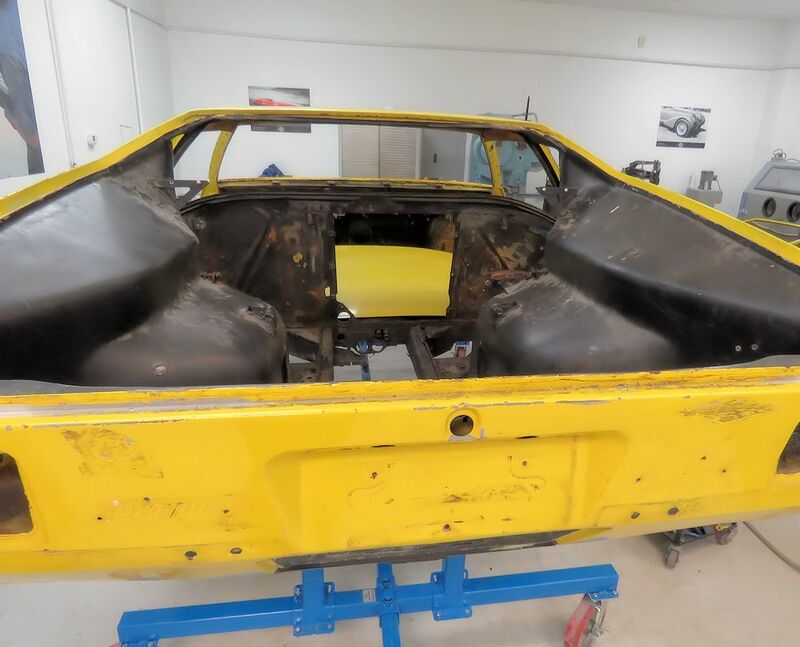 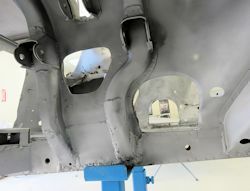 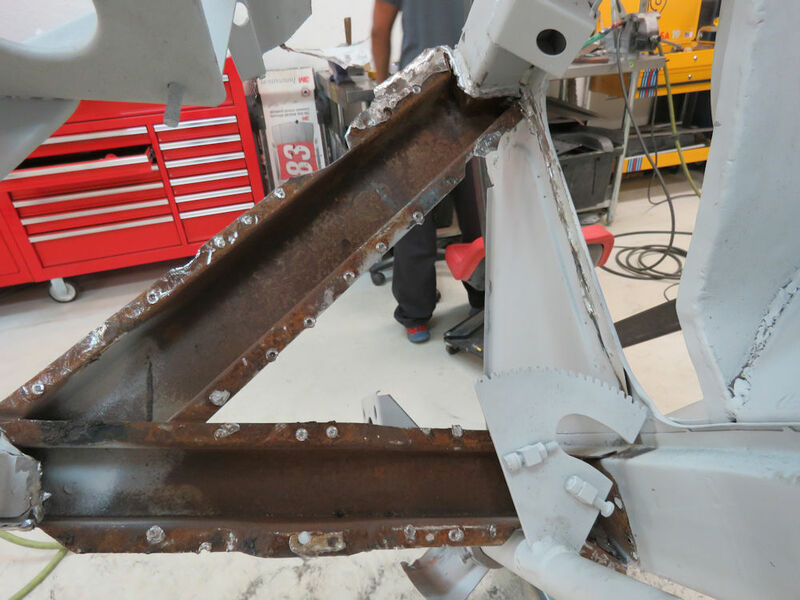 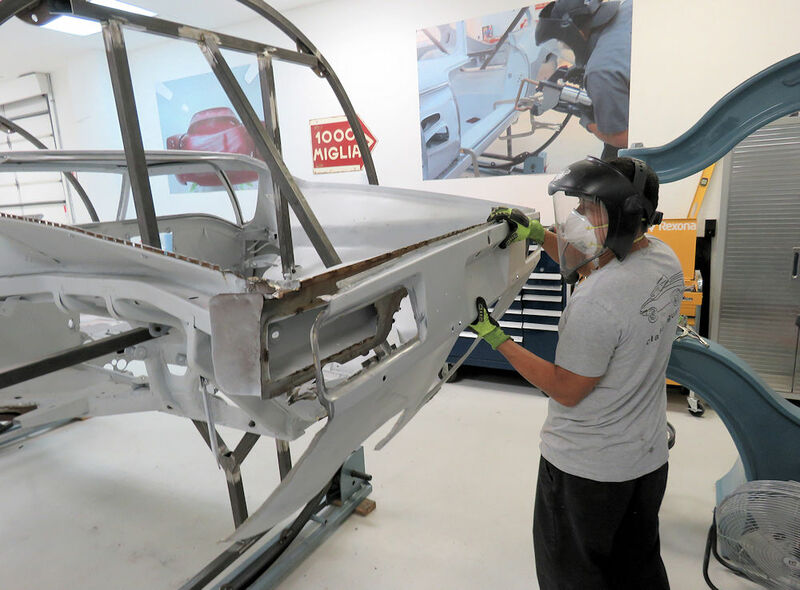 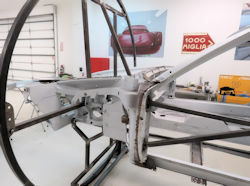 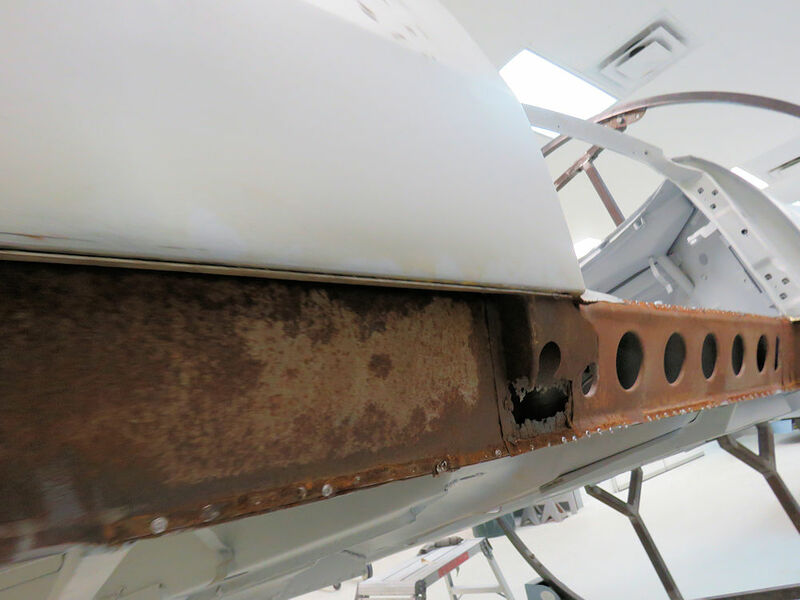 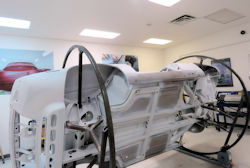 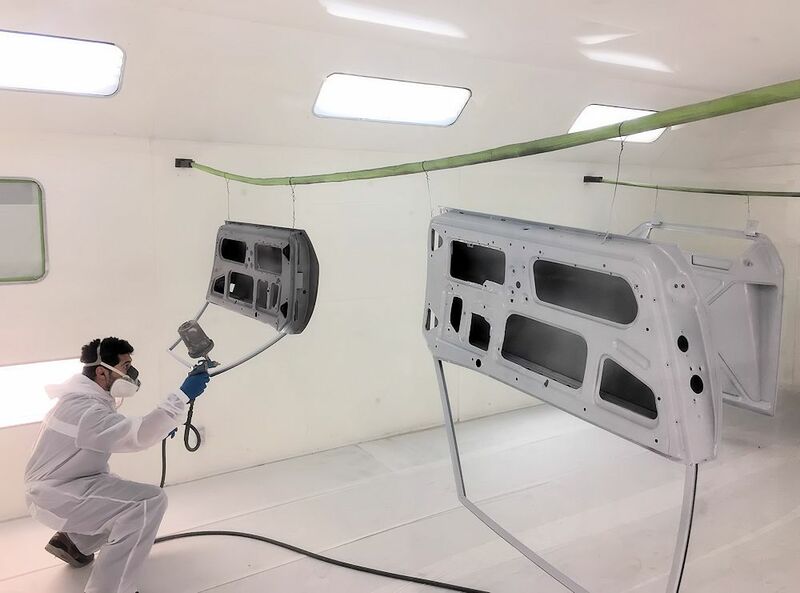 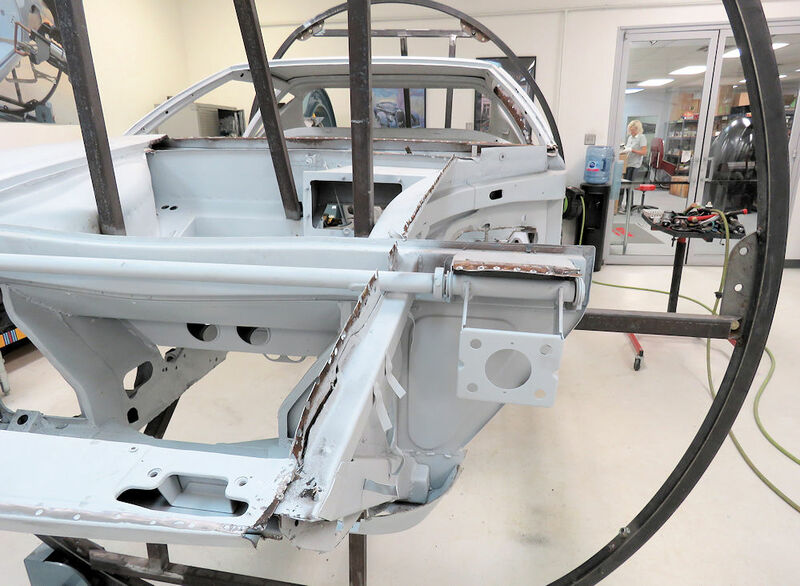 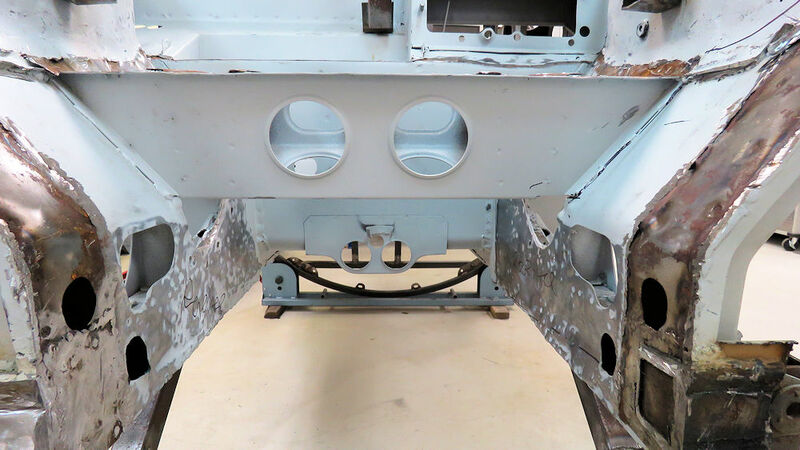 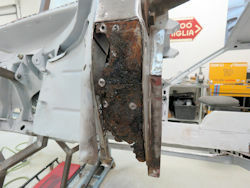 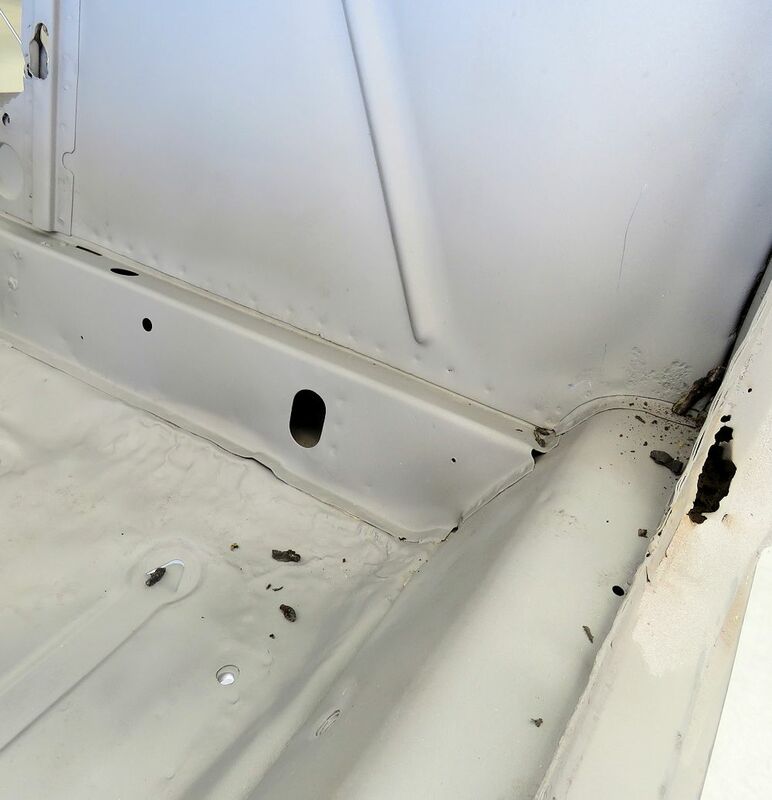 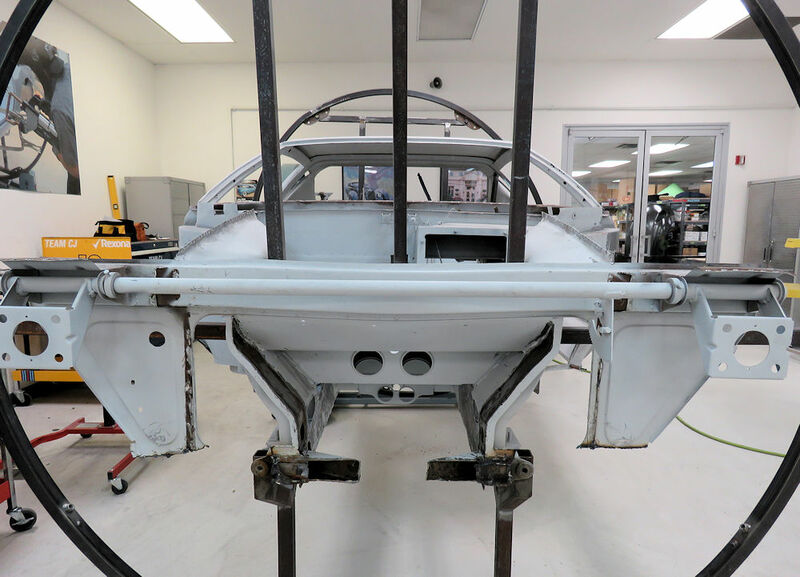 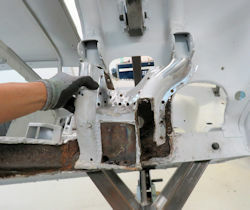 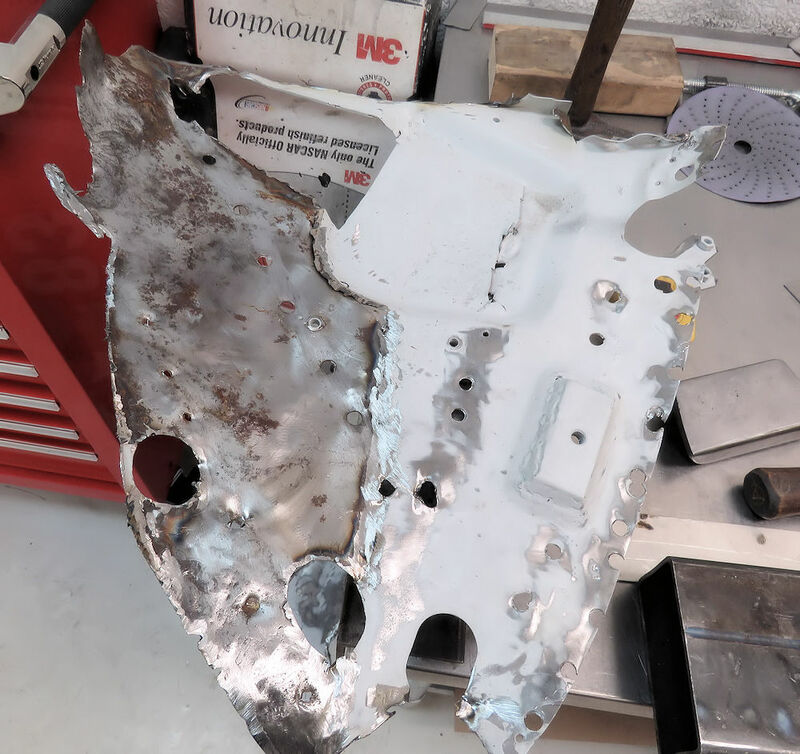 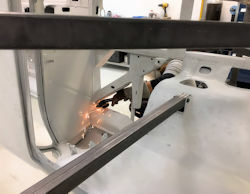 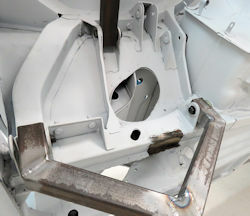 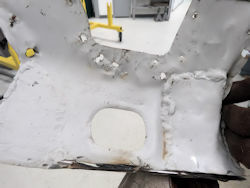 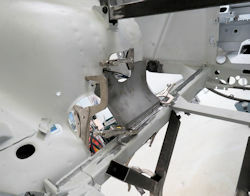 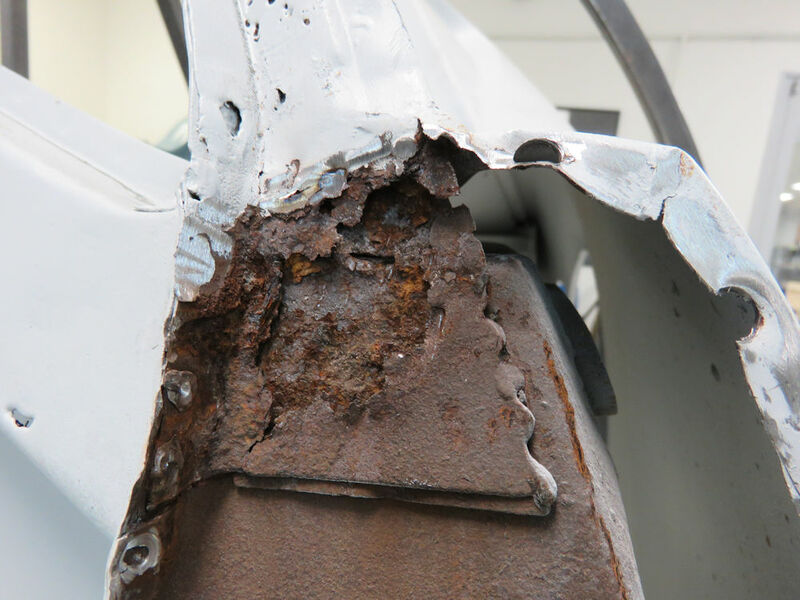 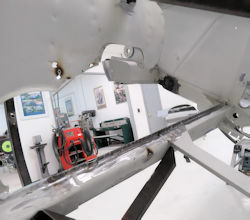 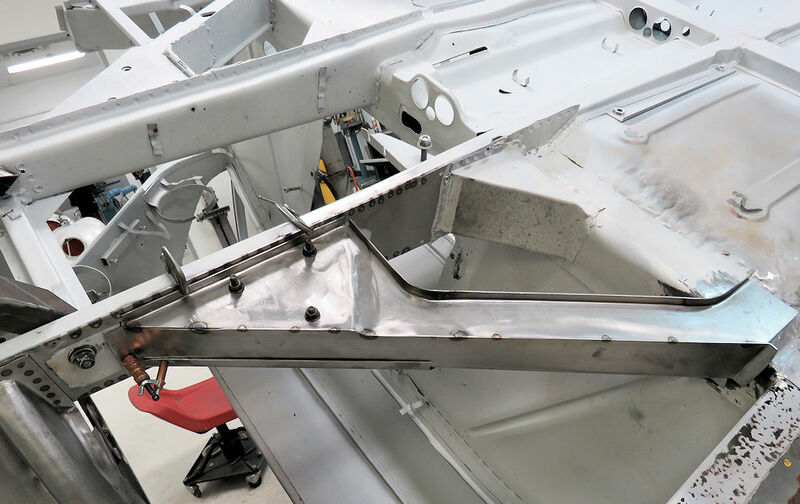 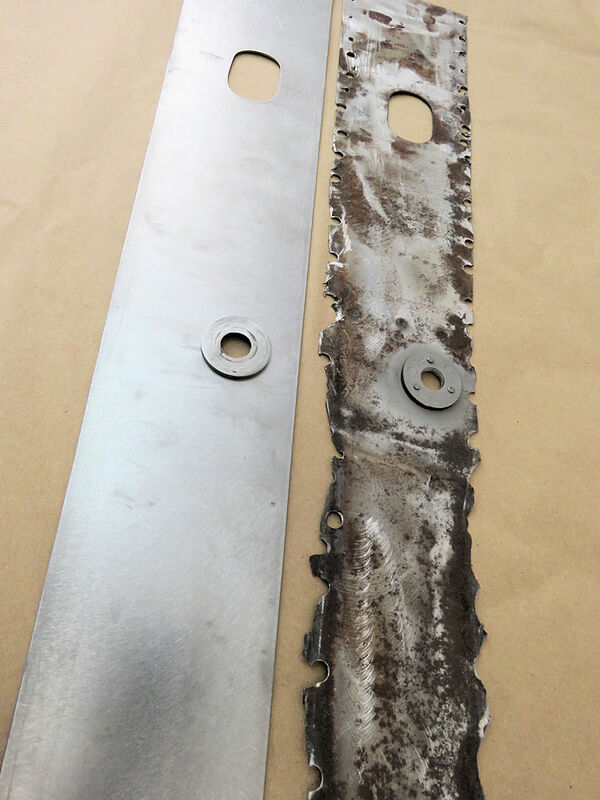 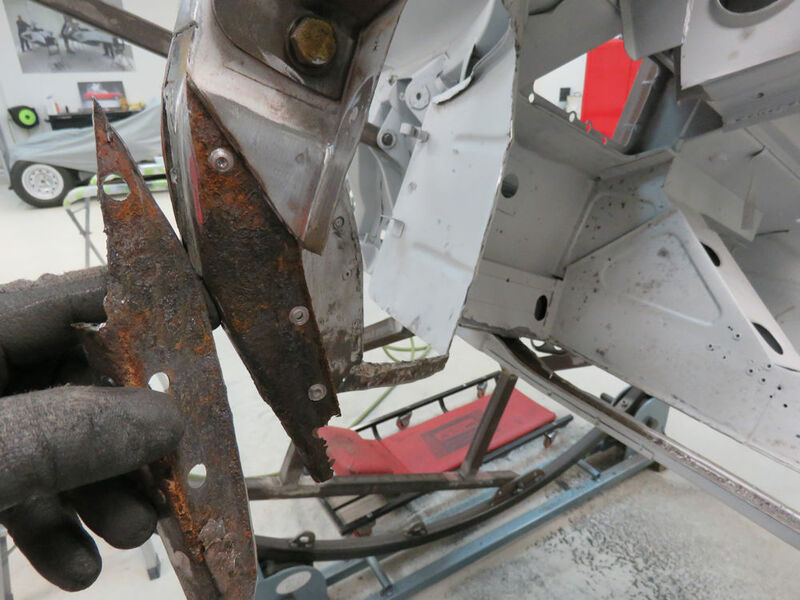 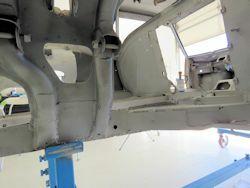 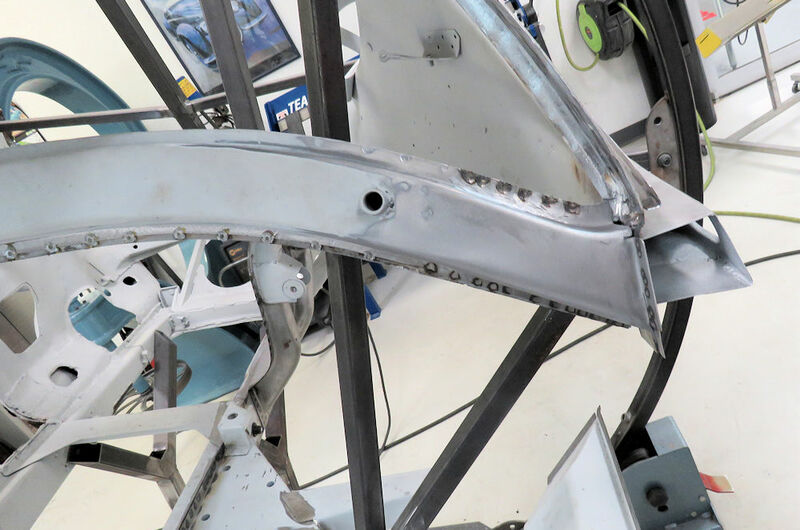 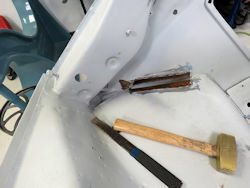 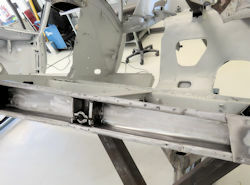 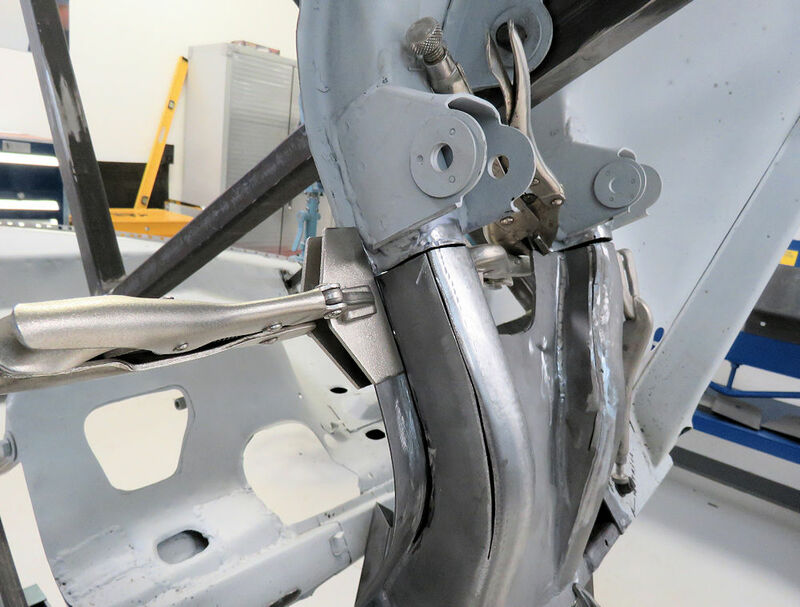 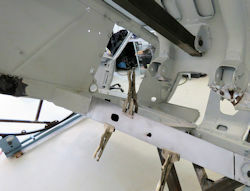 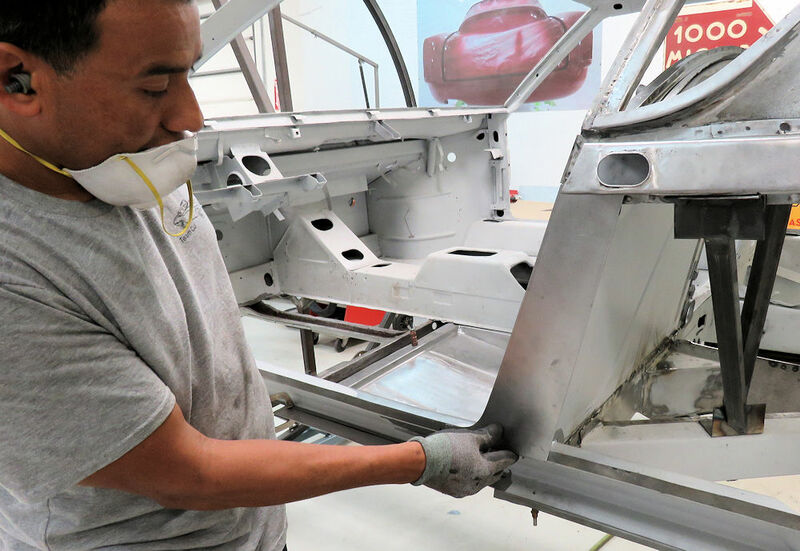 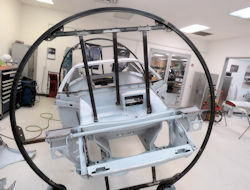 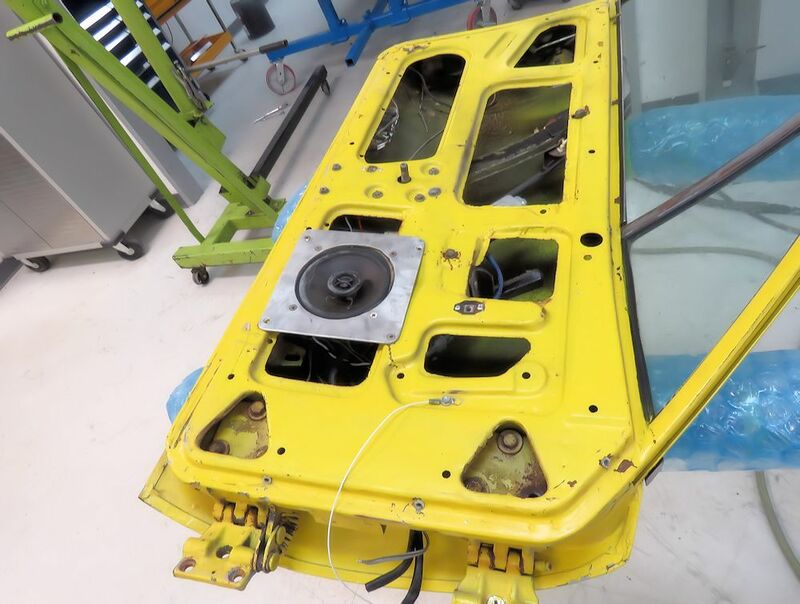 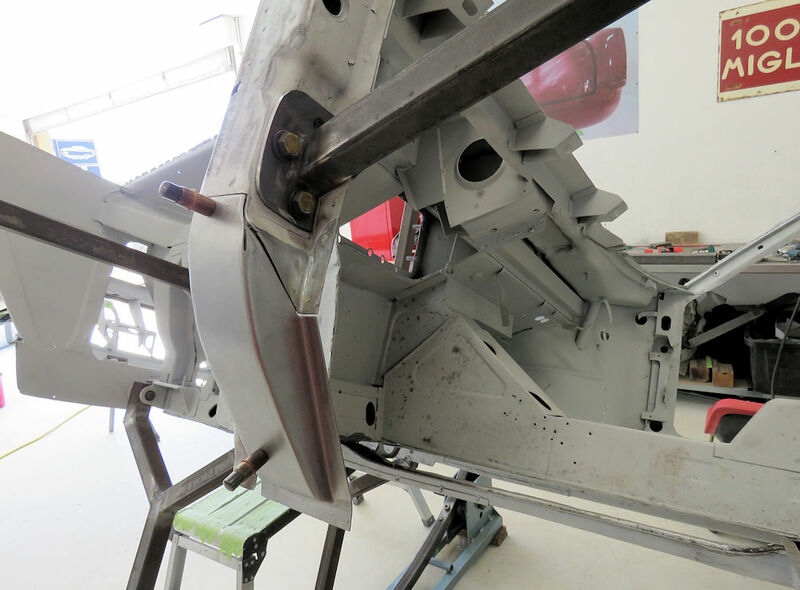 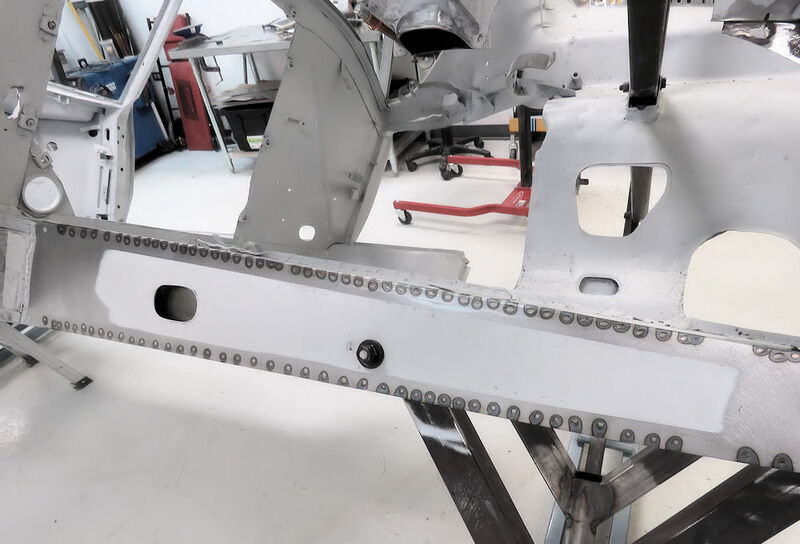 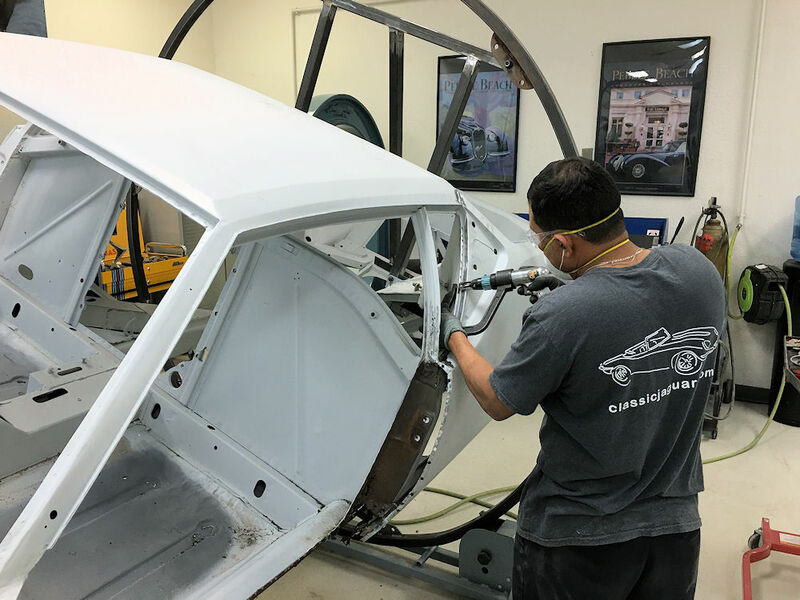 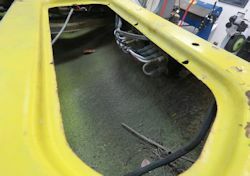 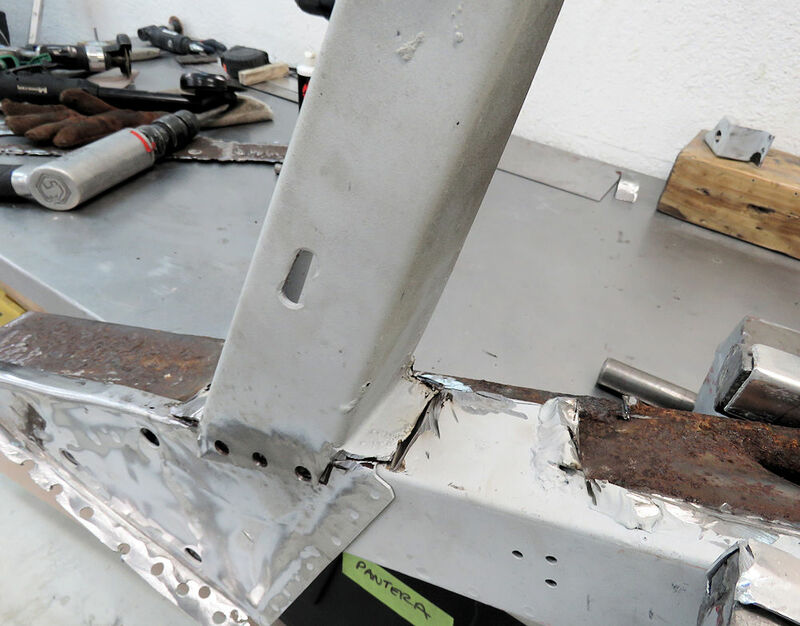 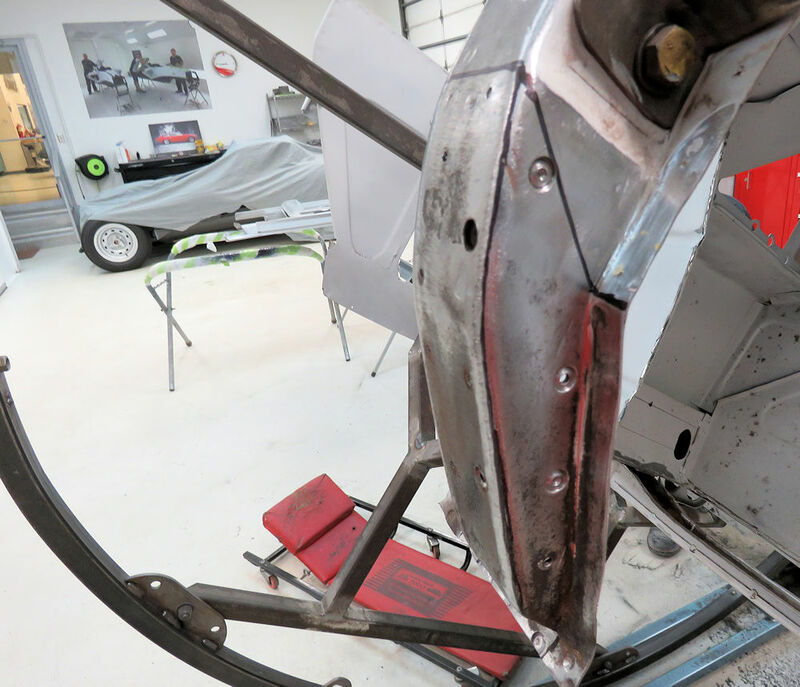 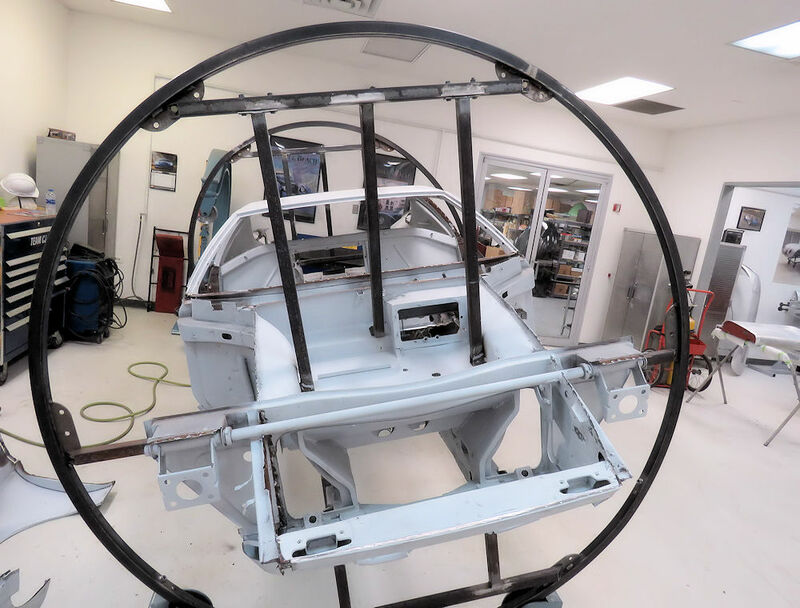 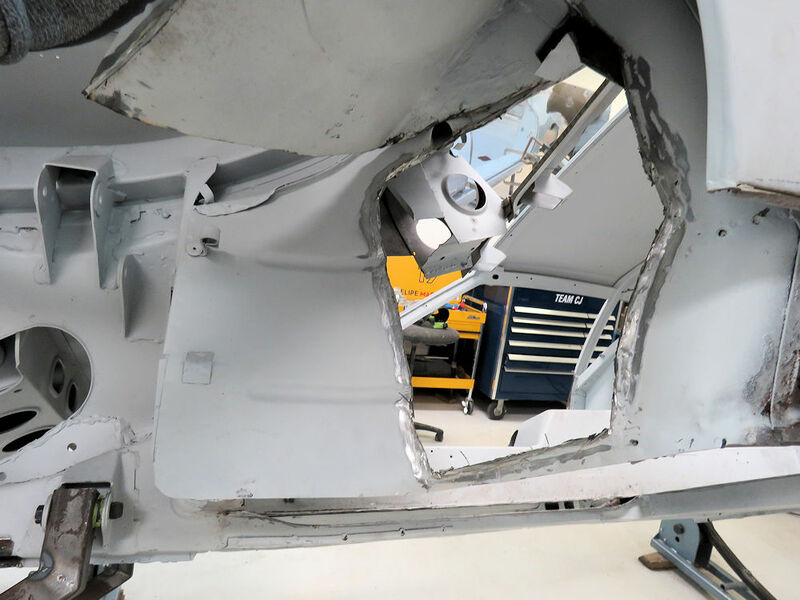 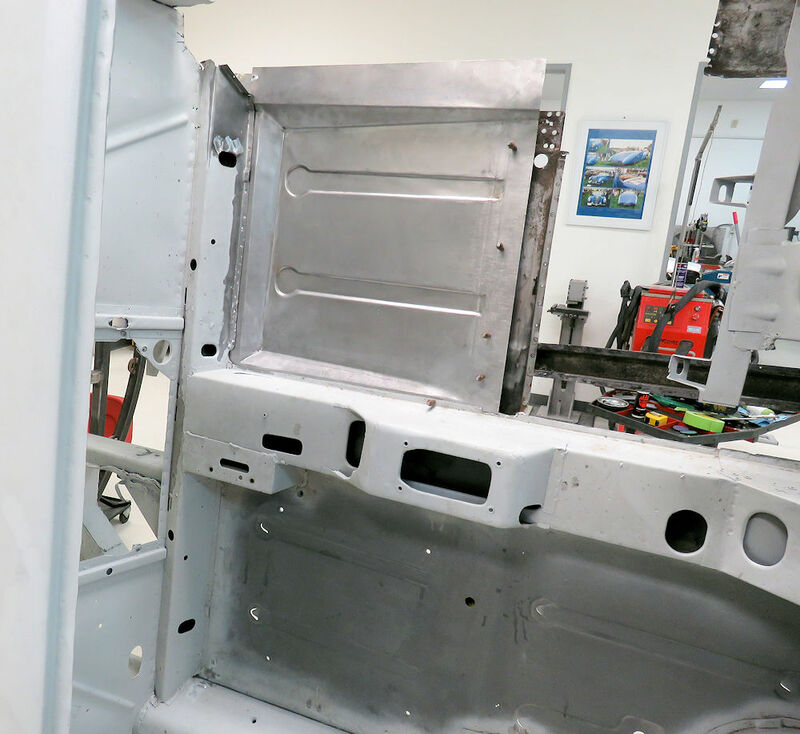 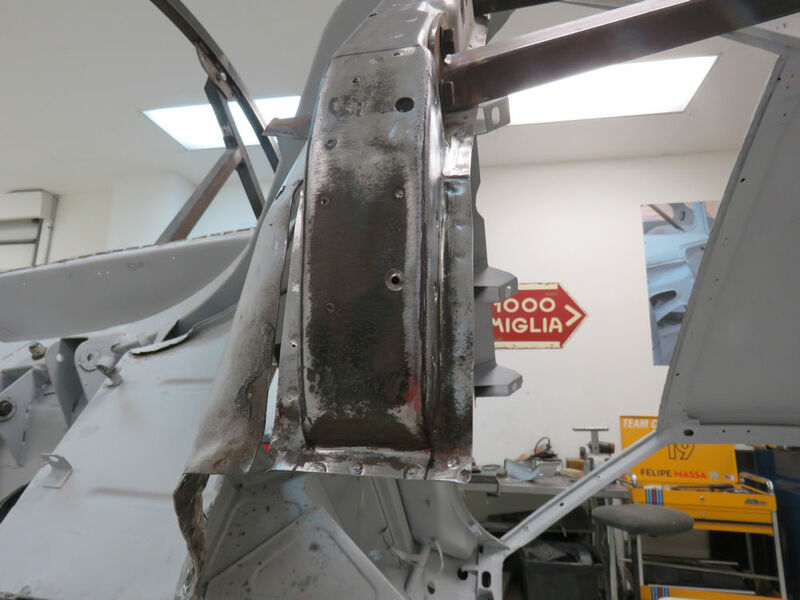 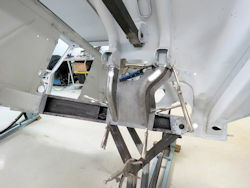 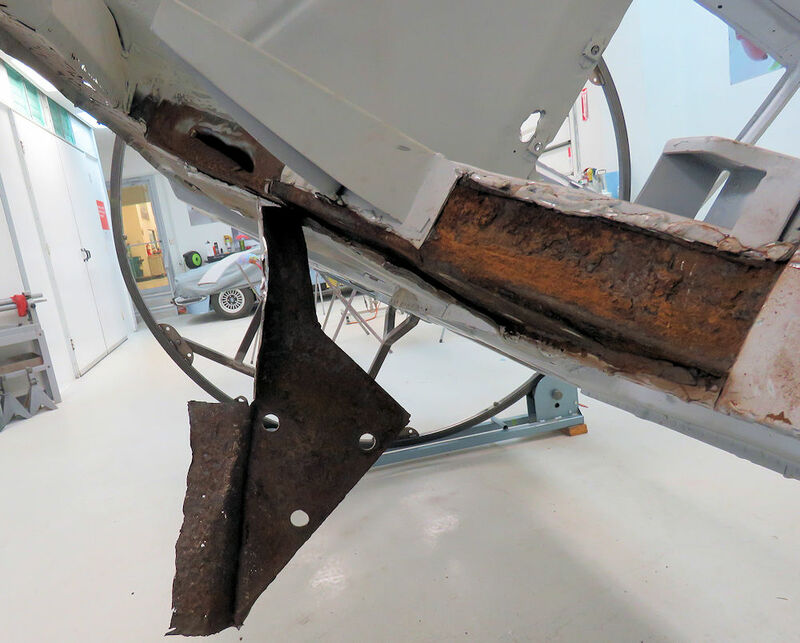 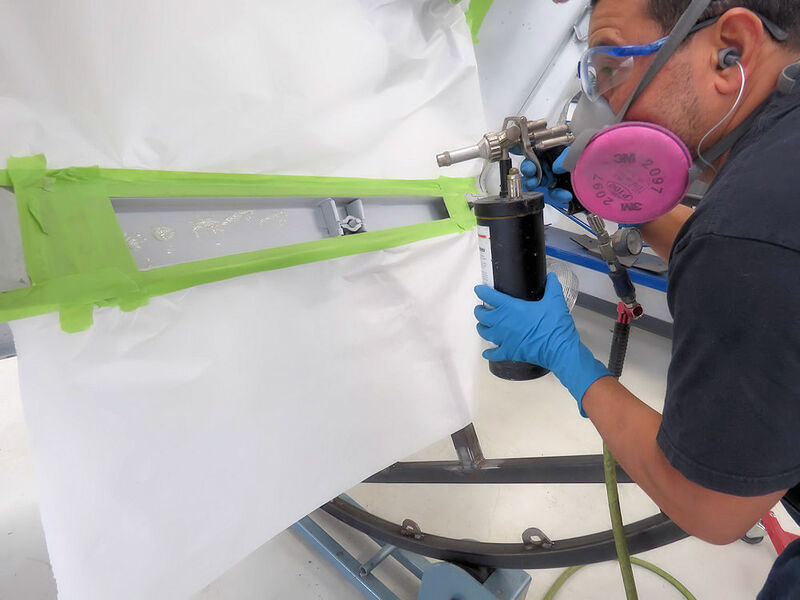 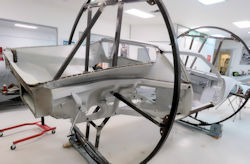 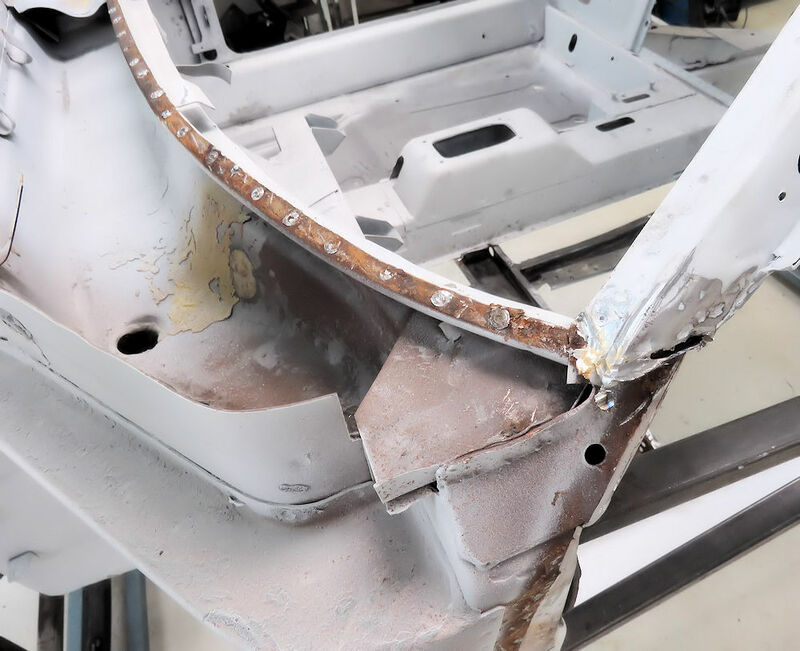 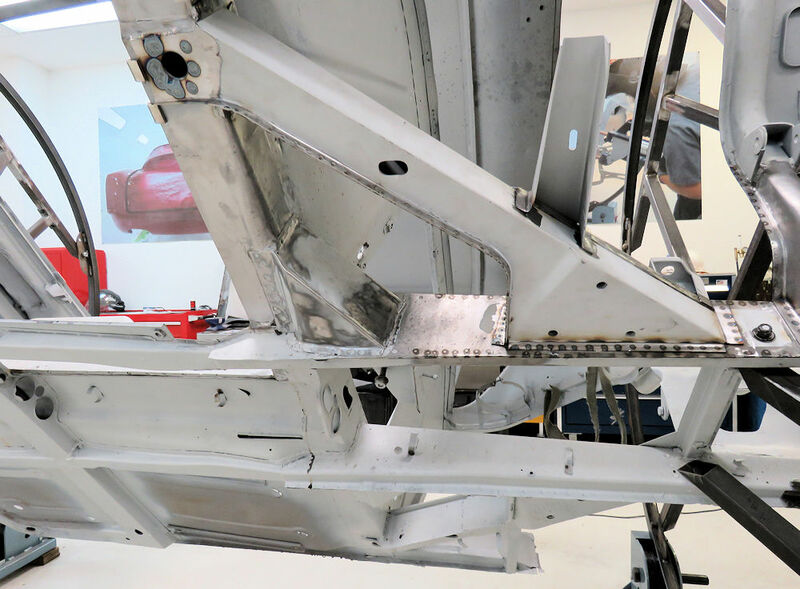 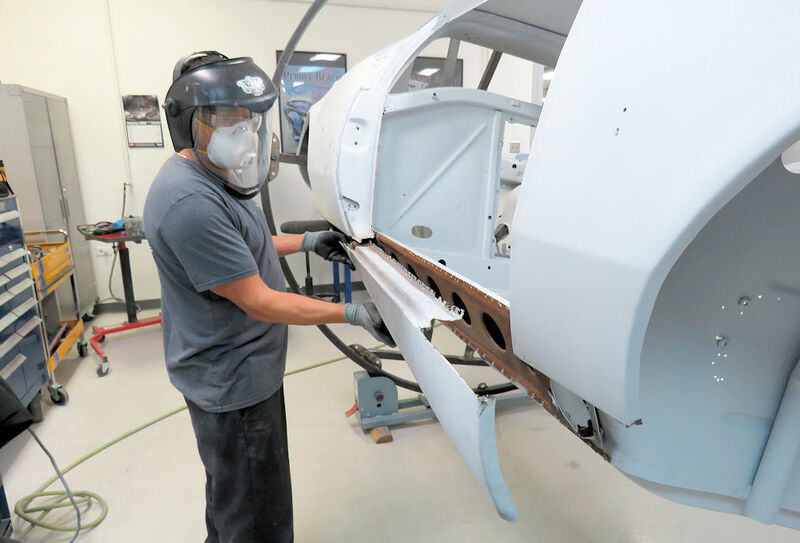 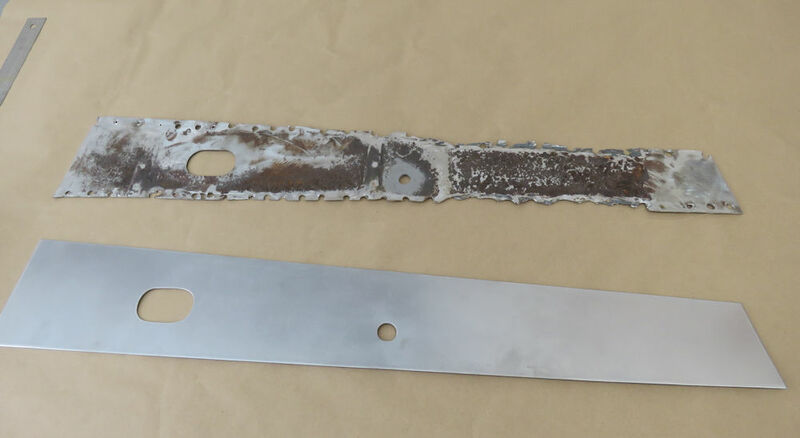 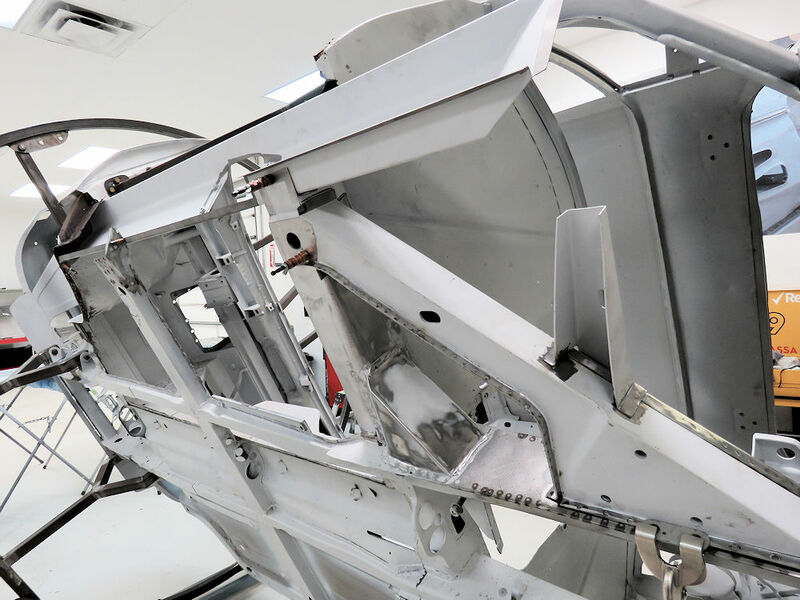 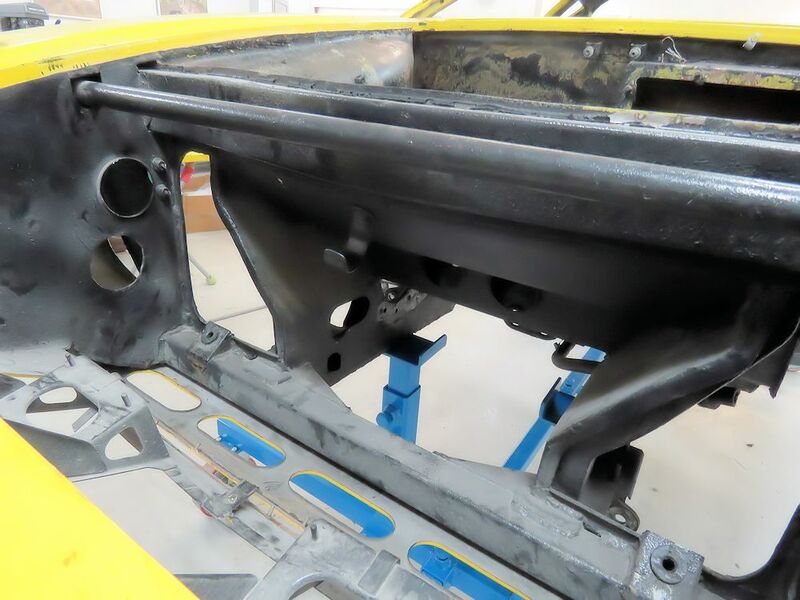 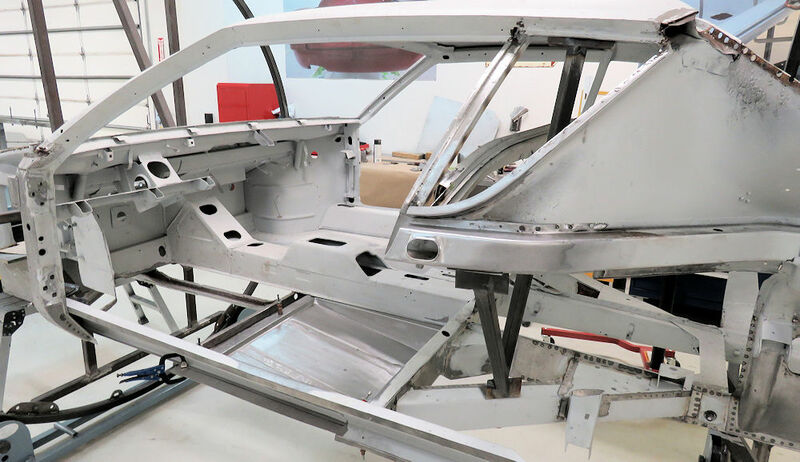 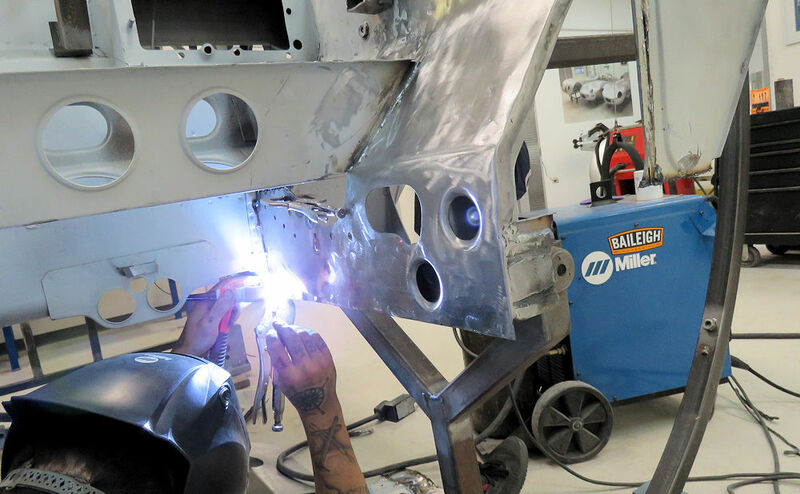 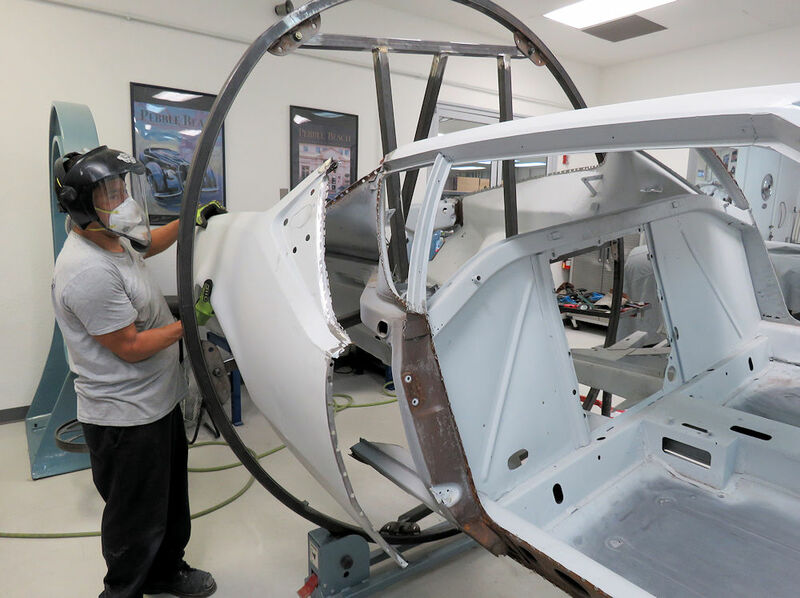 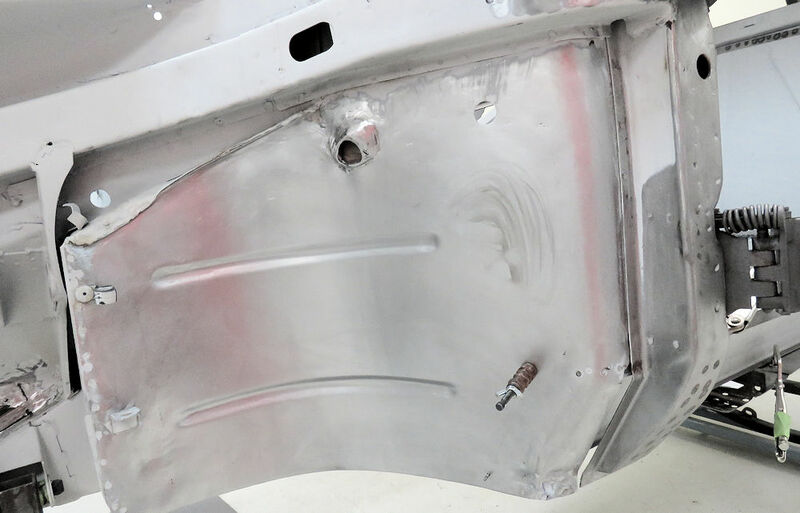 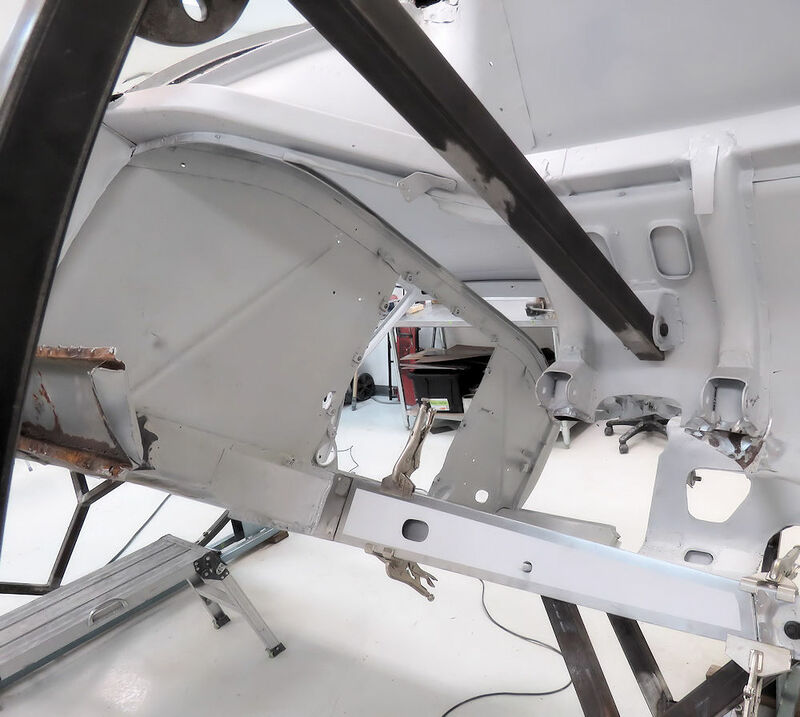 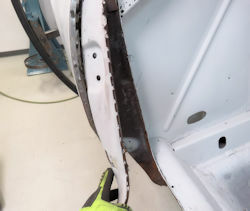 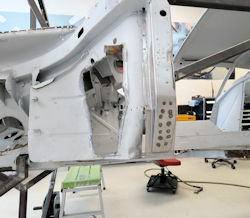 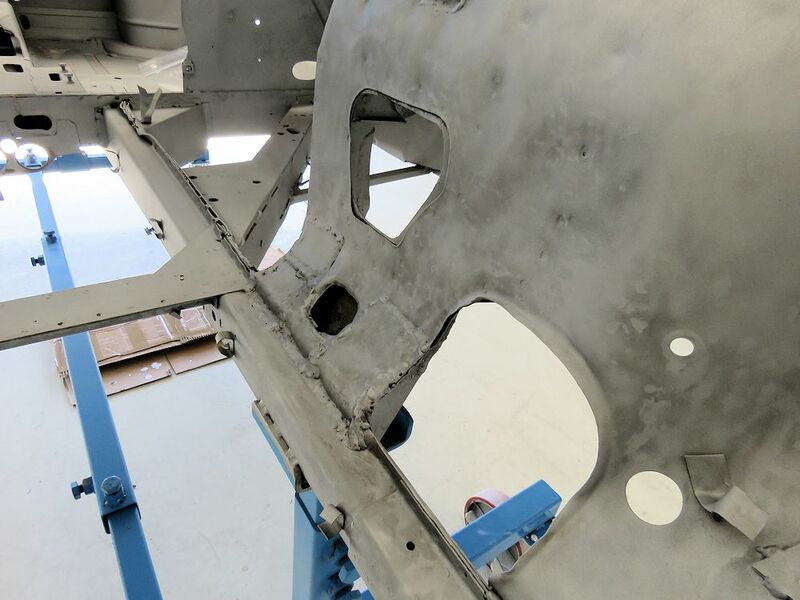 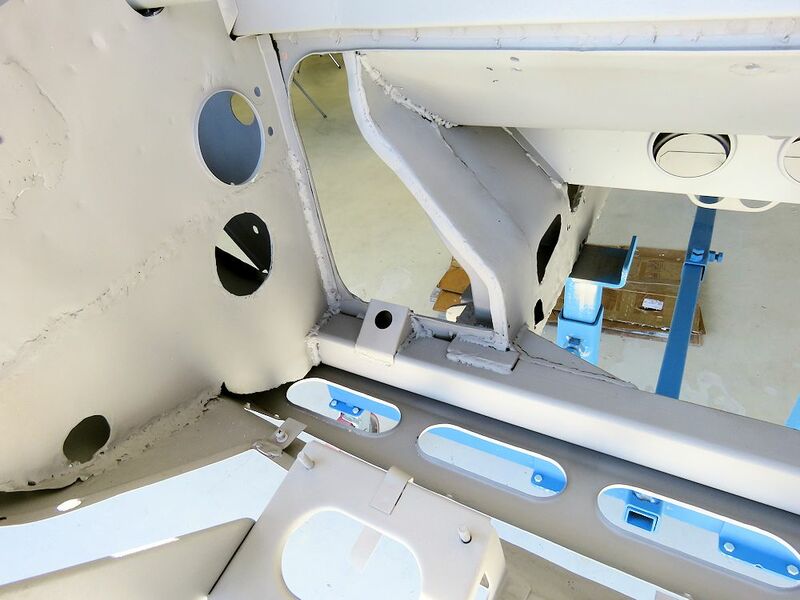 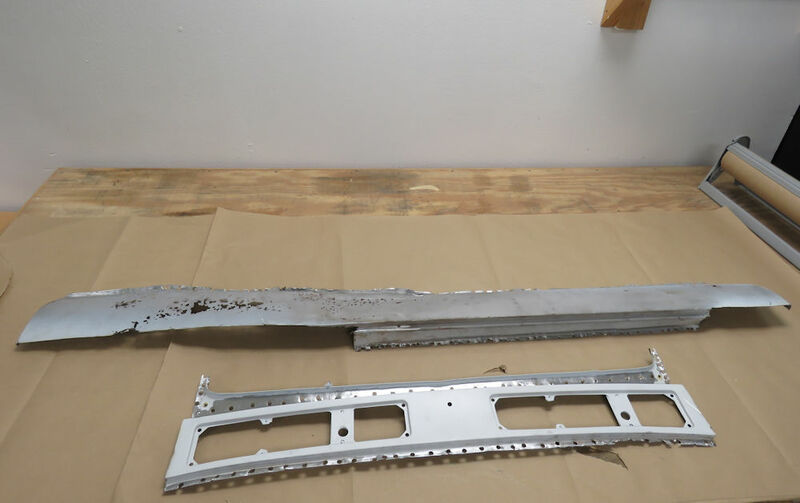 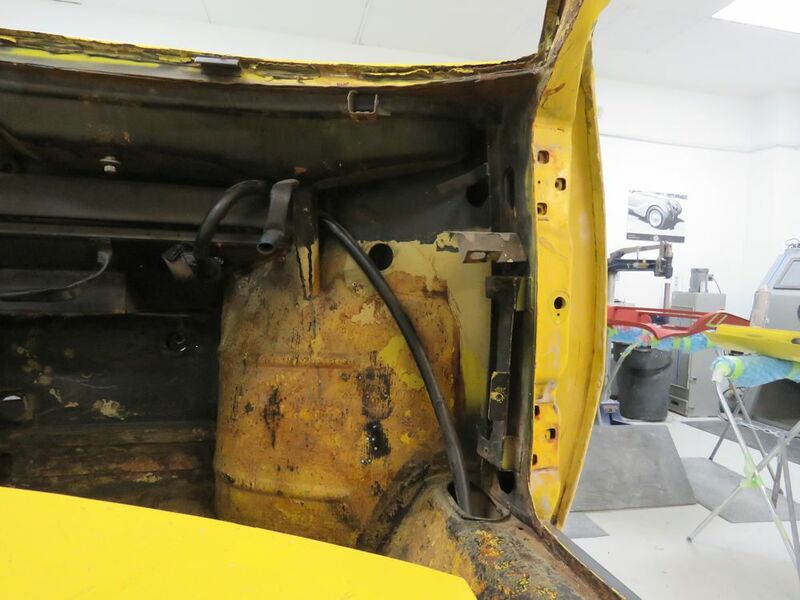 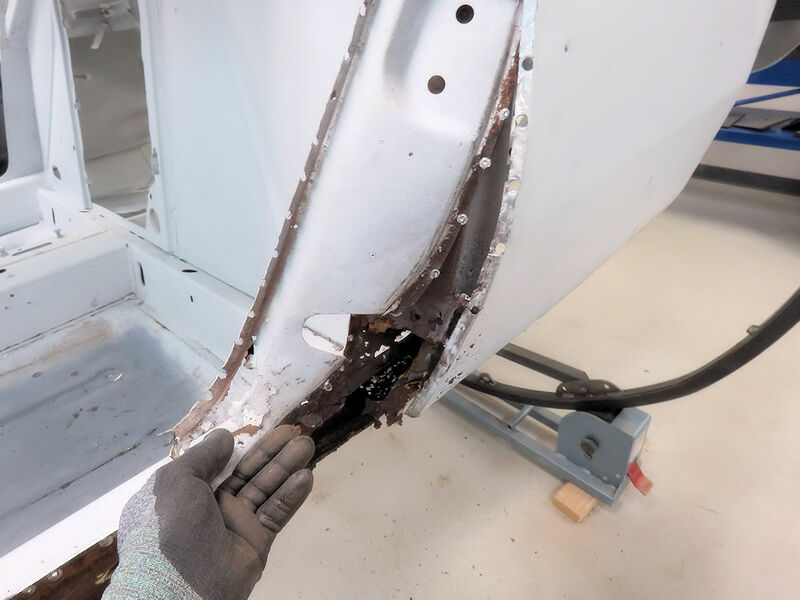 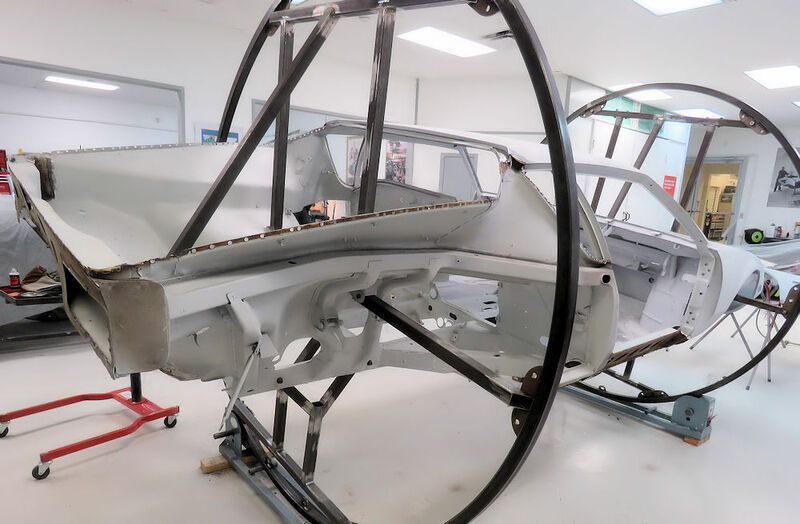 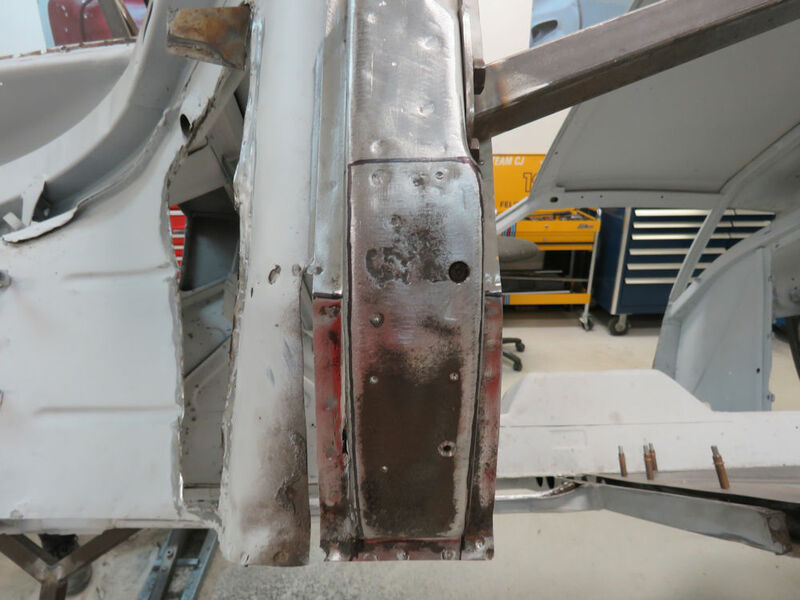 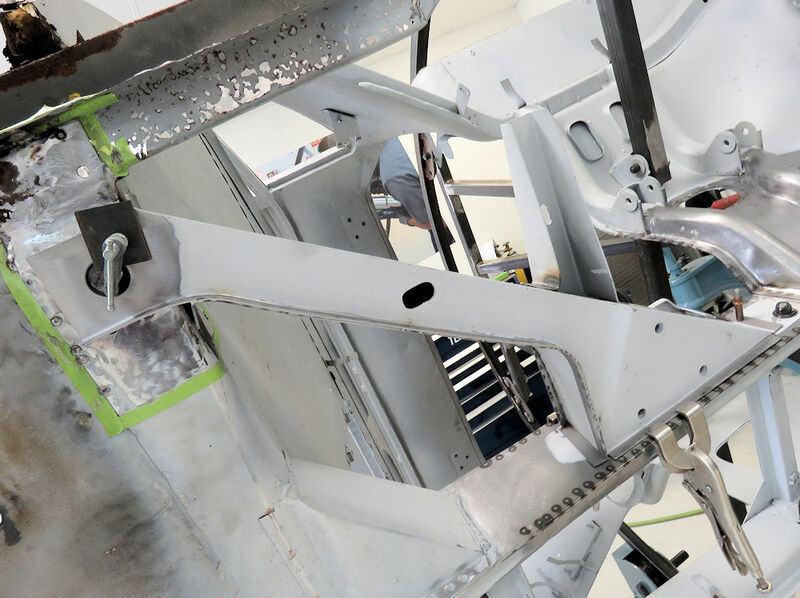 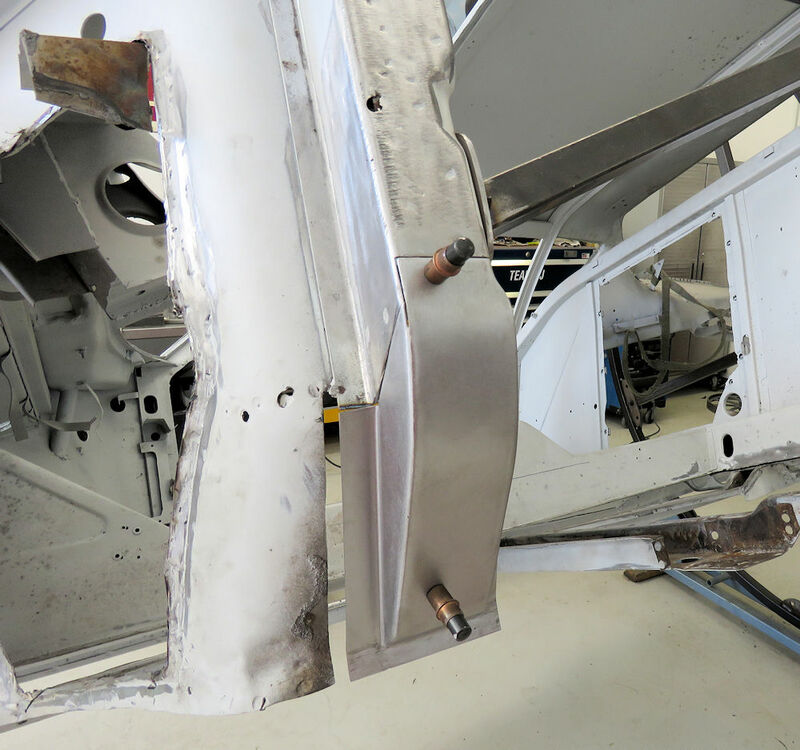 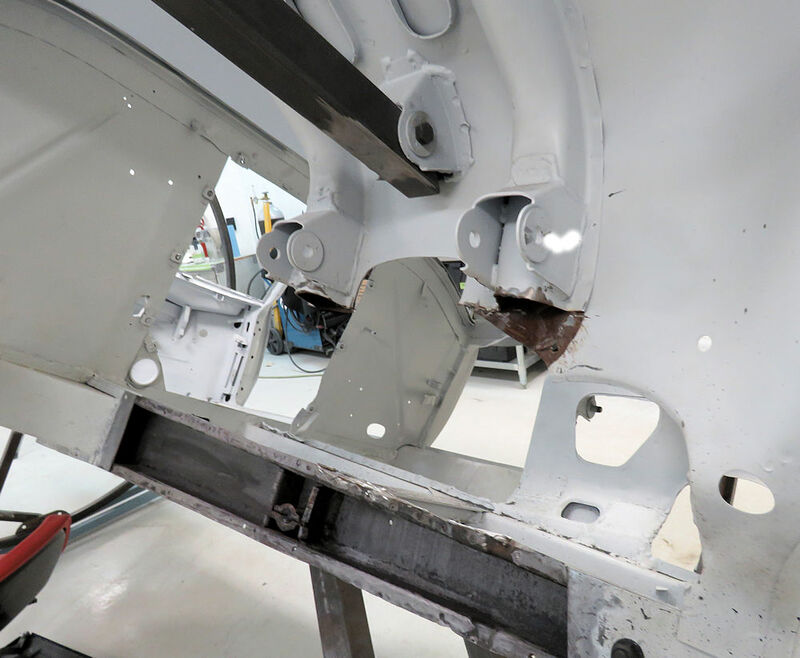 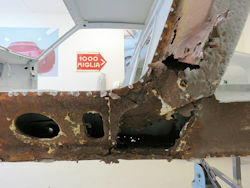 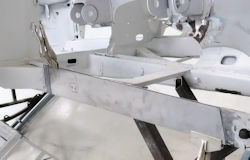 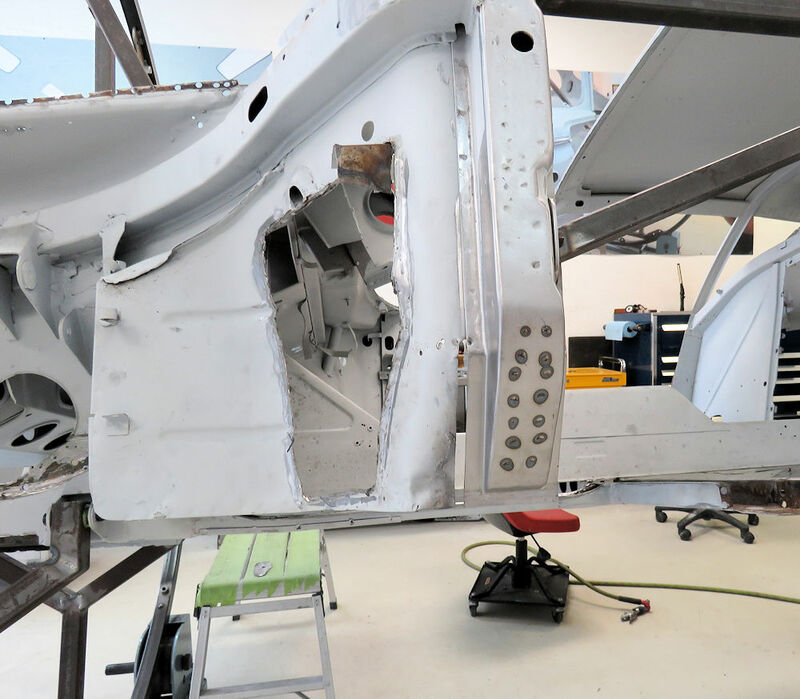 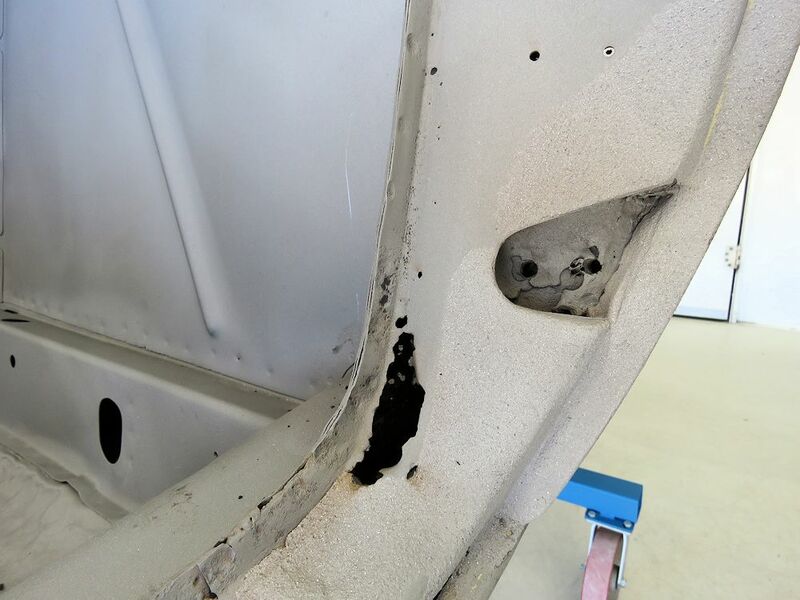 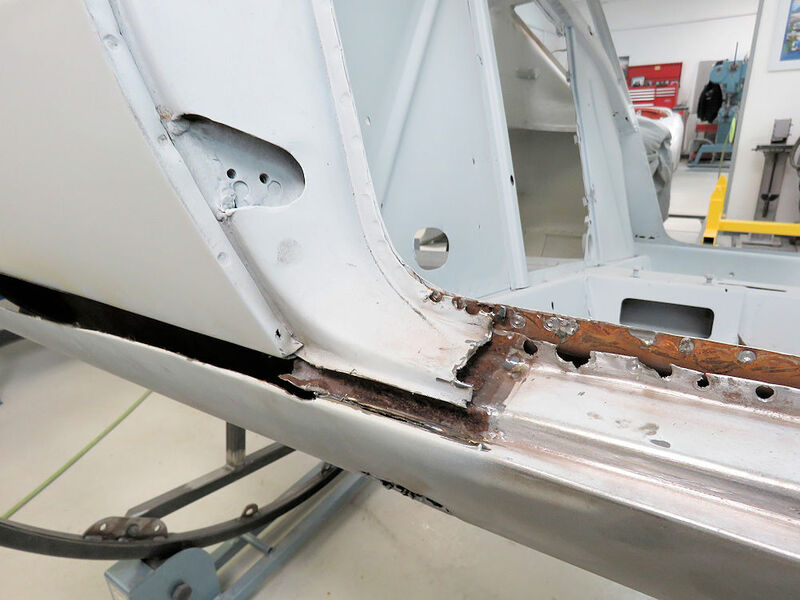 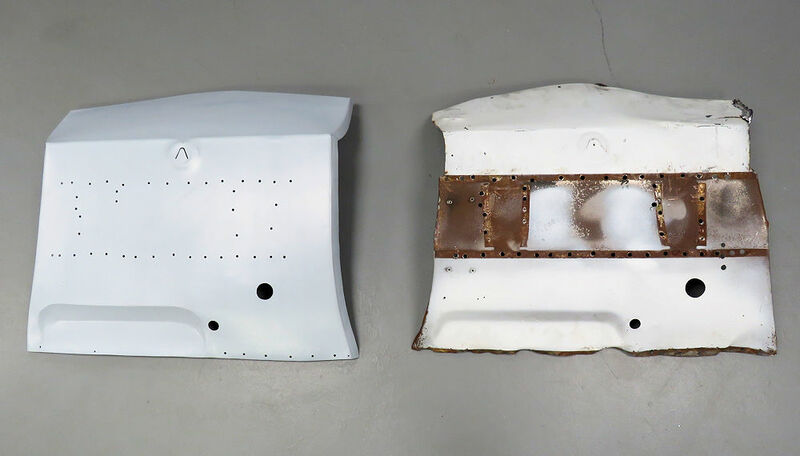 Media blasting the Pantera back to bare metal has unfortunately revealed a fair amount of previously well concealed rust, meaning the car will be enjoying a somewhat extended stay in the Team CJ Coachworks. 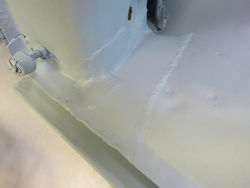 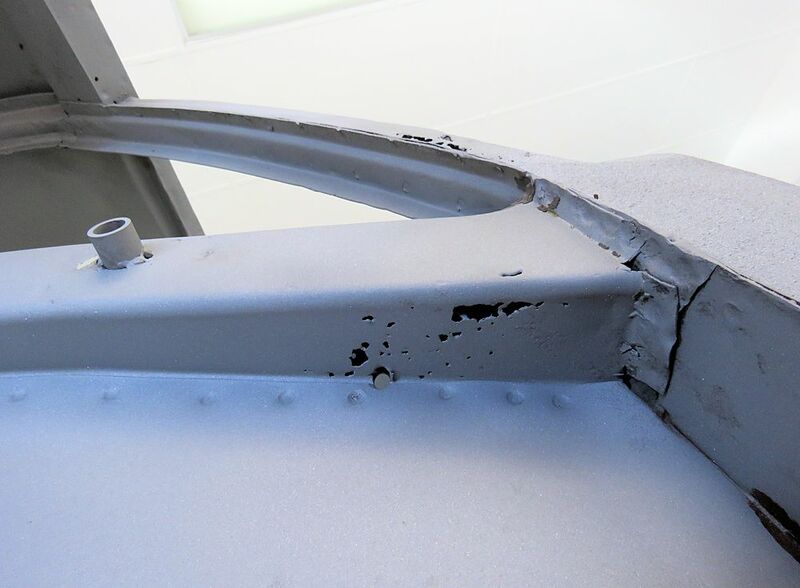 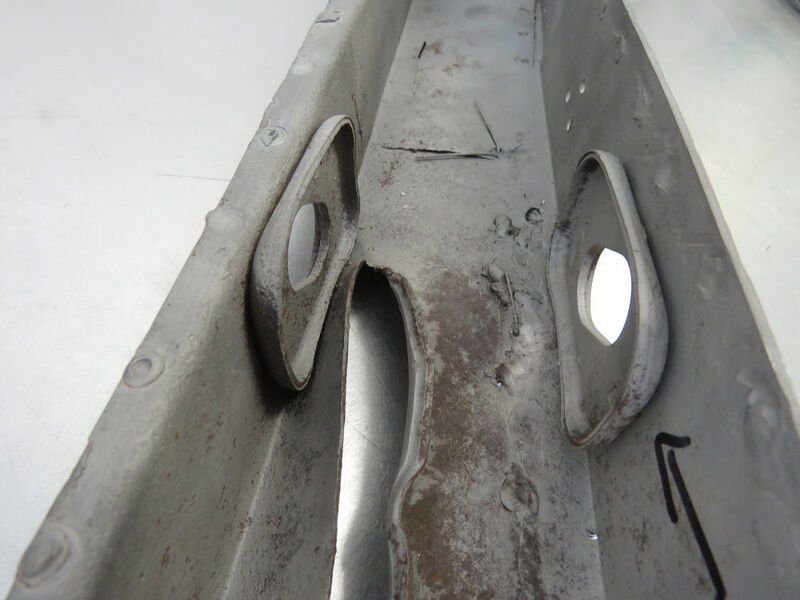 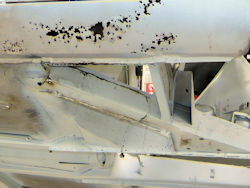 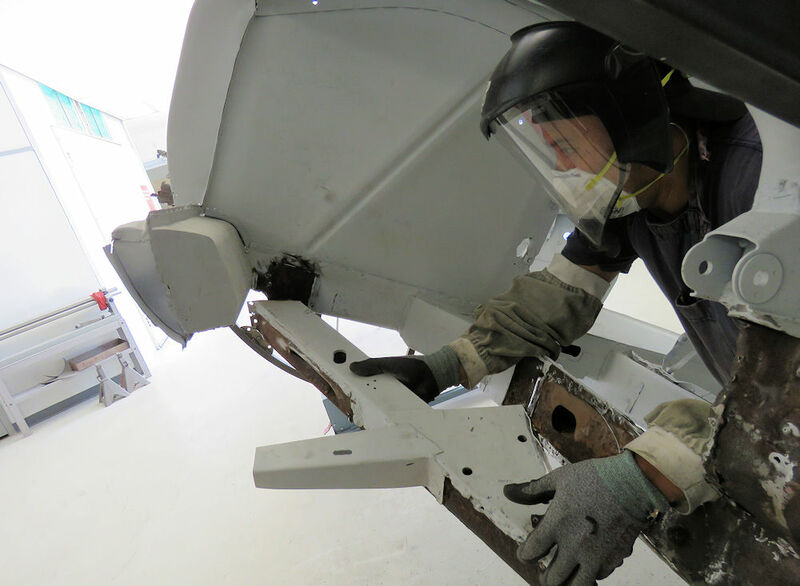 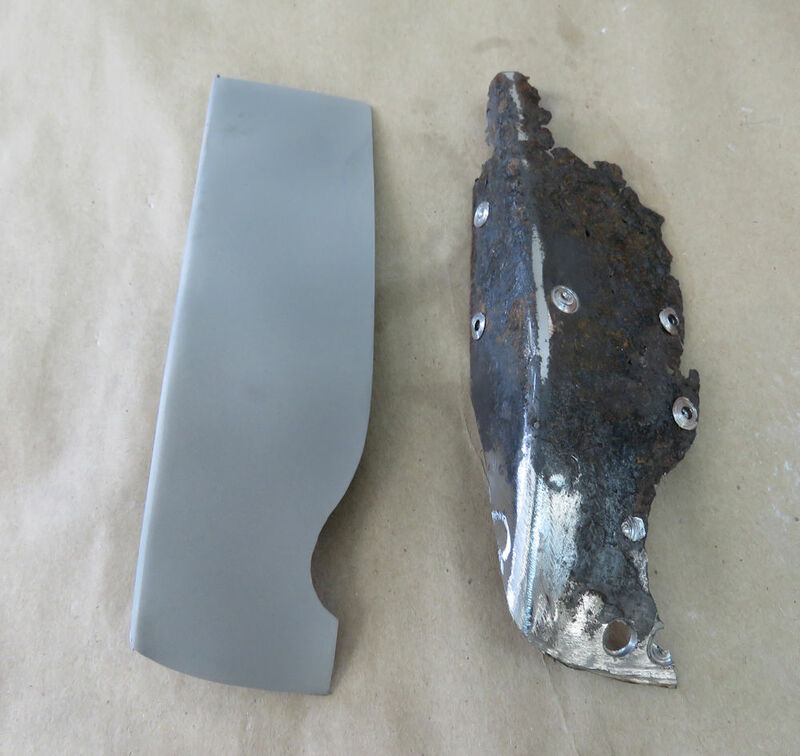 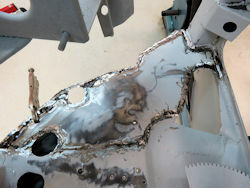 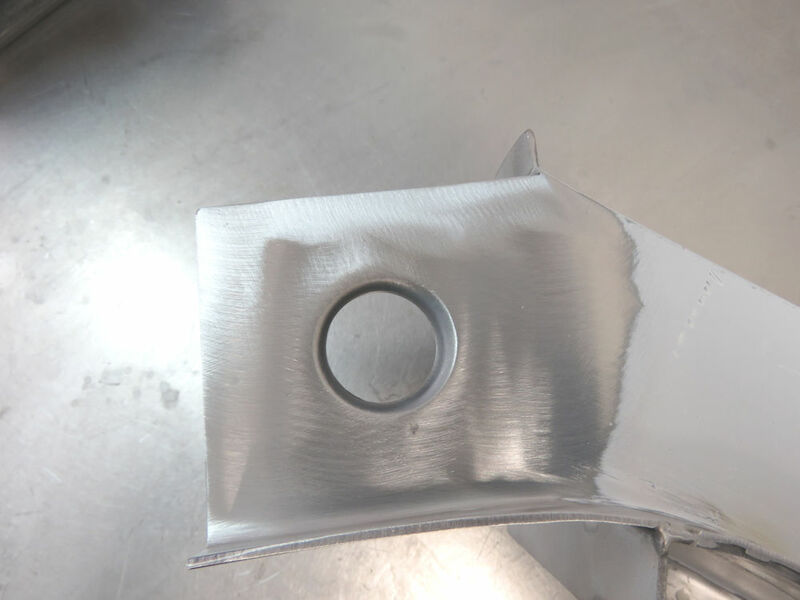 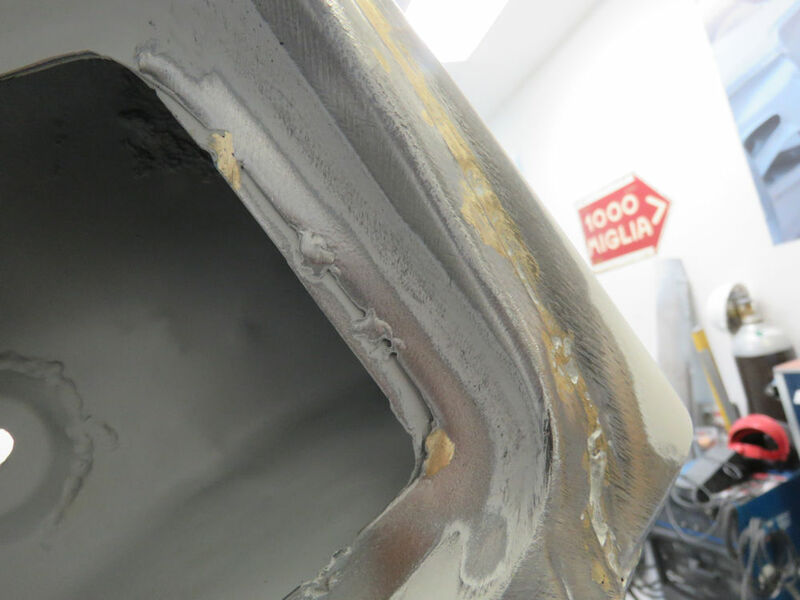 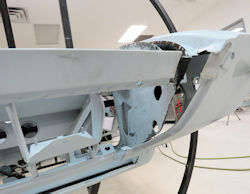 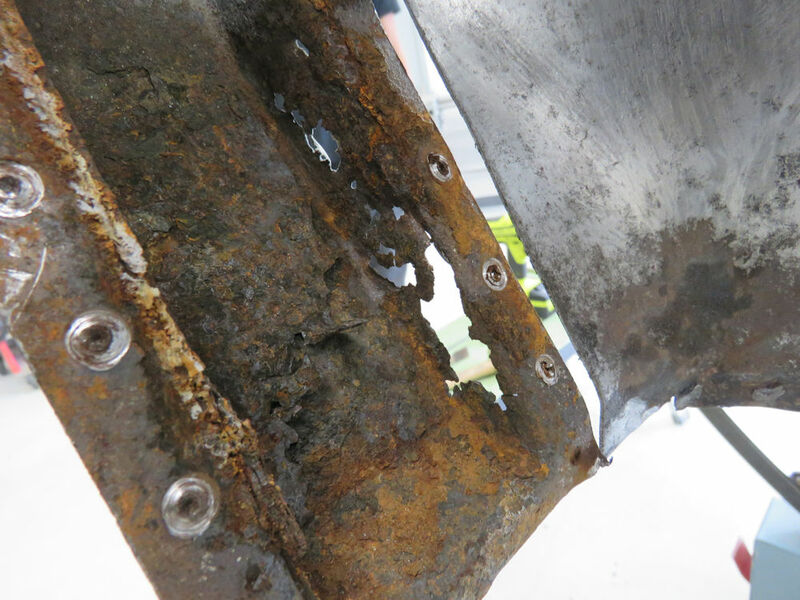 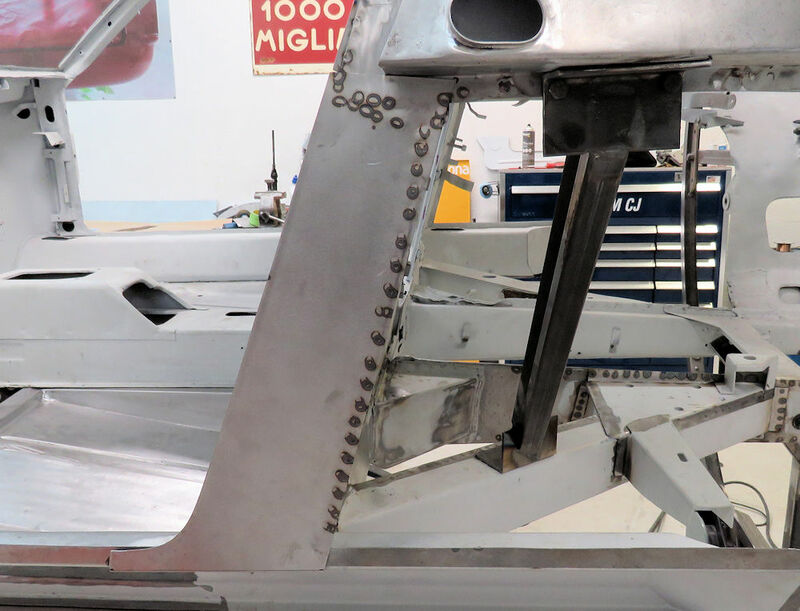 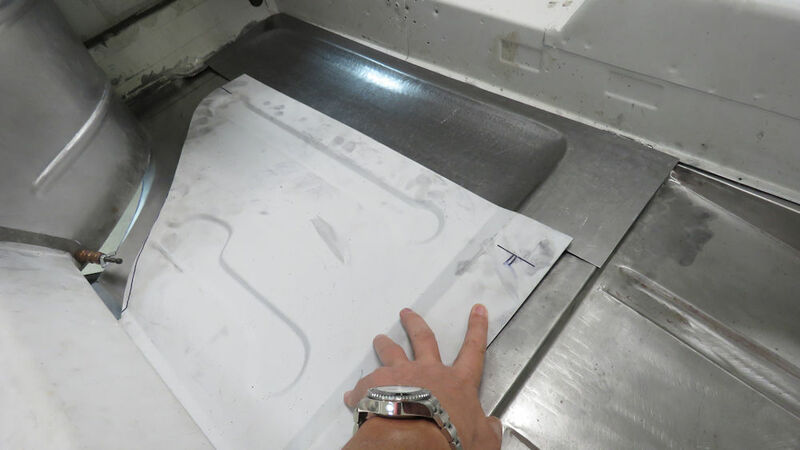 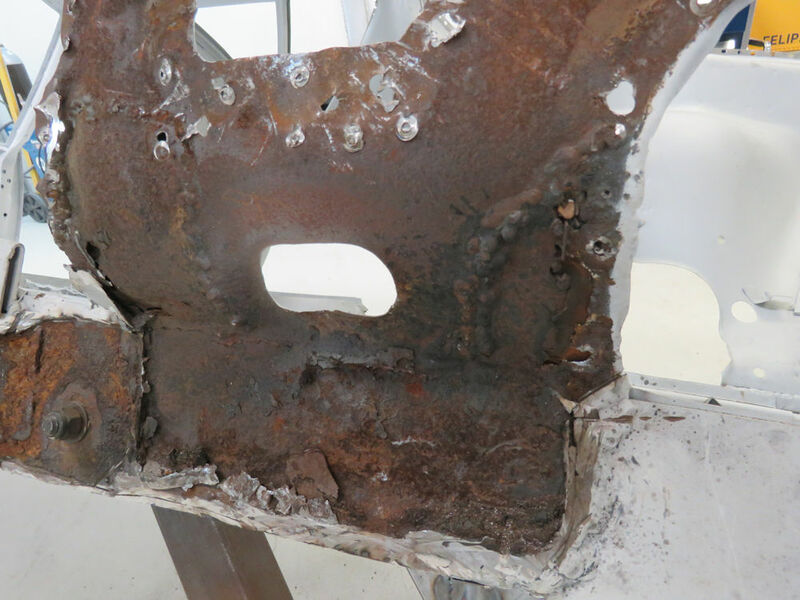 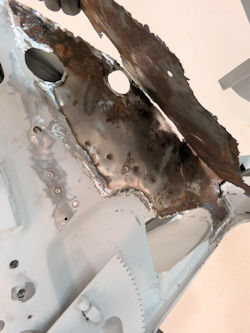 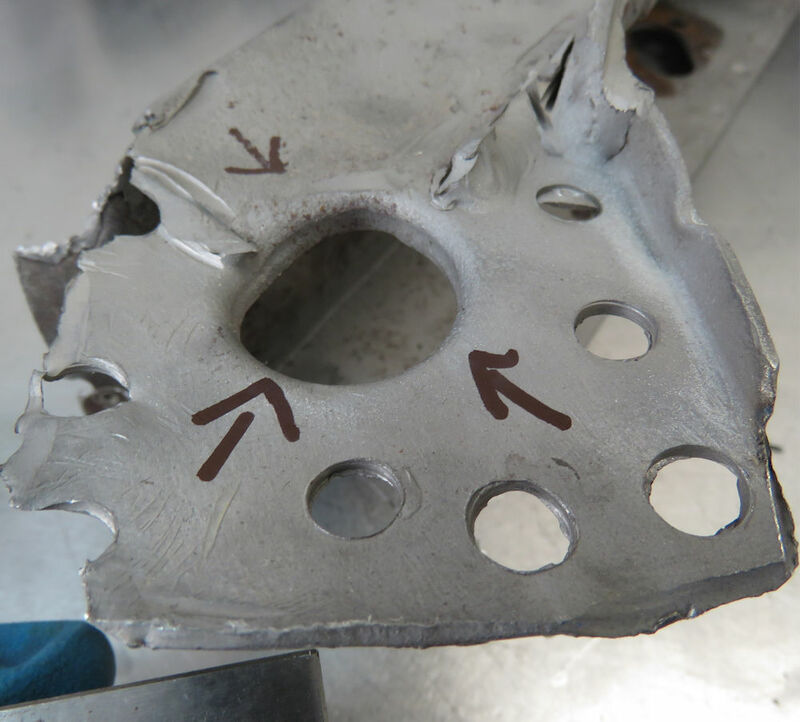 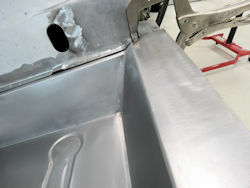 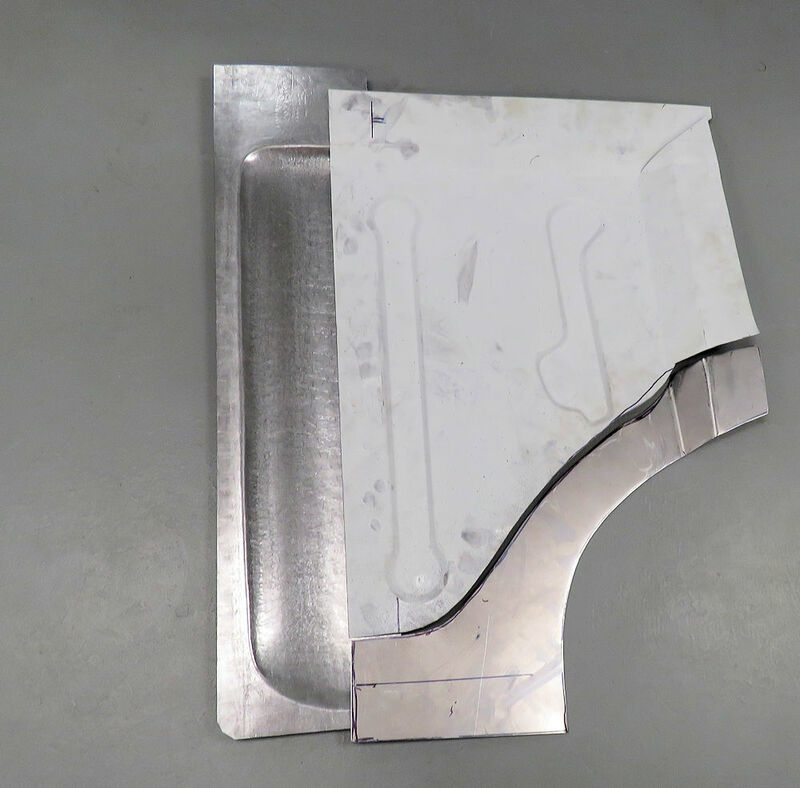 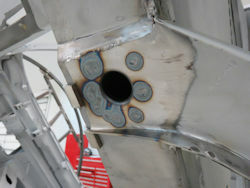 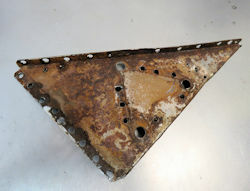 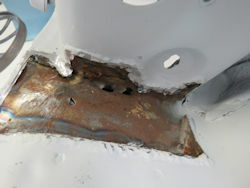 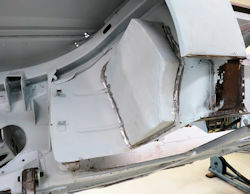 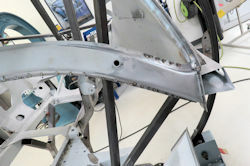 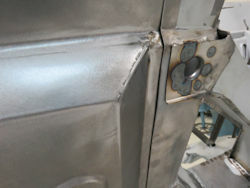 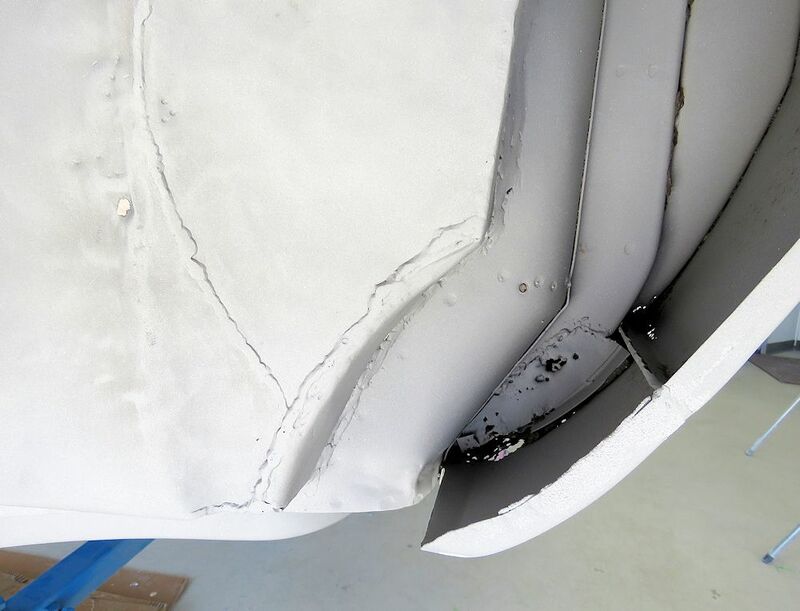 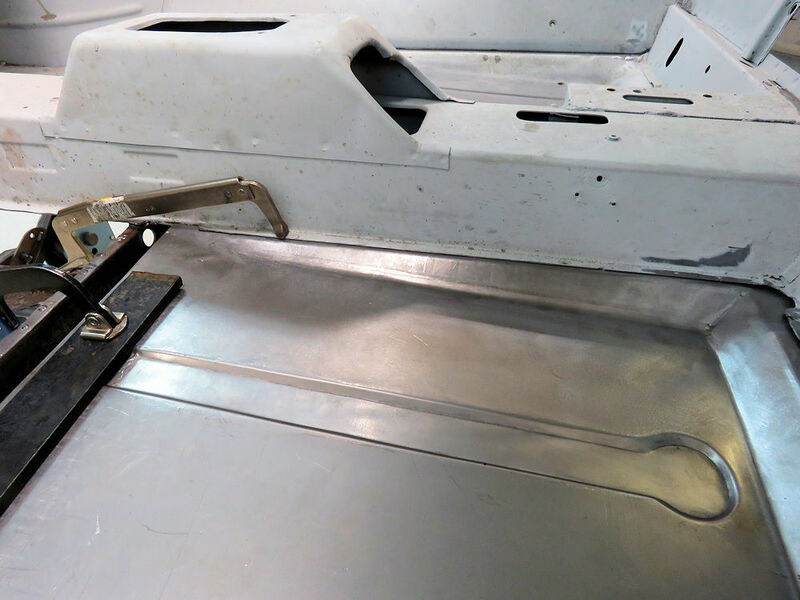 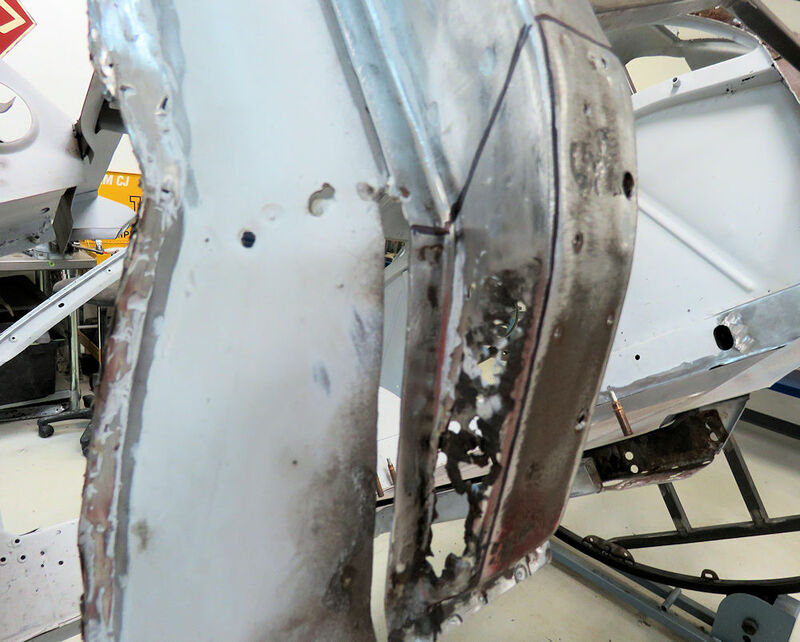 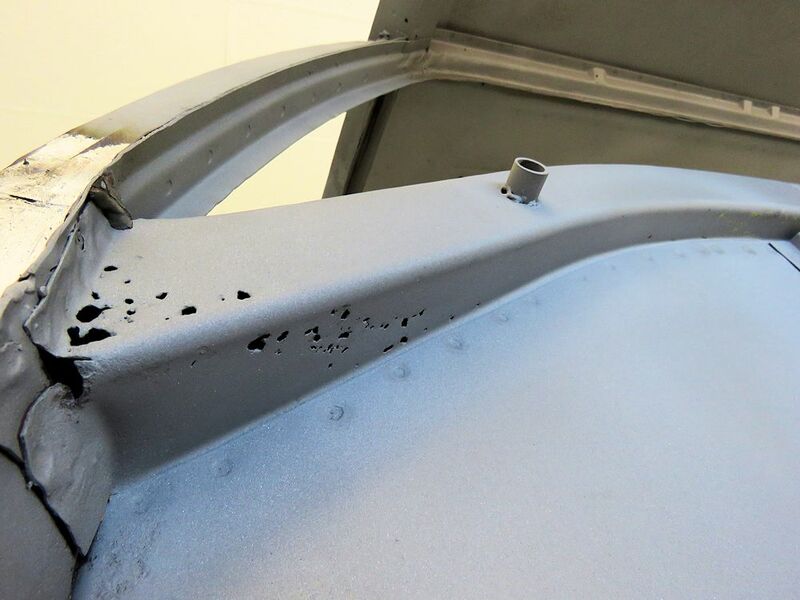 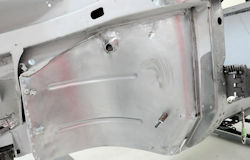 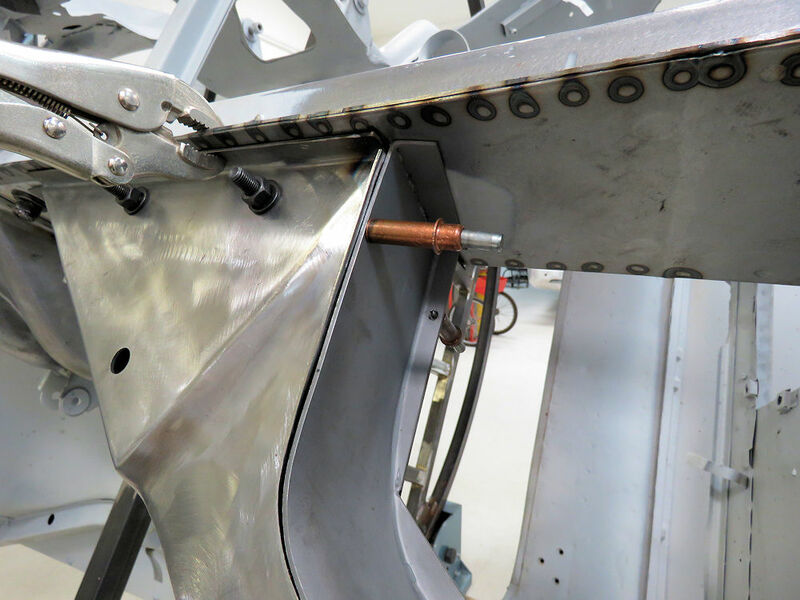 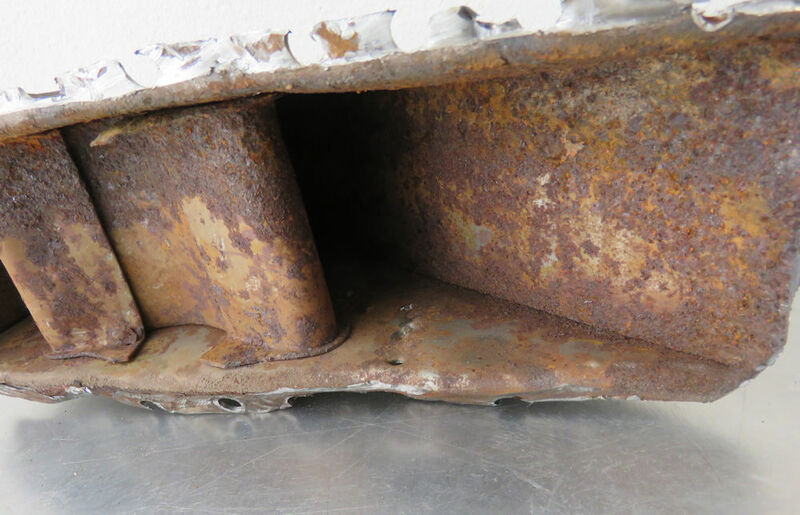 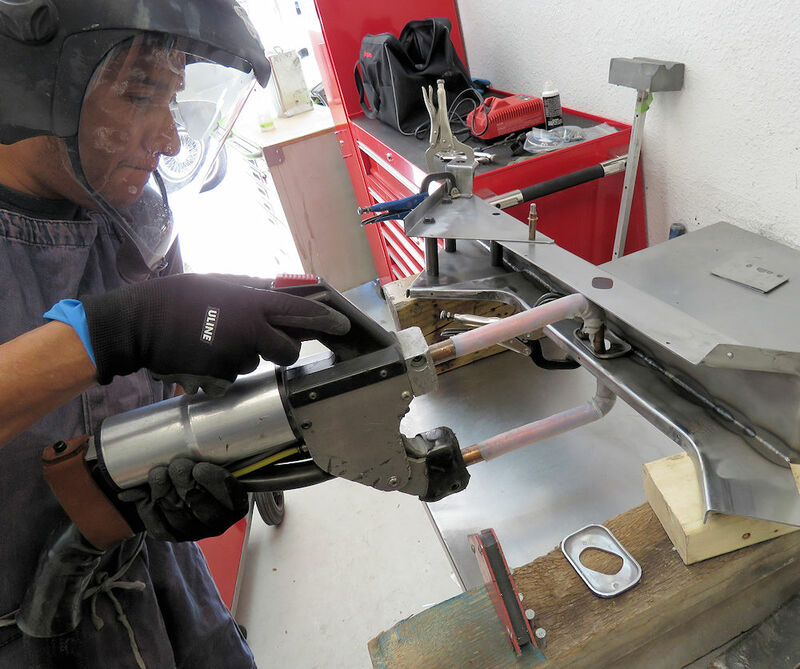 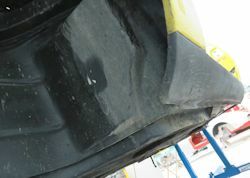 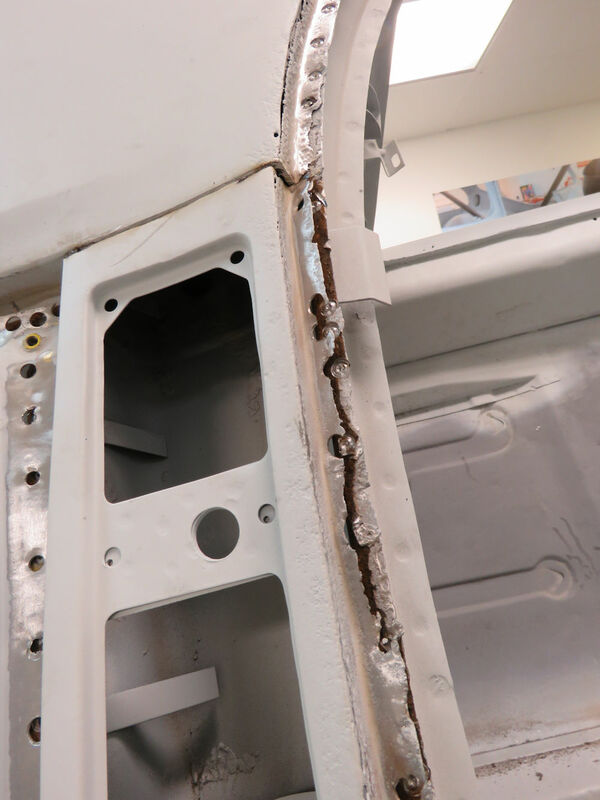 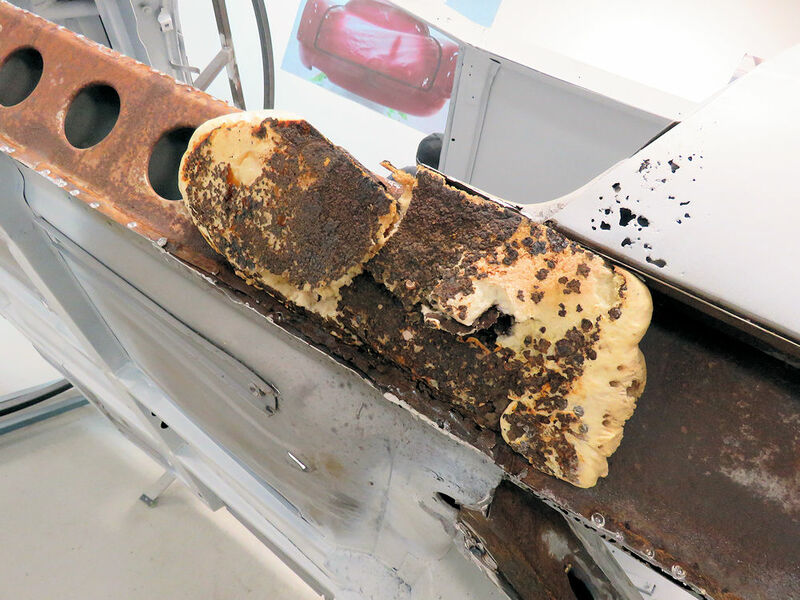 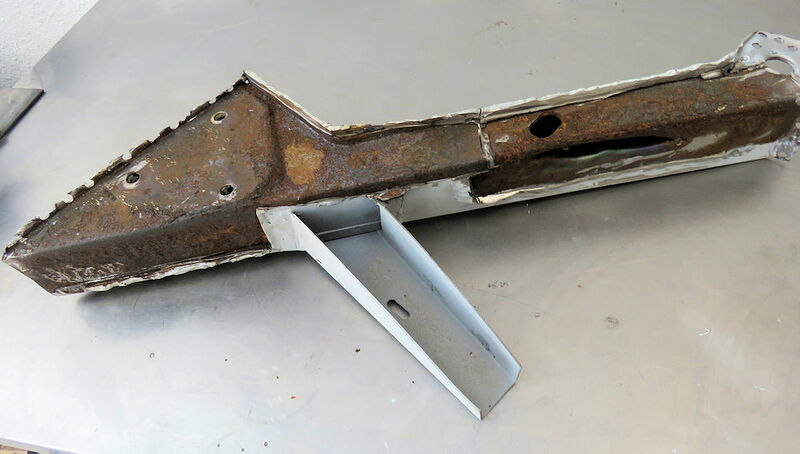 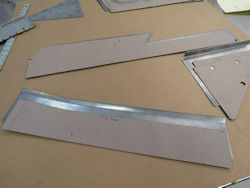 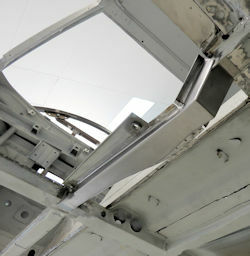 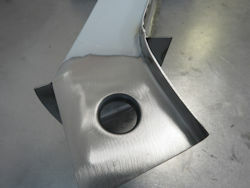 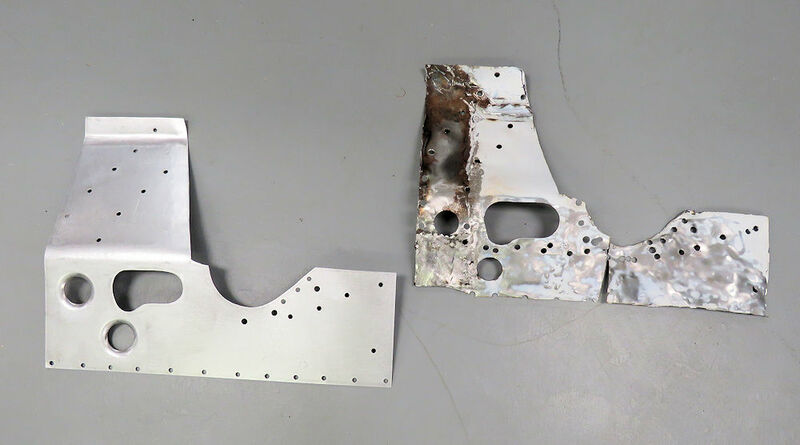 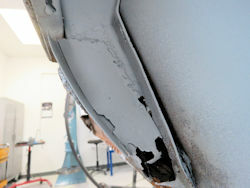 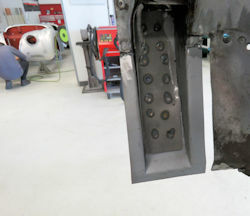 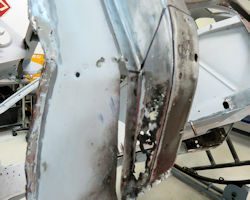 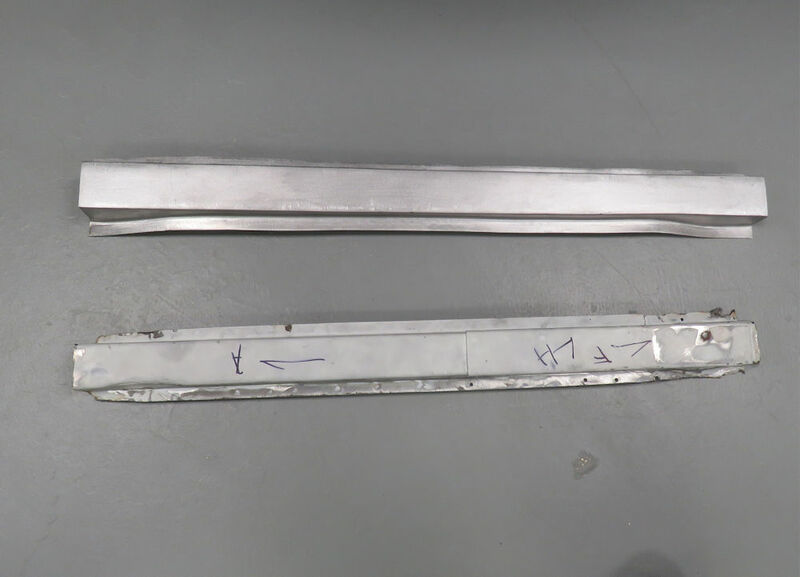 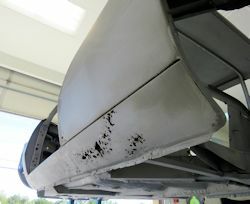 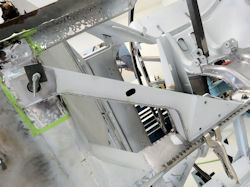 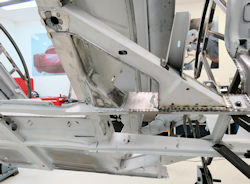 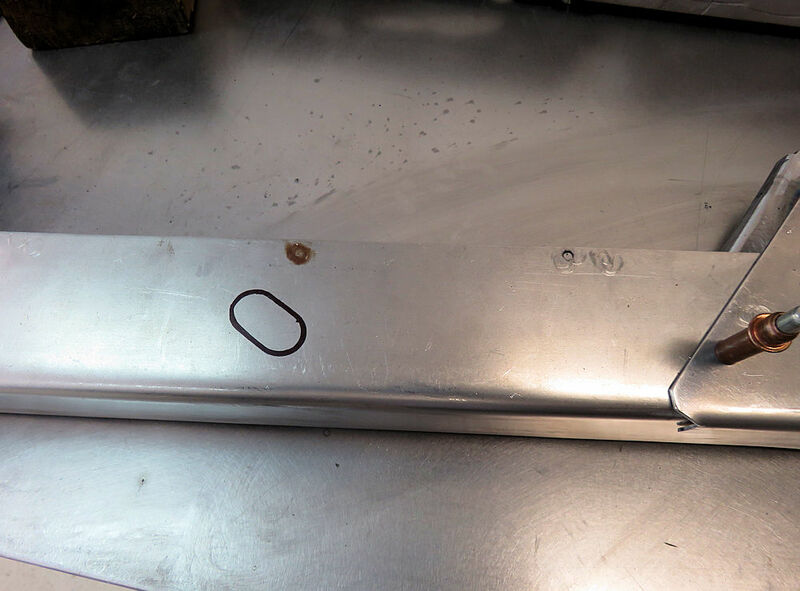 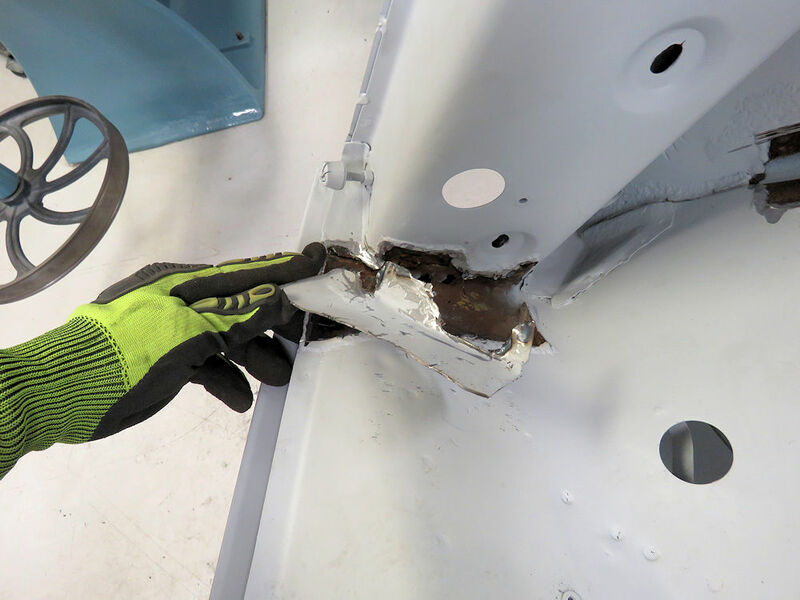 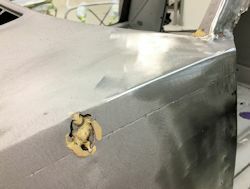 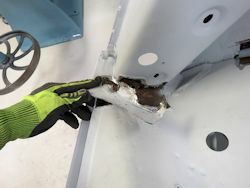 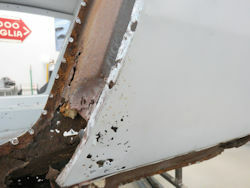 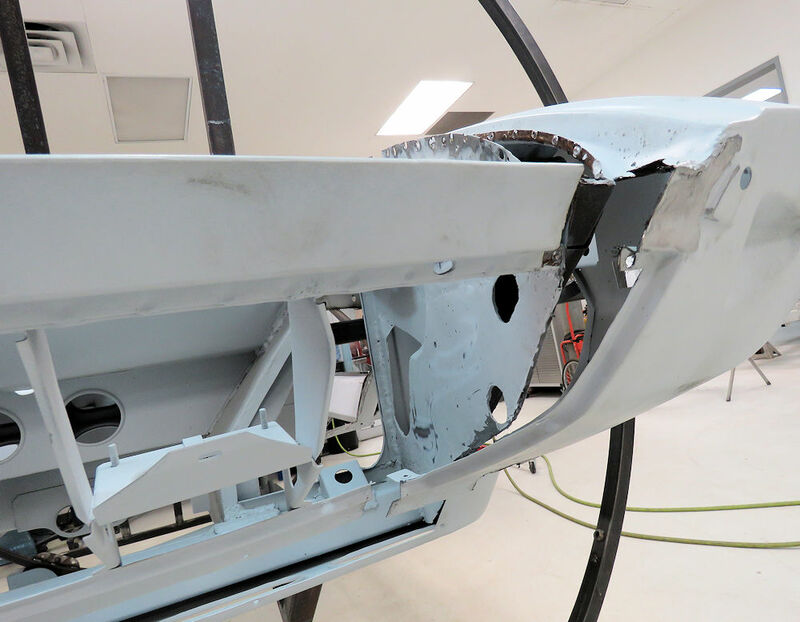 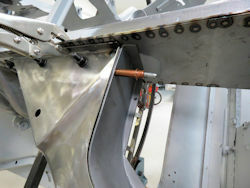 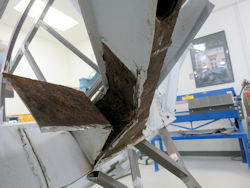 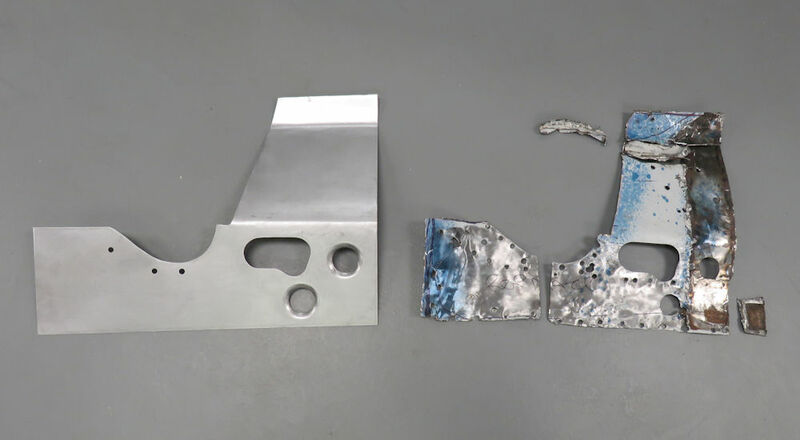 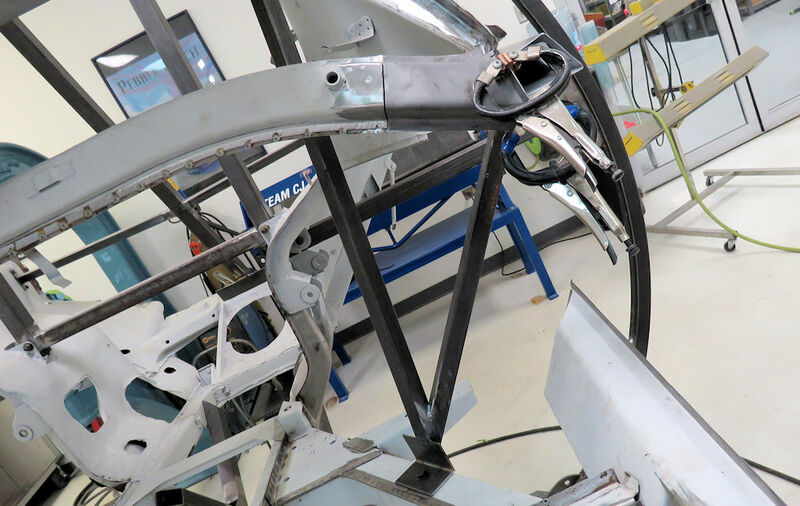 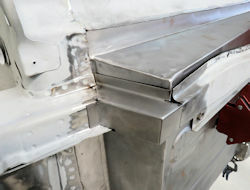 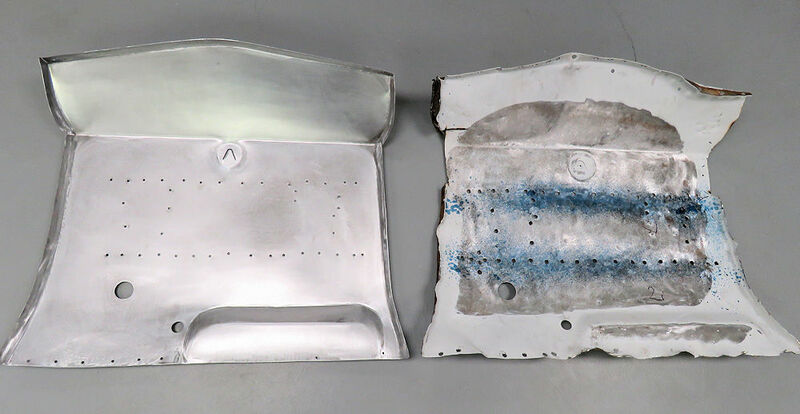 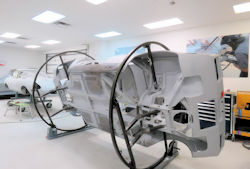 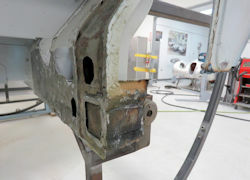 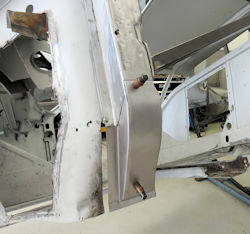 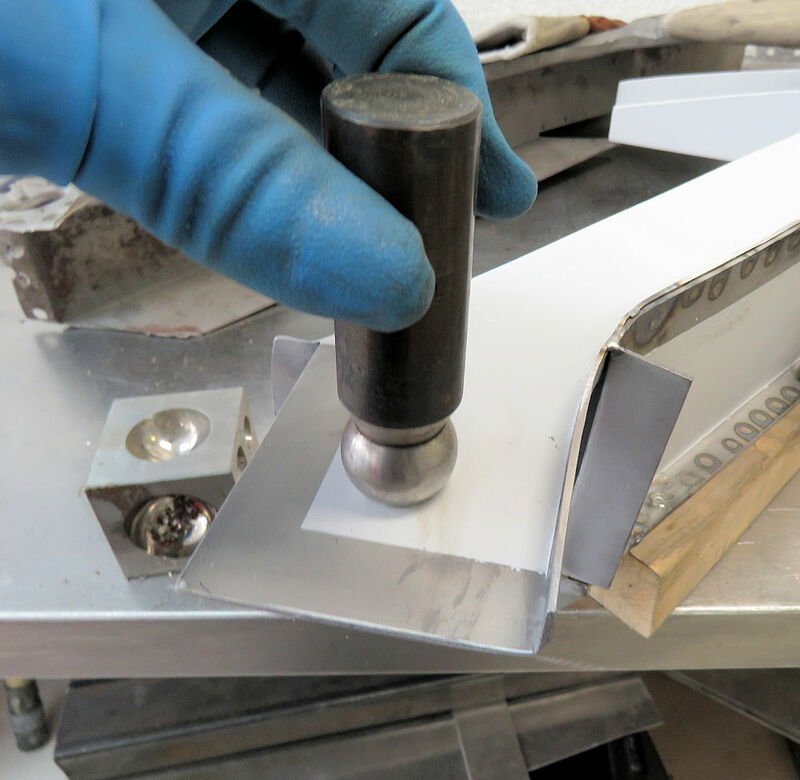 The blasting process has also exposed some rather 'industrial' welding throughout the monocoque. 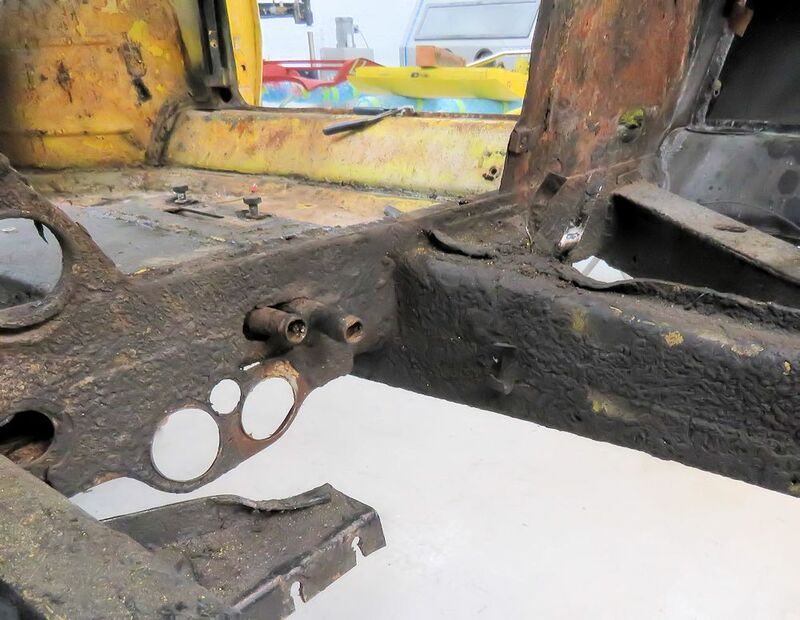 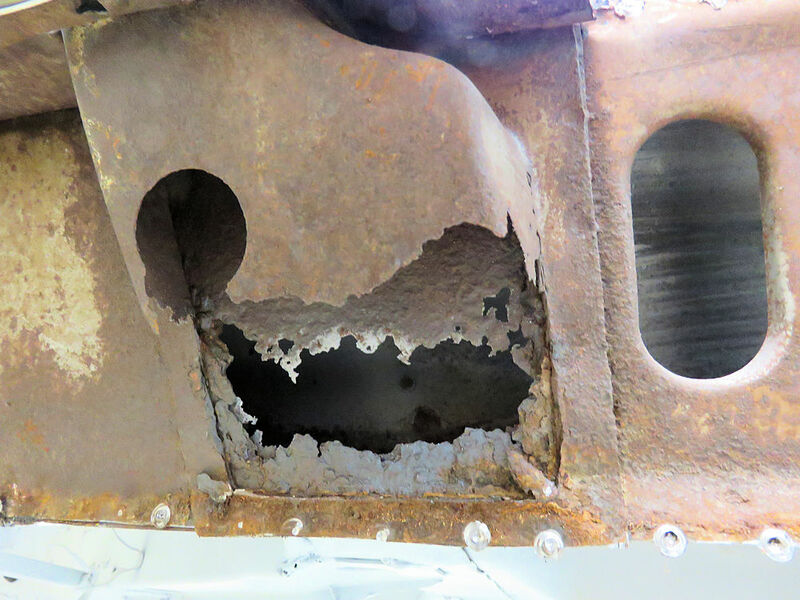 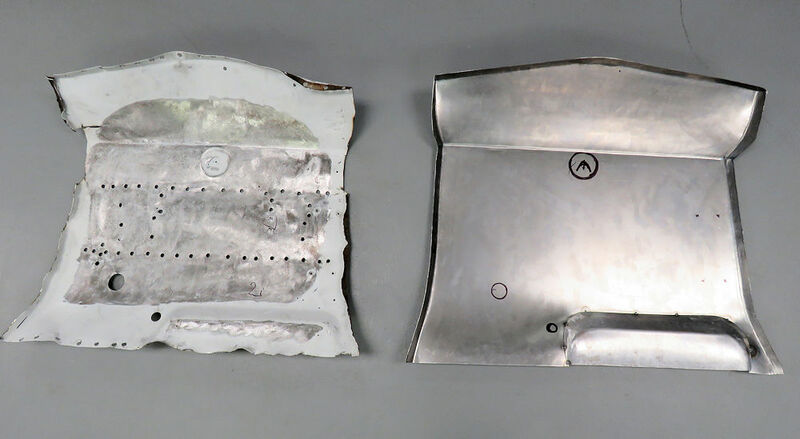 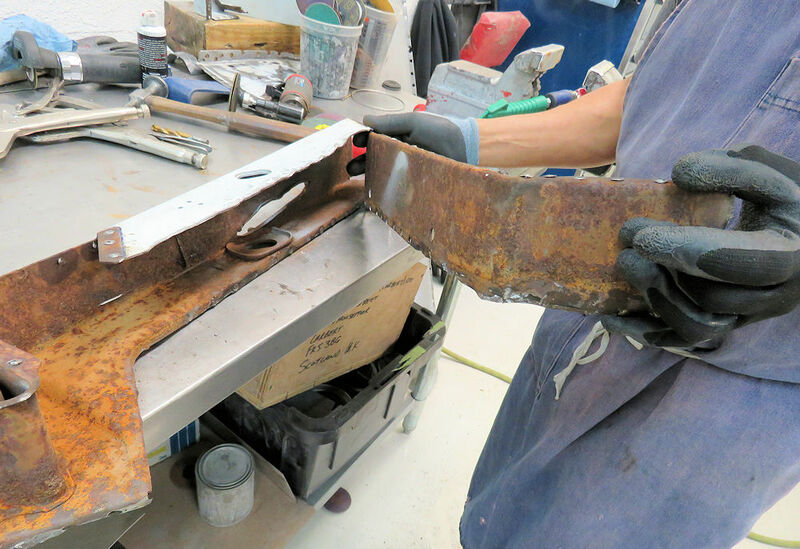 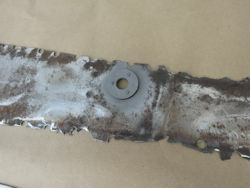 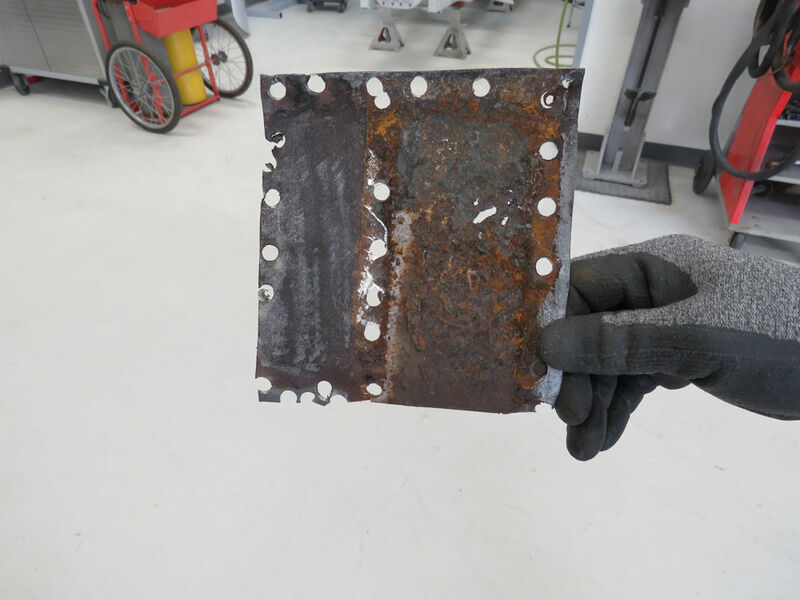 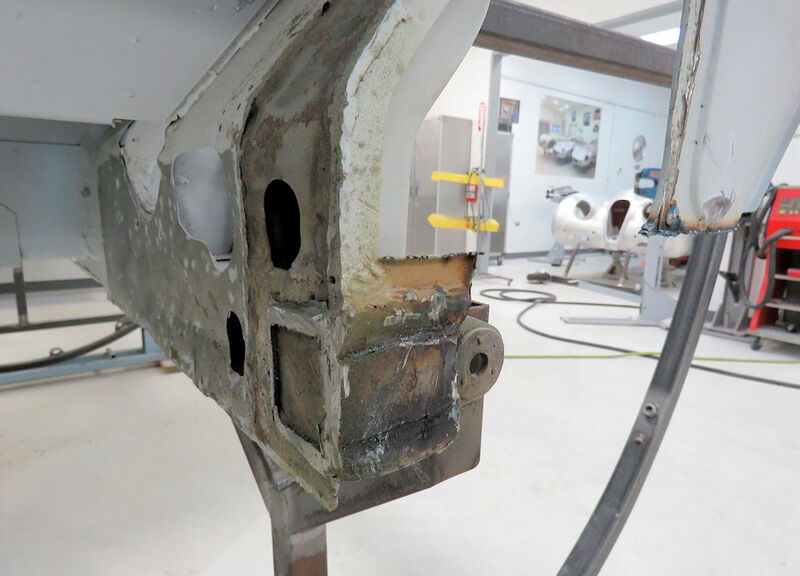 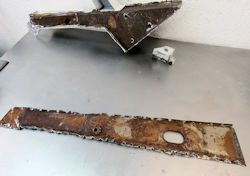 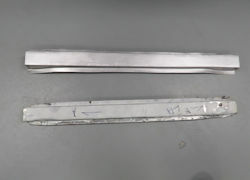 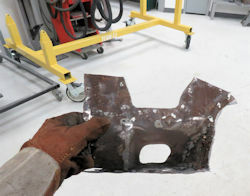 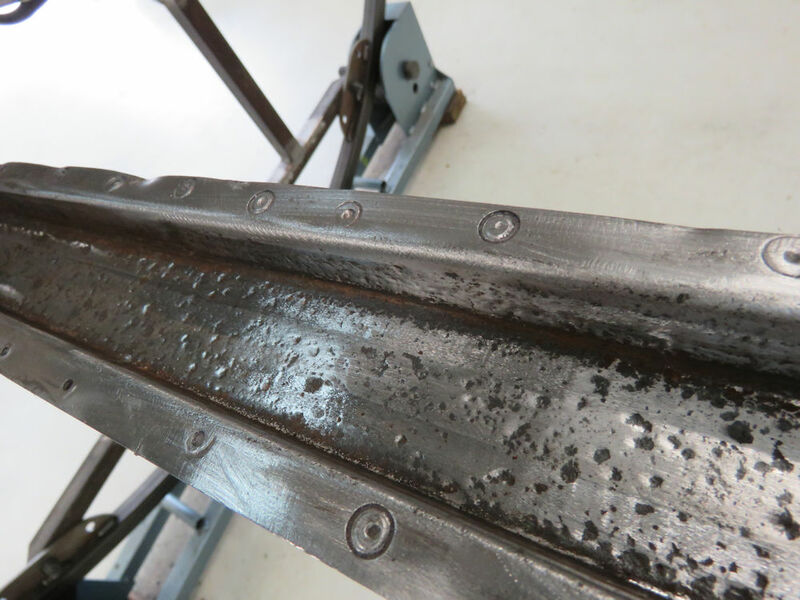 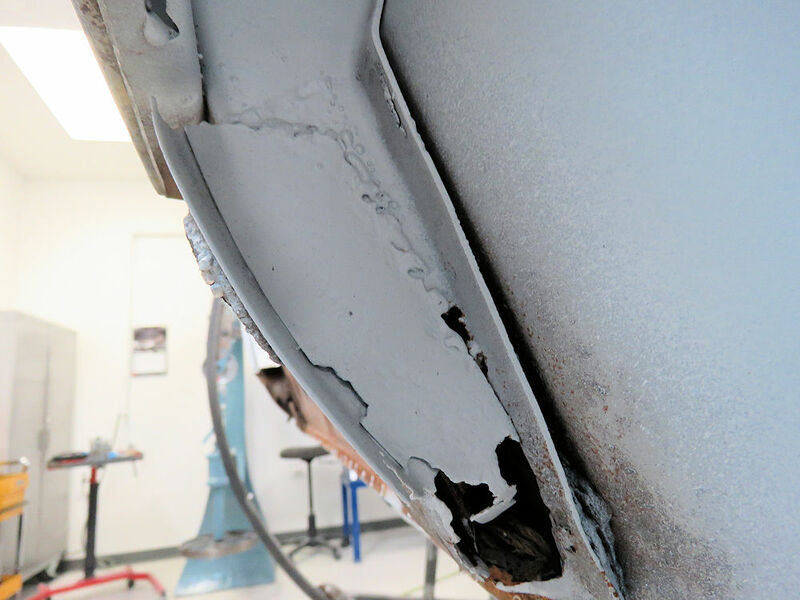 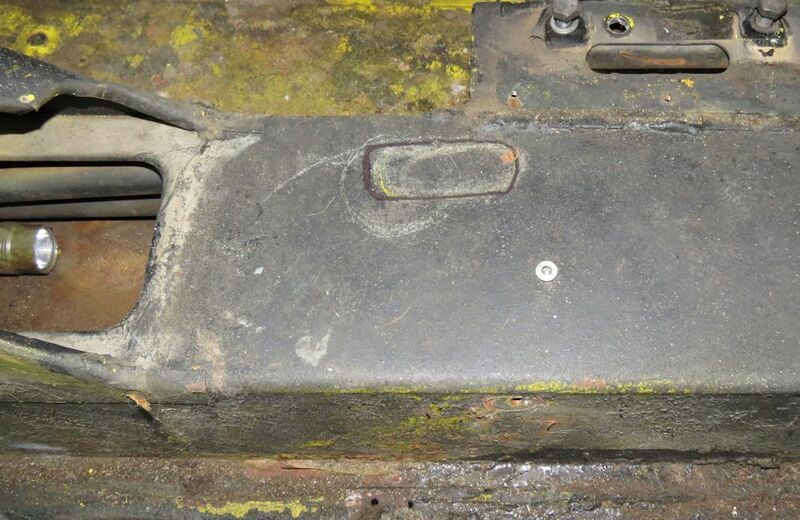 Some of this crude welding may very well be the result of restoration work performed prior to the car coming into our hands, although I suspect much of it dates back to the De Tomaso factory in 1971. 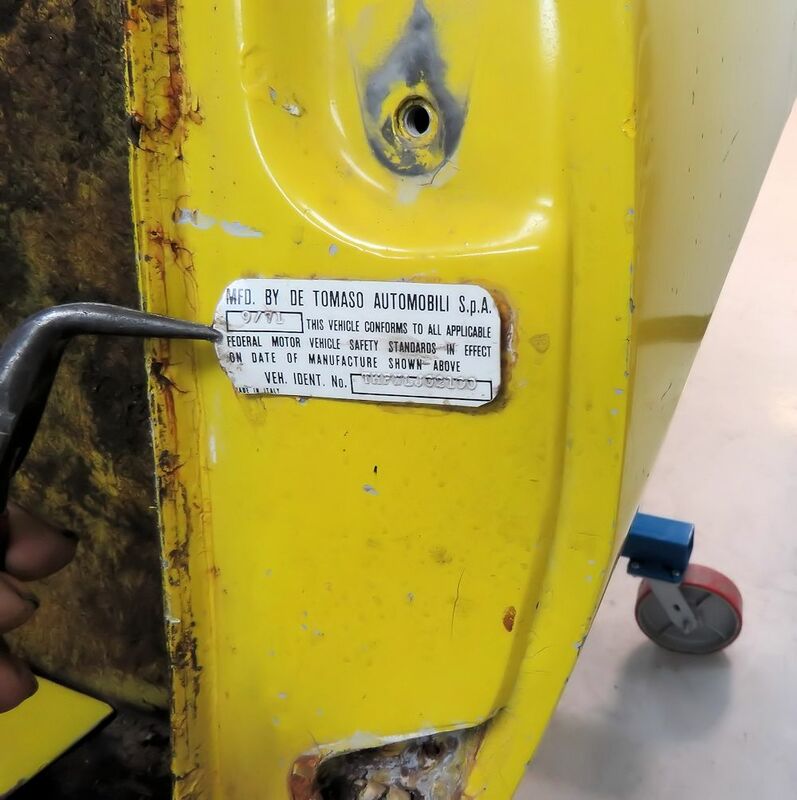 This welding may date to the De Tomaso factory? 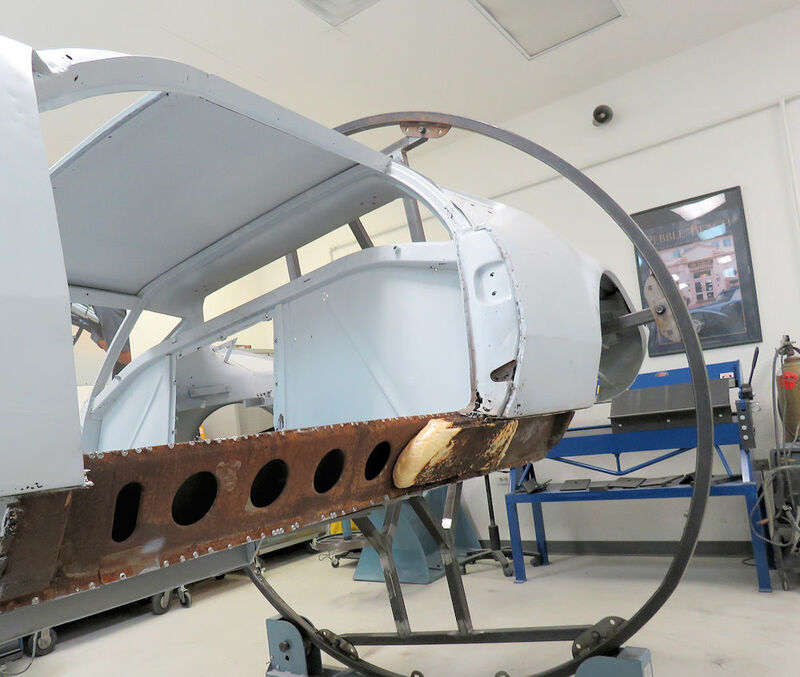 We are thrilled to have been chosen for this important restoration project. 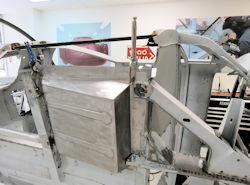 Oscar has already finished preparing the car for media blasting, which is scheduled to take place in the next few days.